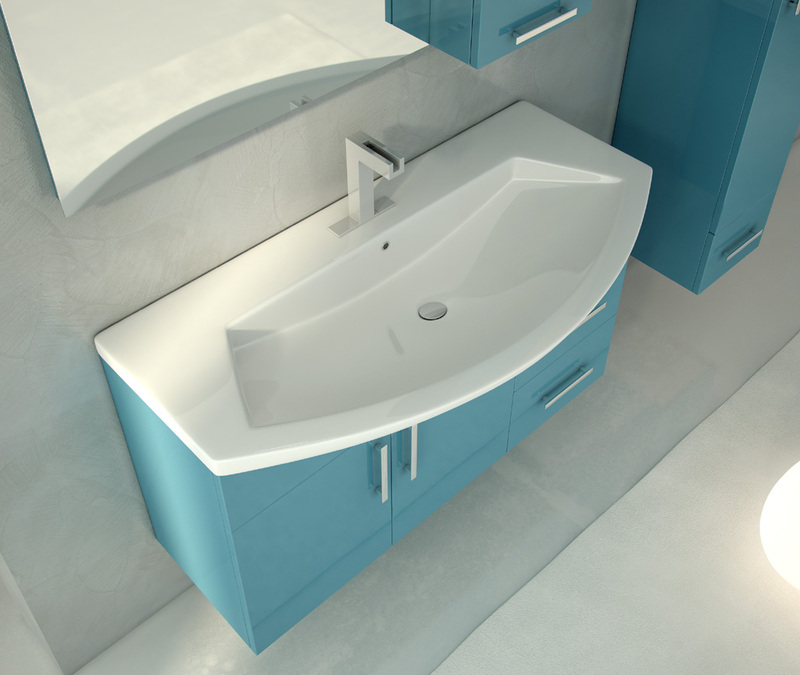 Evolve your space, evolve your bath. 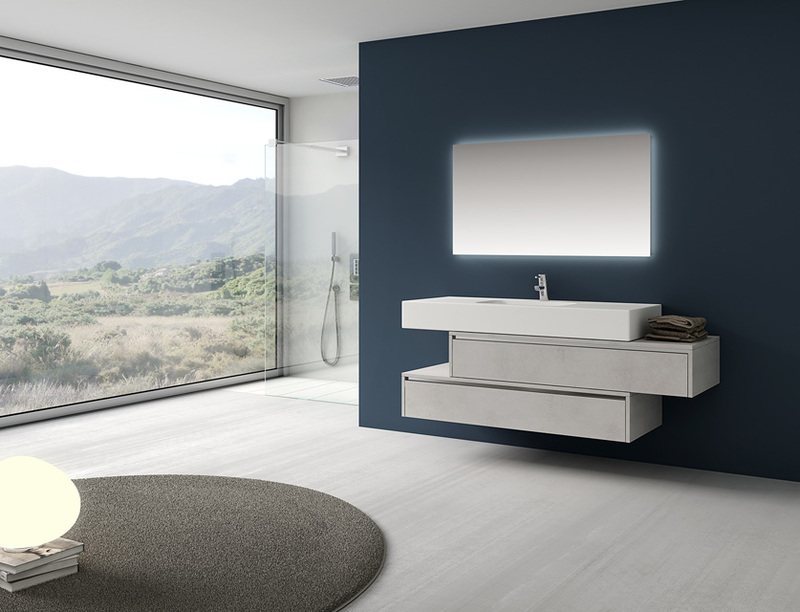 Disegno Bagno, with its new FLY 2.0 collection, refresh its entire look and launch the new production full of new features: new-generation HPL and Unicolor top, with materics effects, bring the collection in a higher level, and give the opportunity to create a custom-made bathroom. 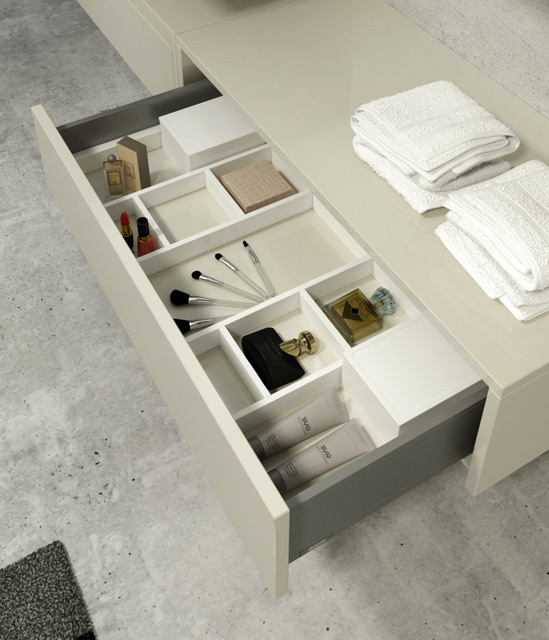 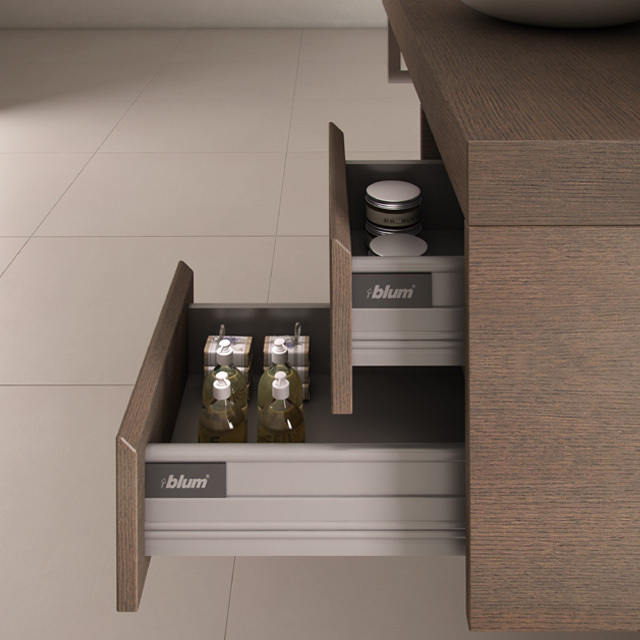 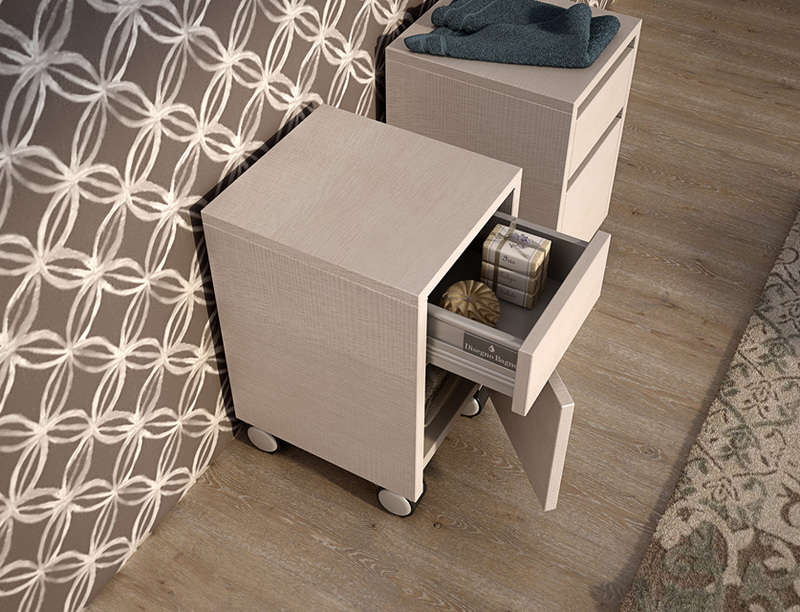 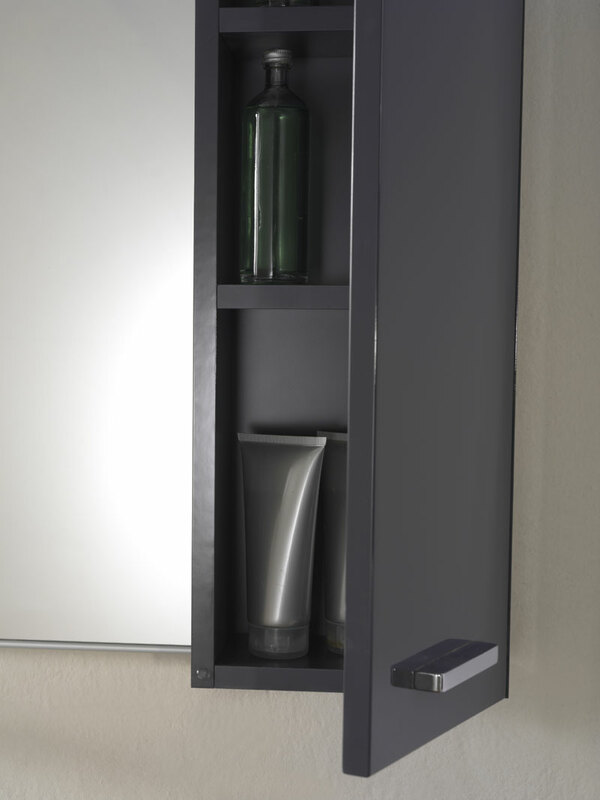 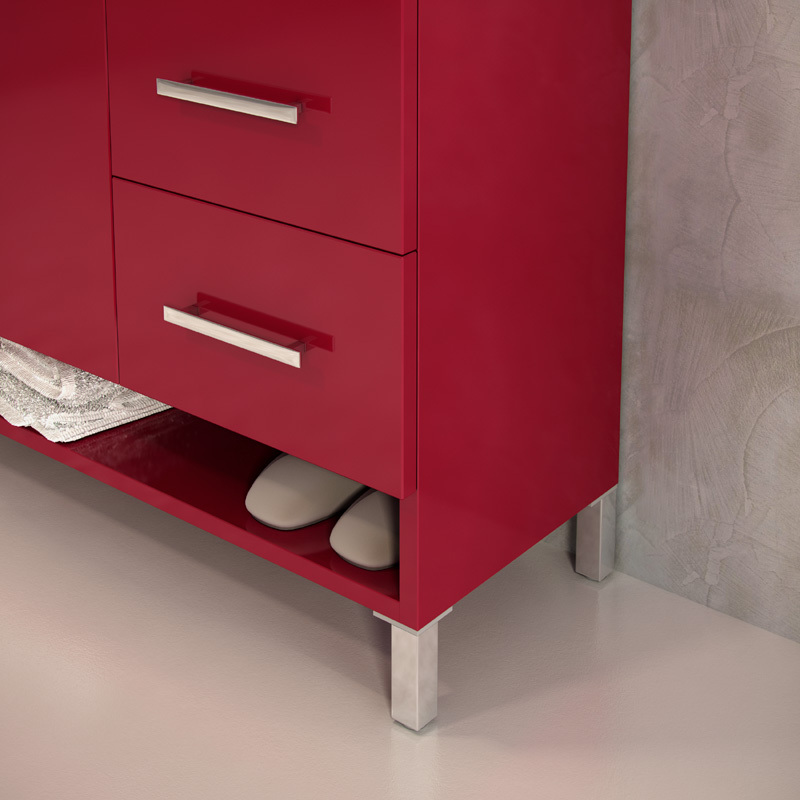 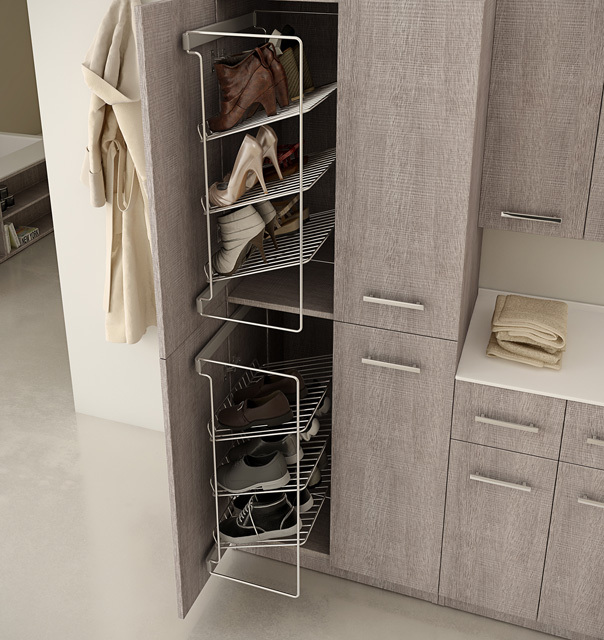 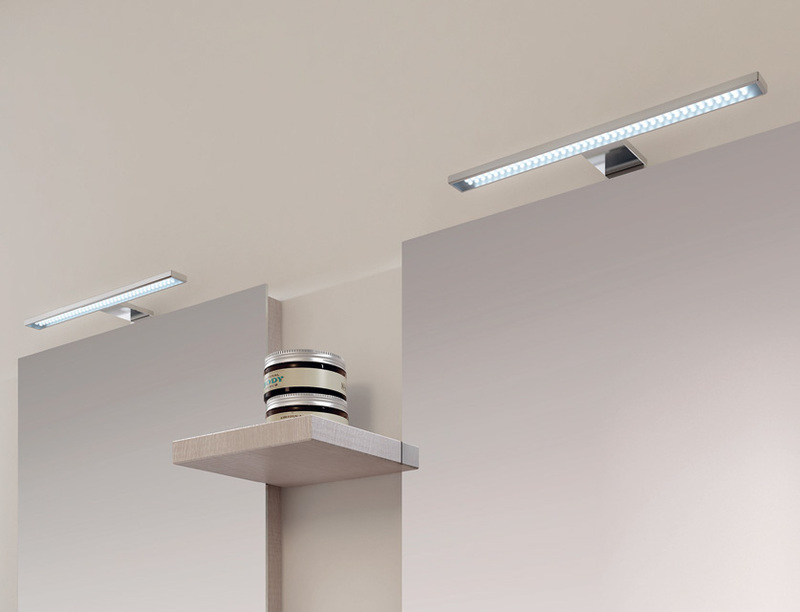 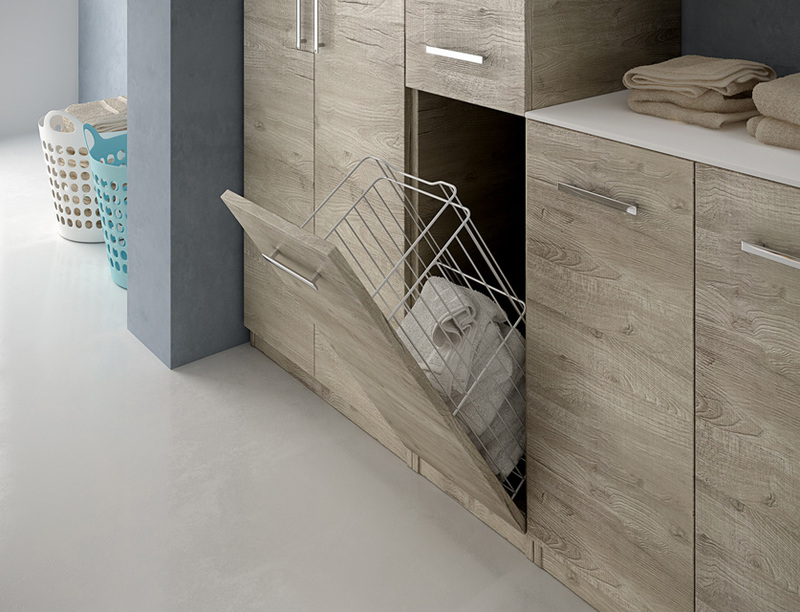 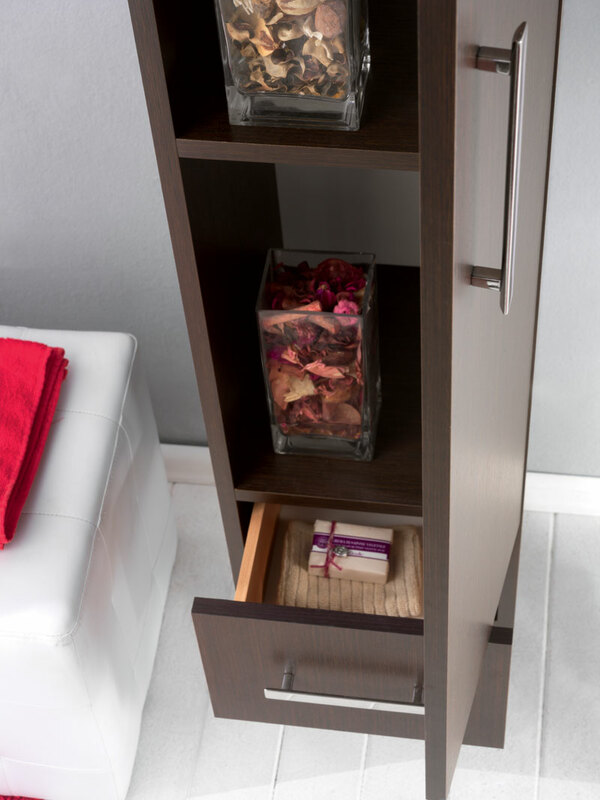 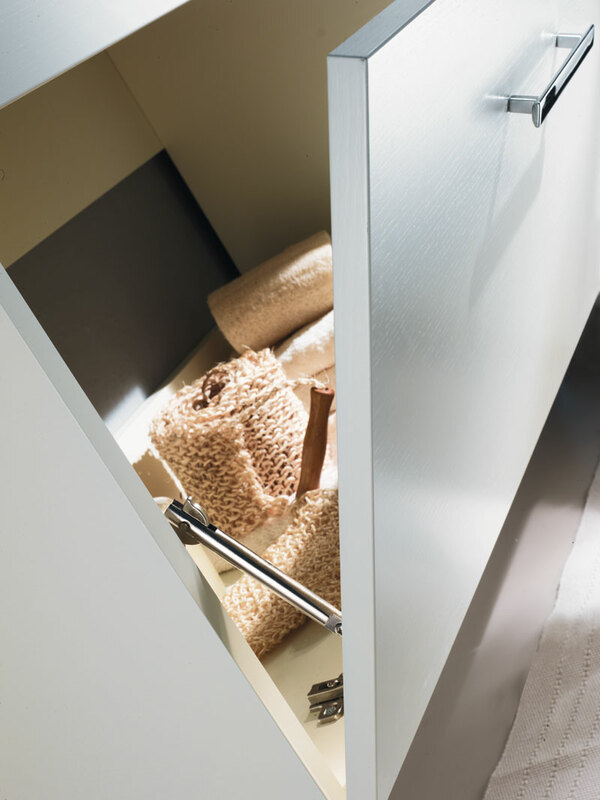 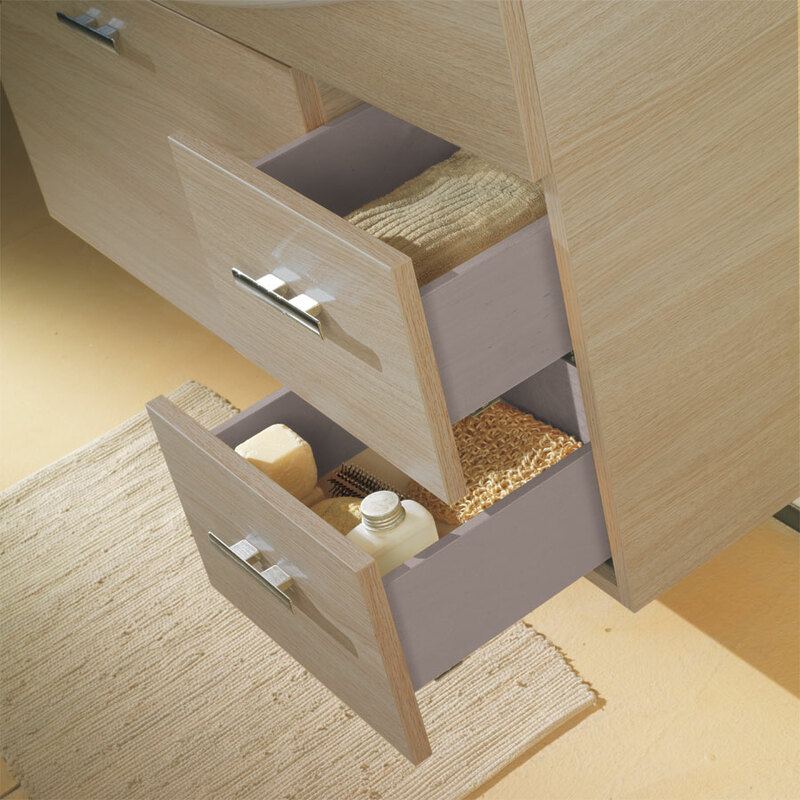 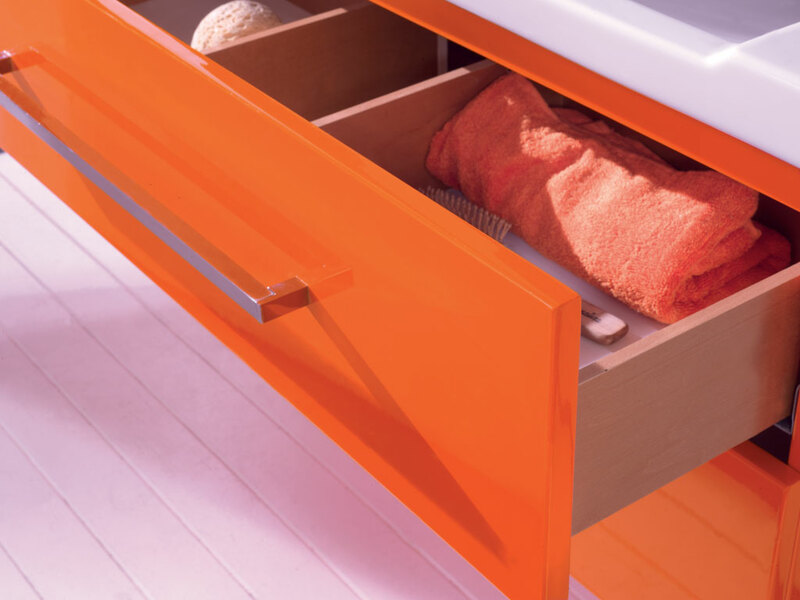 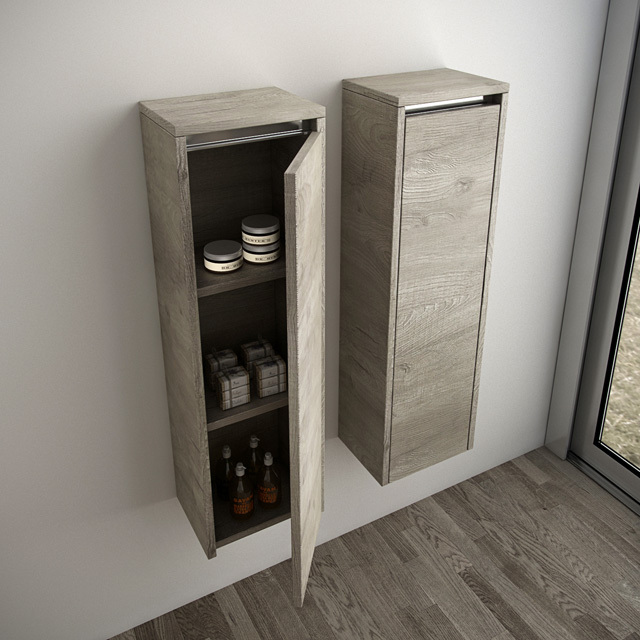 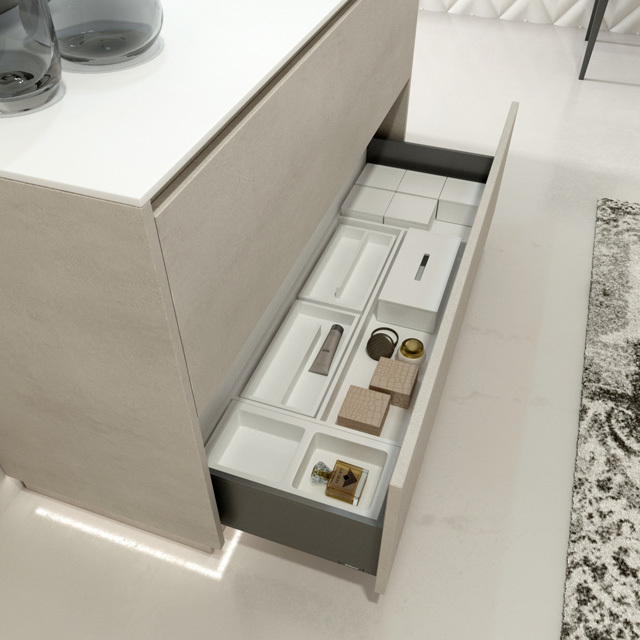 New blum telescopic guides, more elegant and resistant,could host inside the drawer, useful boxes where is possible put every items of your bath. 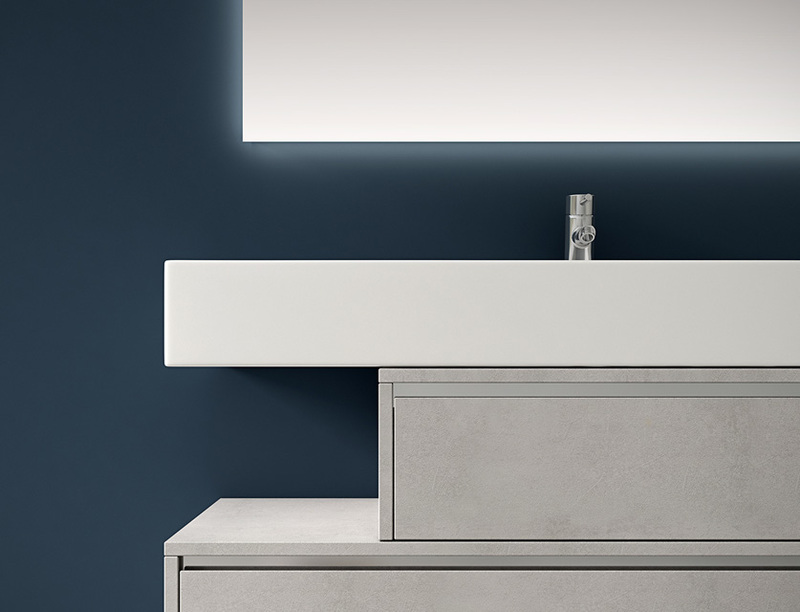 New slim-handle give a new touch of elegance without affects the essential and clean design that distinguishes Disegno Bagno modern productions. 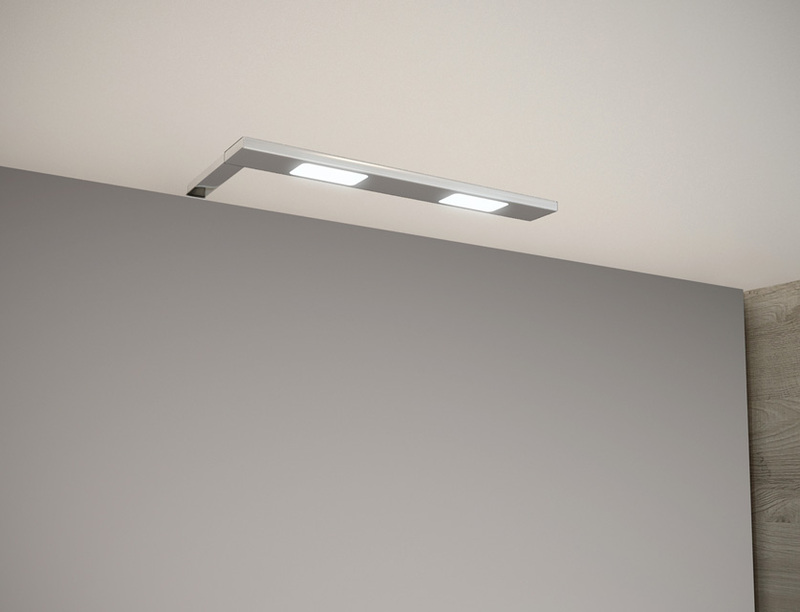 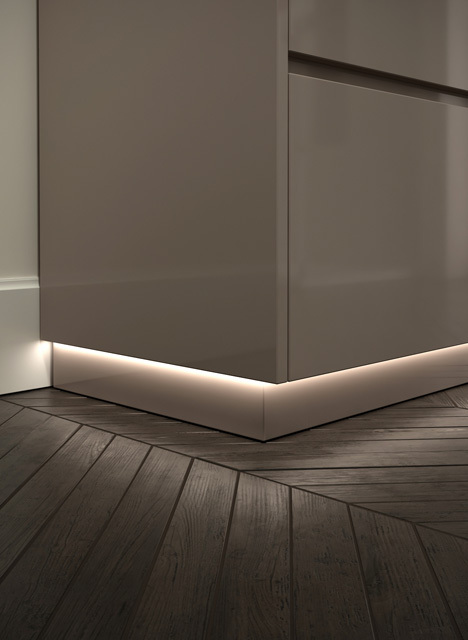 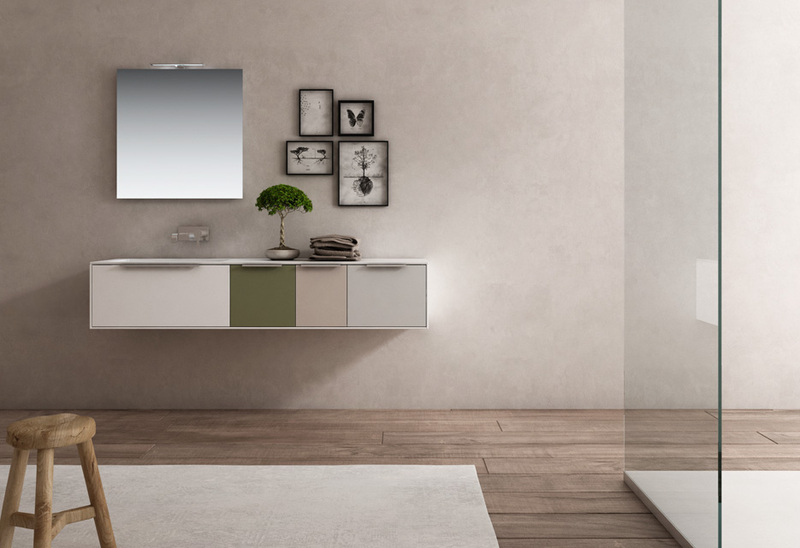 Finally, on floor-compositions, it could be possible add on the wooden plinth, a led lights with volumetric power that complete your bathroom. 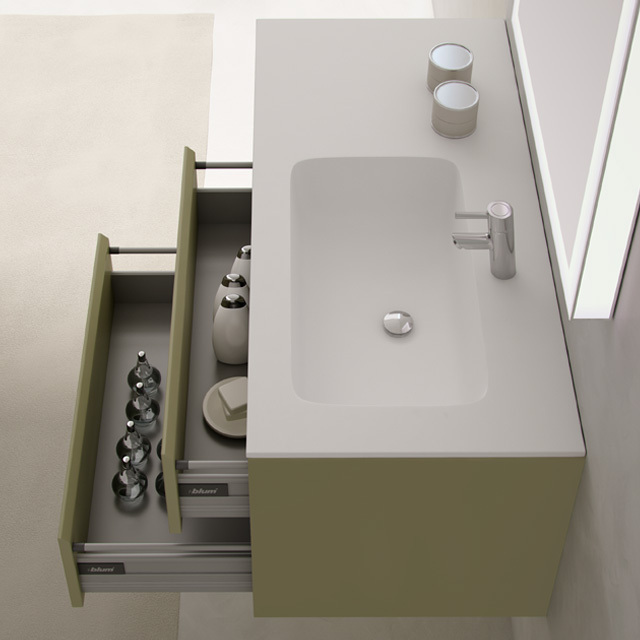 FLY 2.0, evolve your space, evolve your bath. 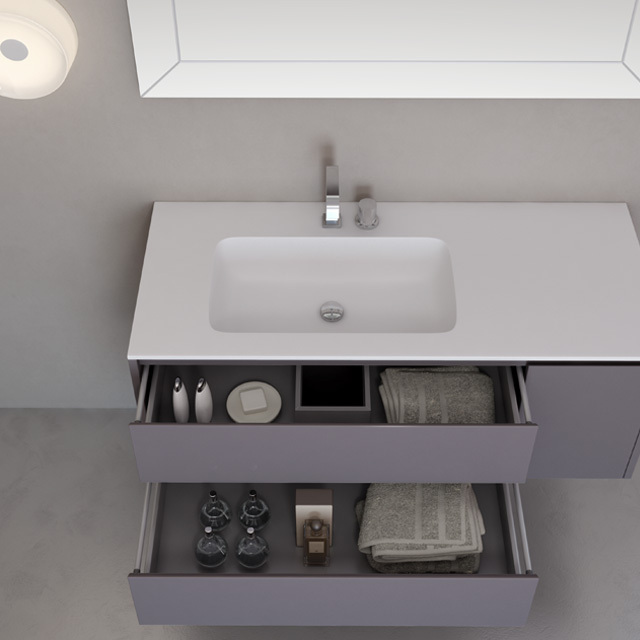 Clean and essential shapes made of each size. 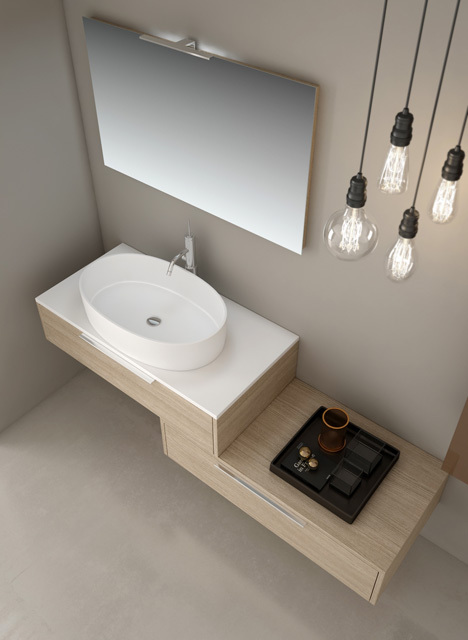 With the Stonelight’s top technology, Absolute could be made of each size, finalized to have a practice and an useful bathroom. 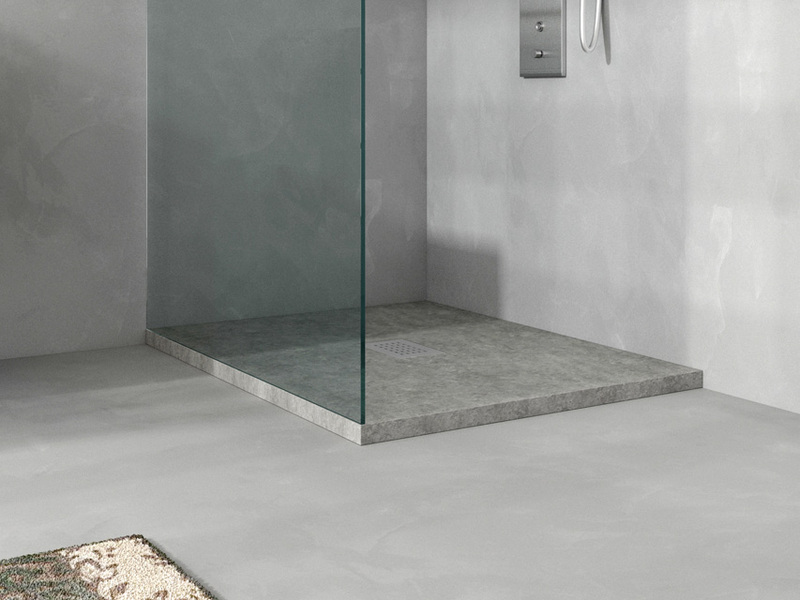 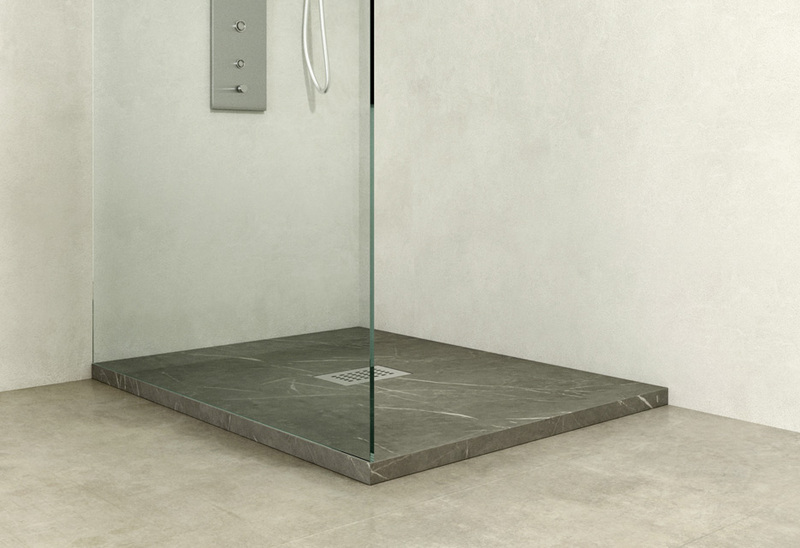 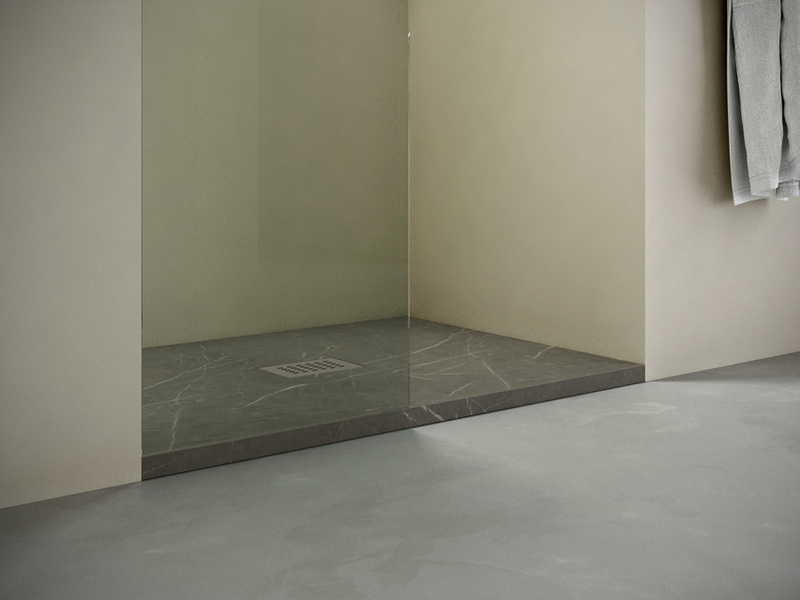 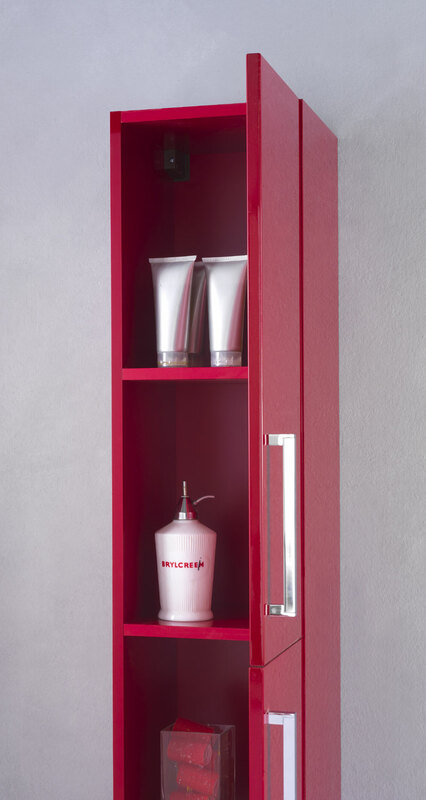 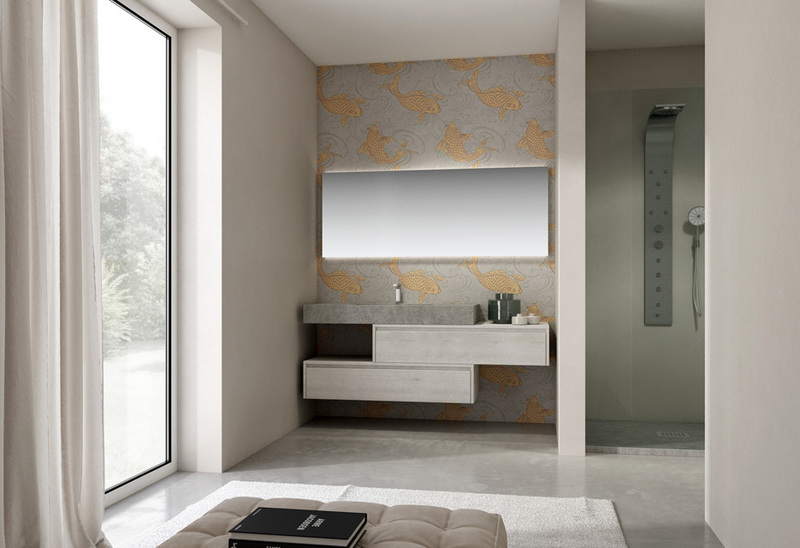 The new Tranchè grigio roccia version, give another choice to design the bathroom with style and quality. 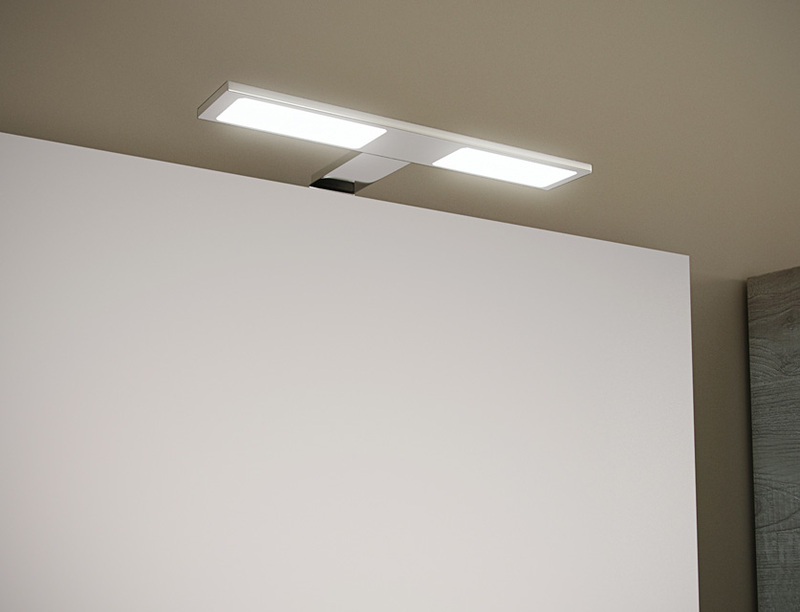 The new cm. 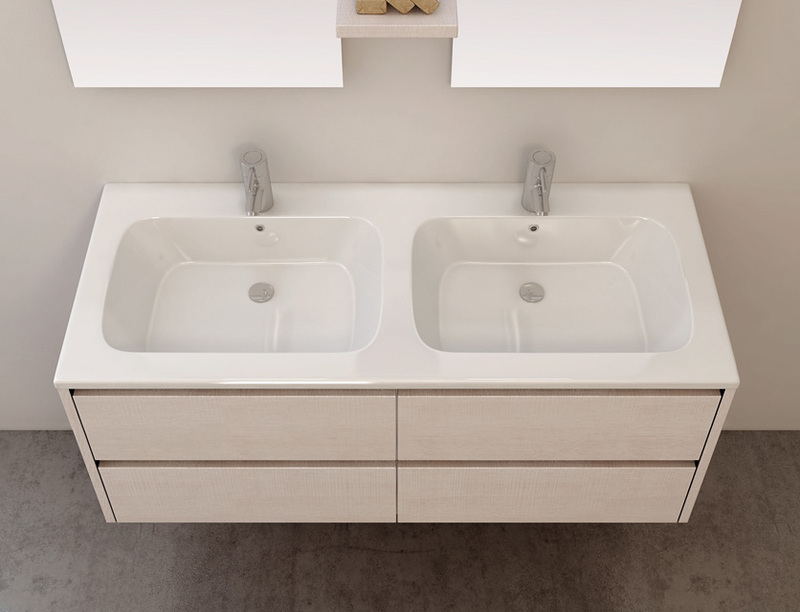 106 decentralized ceramic tops on the left and on the right, allow to manager every space as better as possible. 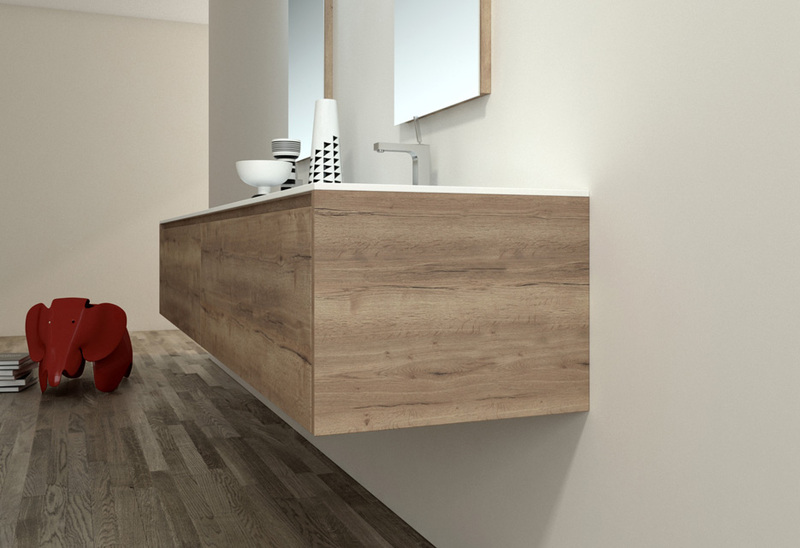 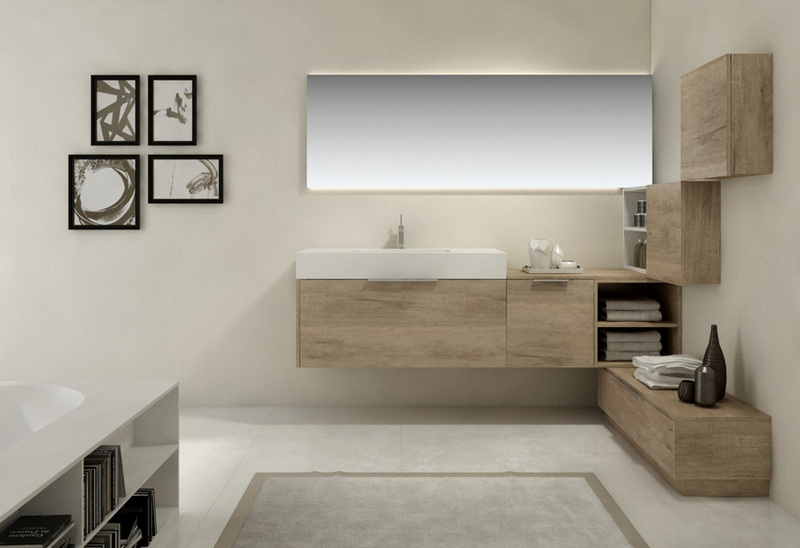 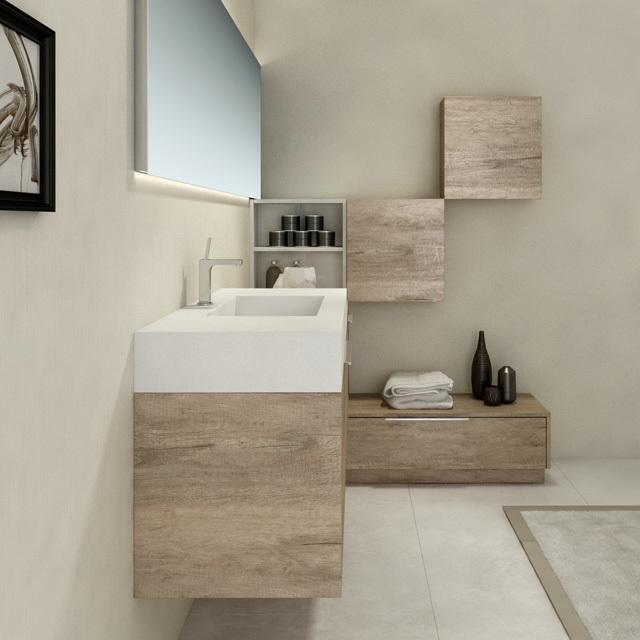 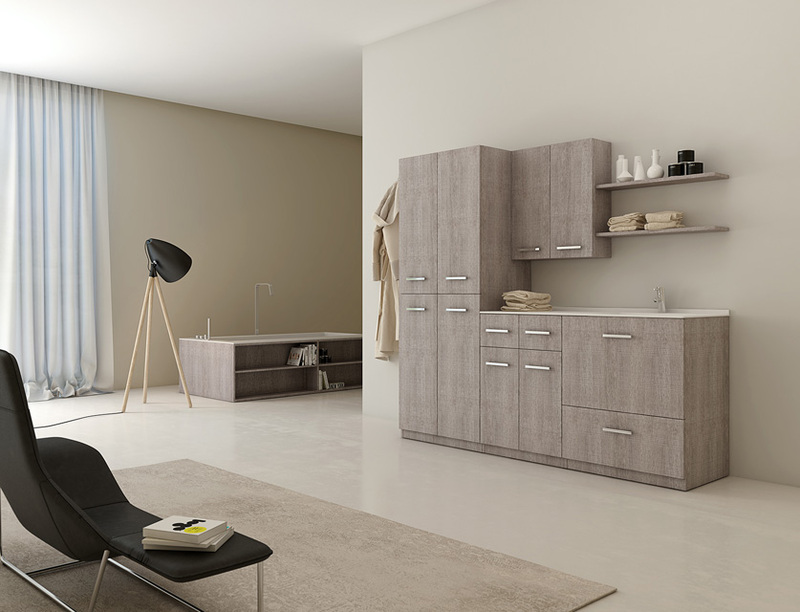 Absolute has a new colour, Sherwood Dorè, a new laminate wood that offer a new choice to design the bathroom. 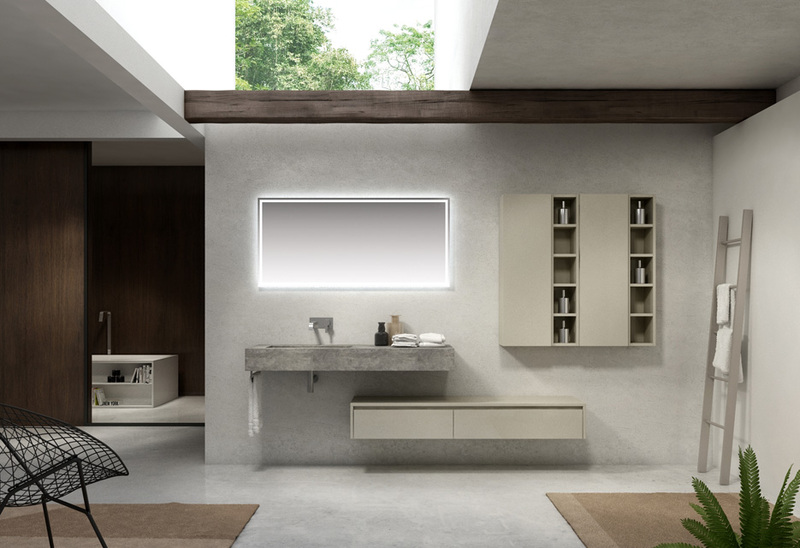 With the new stonelight cover top and the washbasin made with the same material, Disegno Bagno give new elegants and stylist solutions, to have an inimitable room. 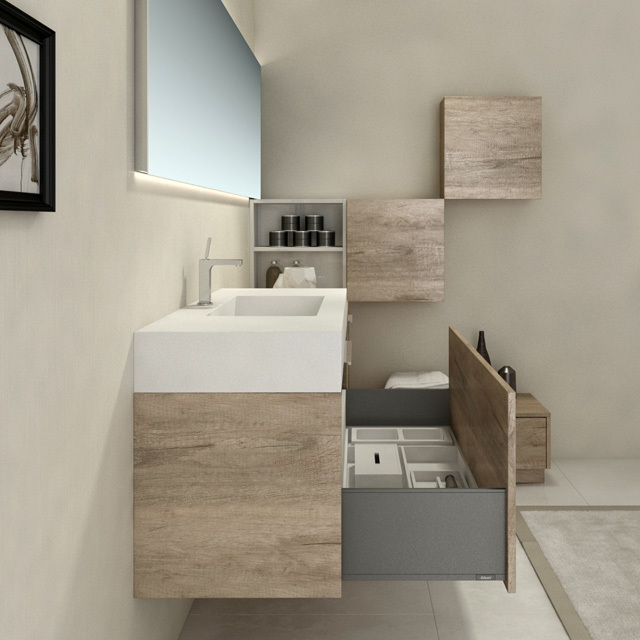 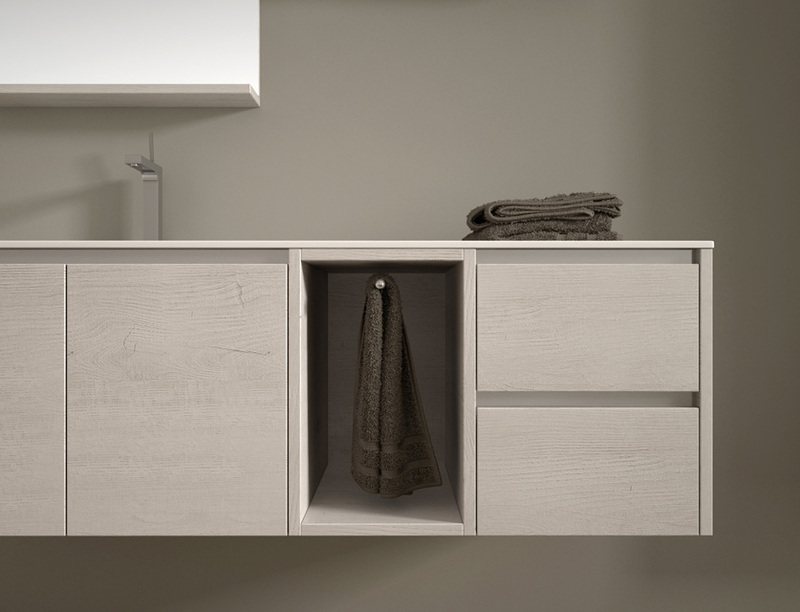 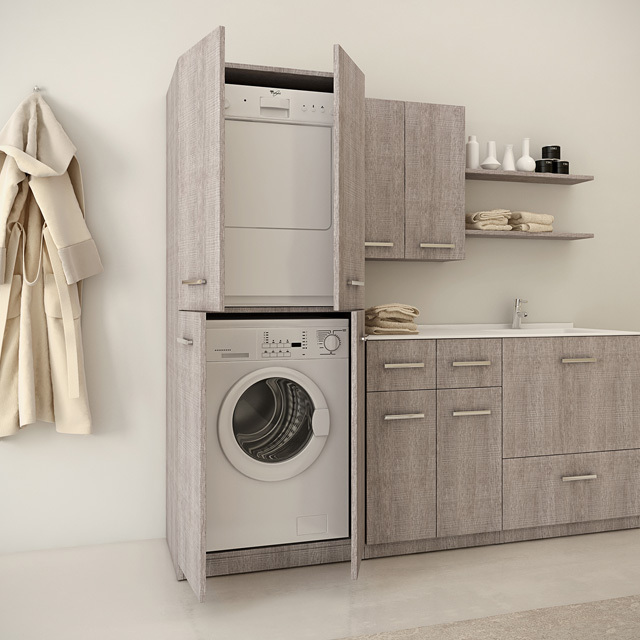 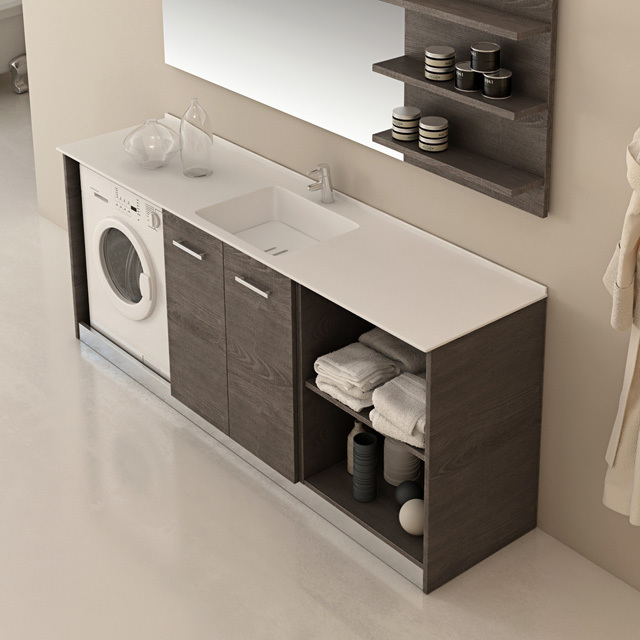 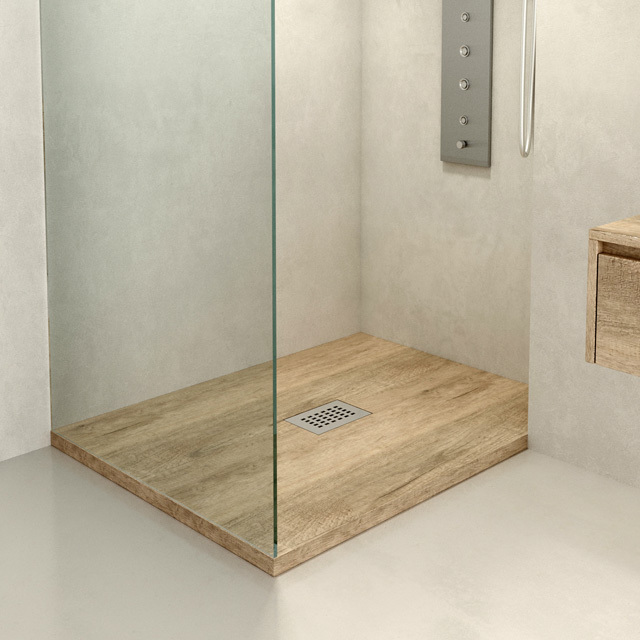 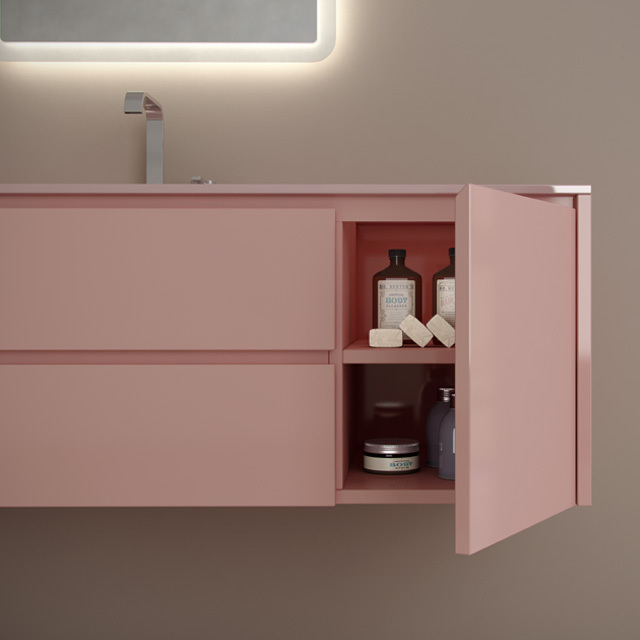 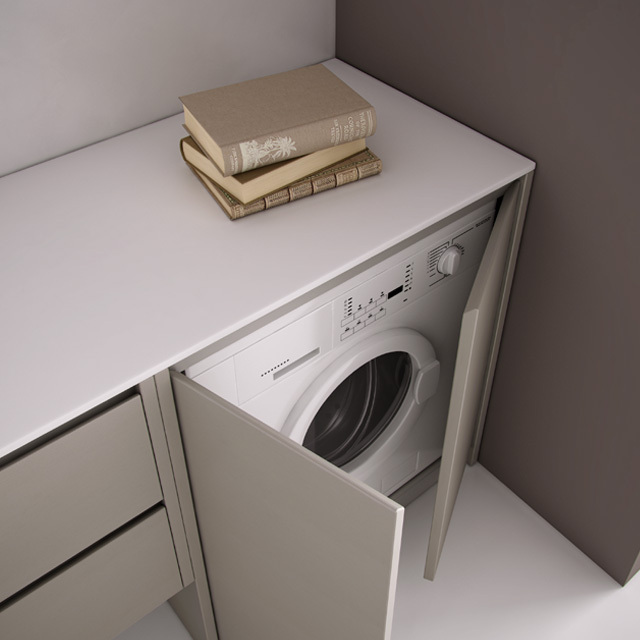 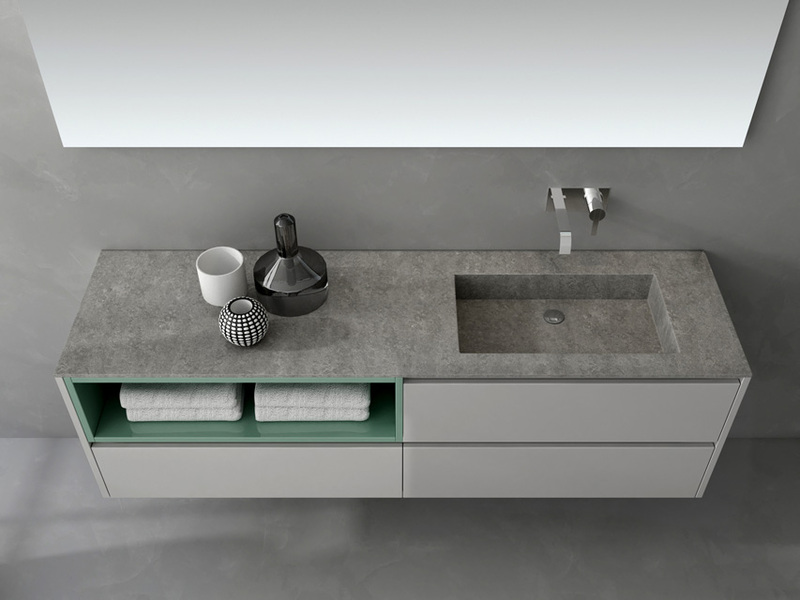 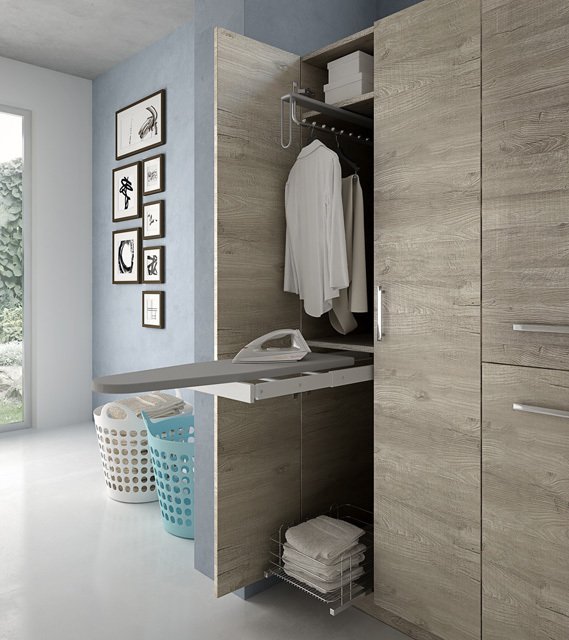 Absolute Smart is a collection that is still in evolution: its wooden colours are in tuning with the modern coatings; it's possible to create the personal laundry, with the stonelight top with integrated washbasin with an internal thickness, that solves every space problem in the bathroom. 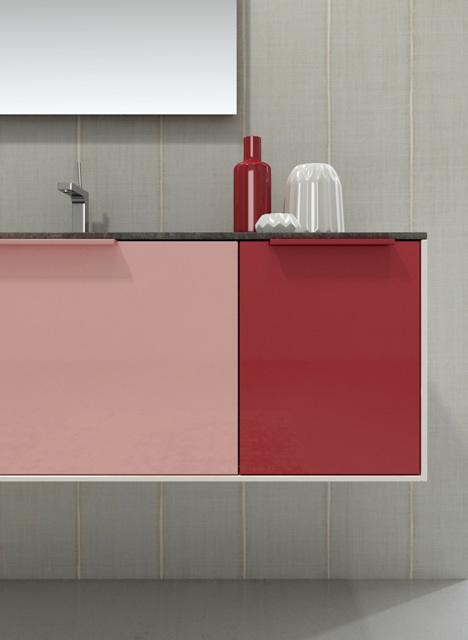 Clean and essential shapes, other special colours. 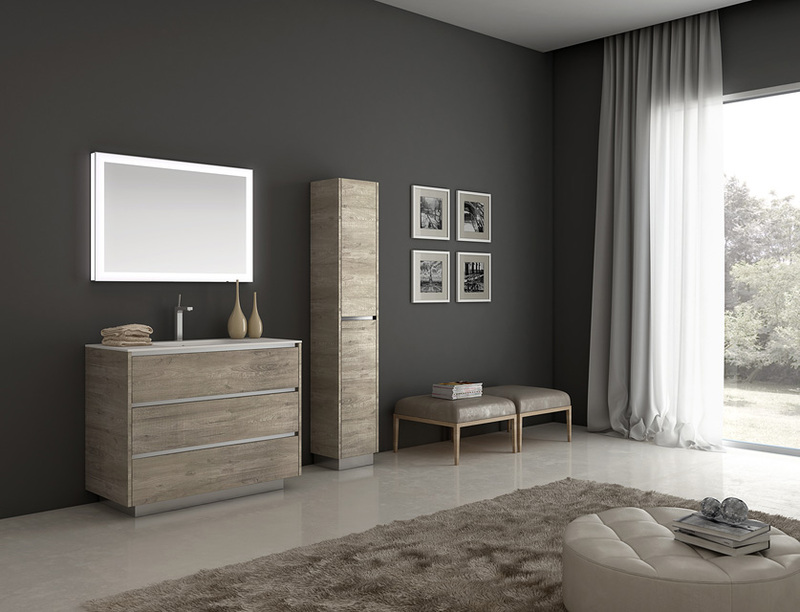 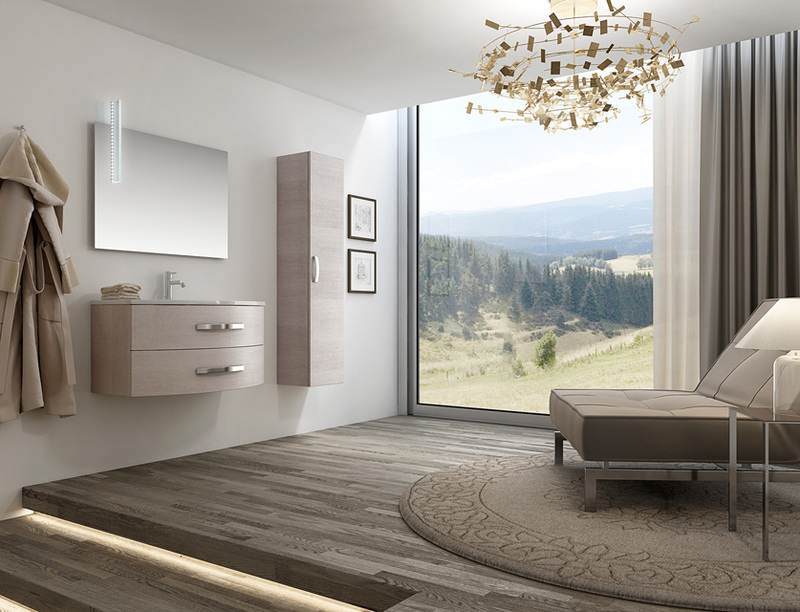 Absolute’s collection has got new finitures: are now available other four colours, Sherwood Grafite, Sherwood Montblanc, Sherwood Creta and Sherwood Cashmire, to give more choice of style to your own room. 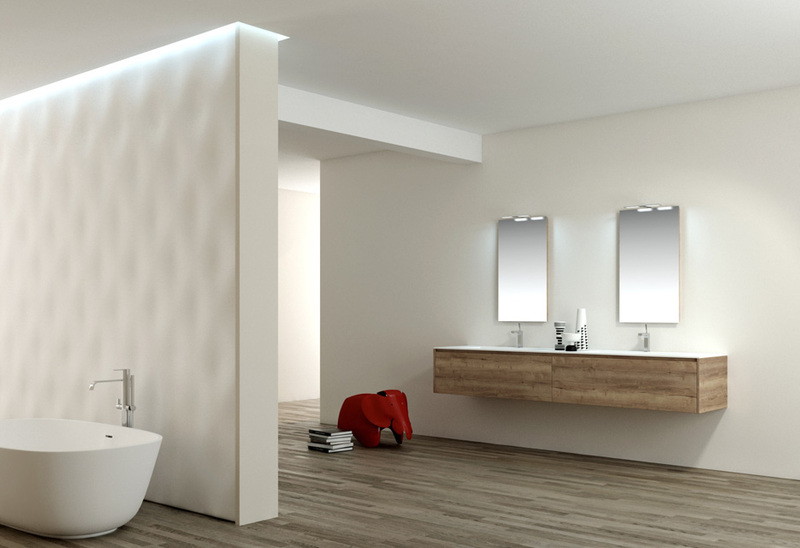 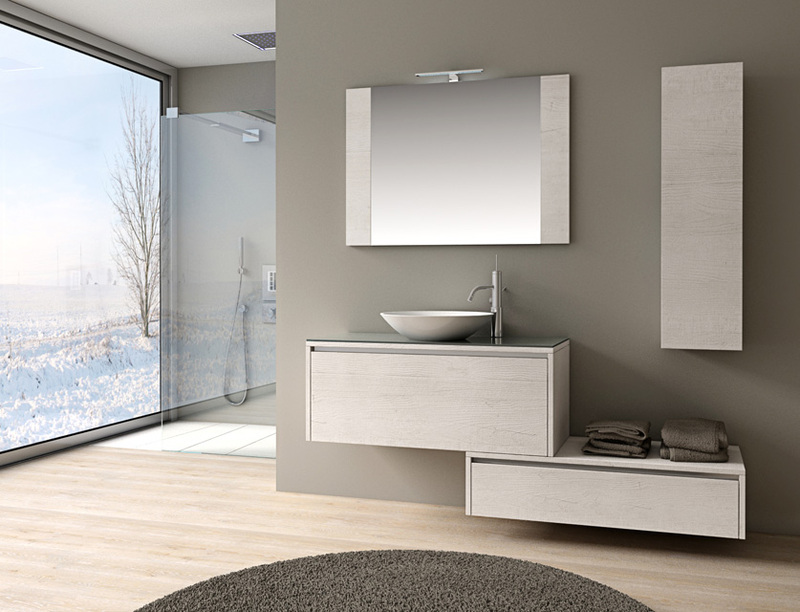 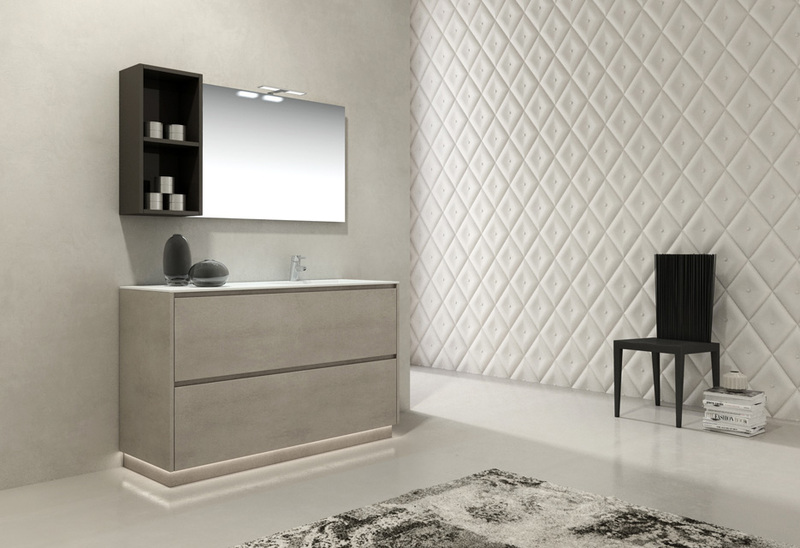 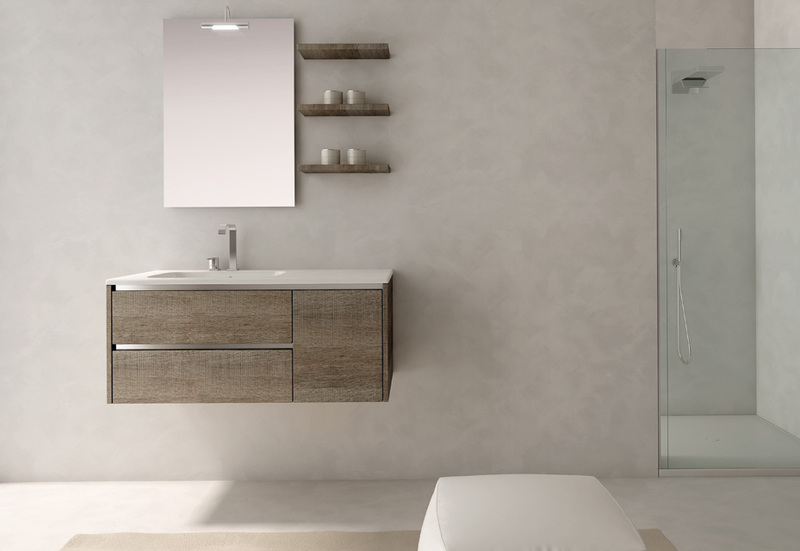 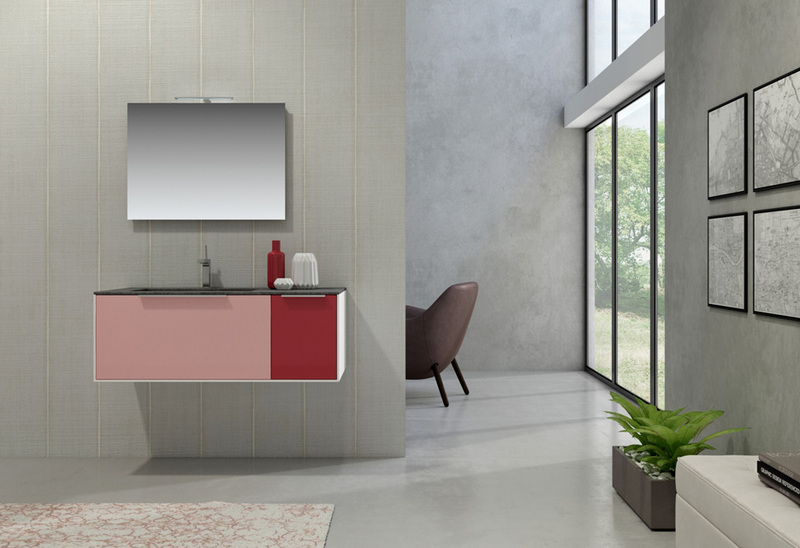 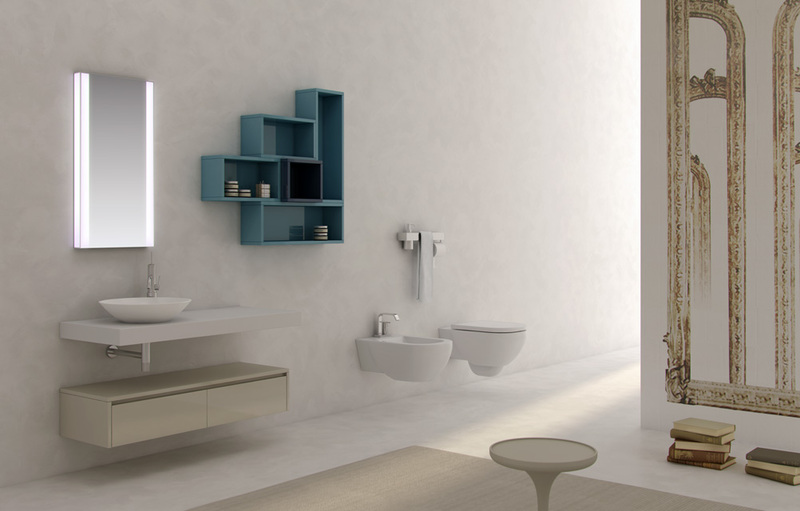 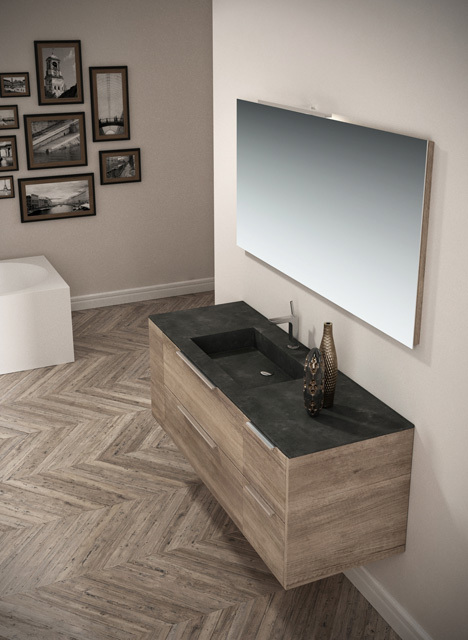 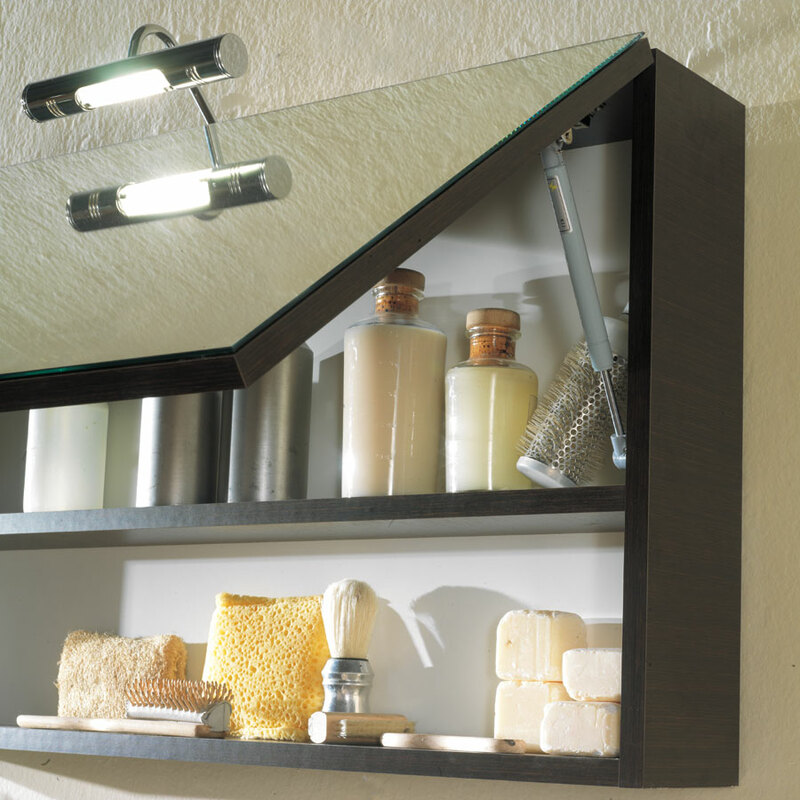 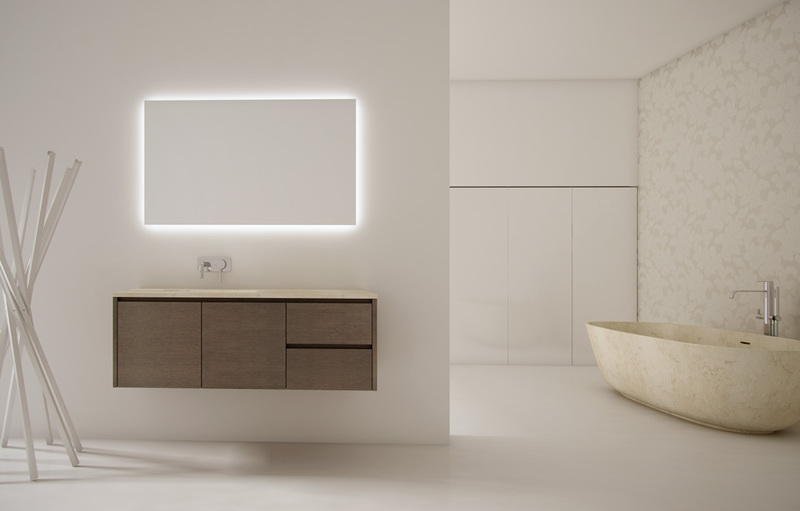 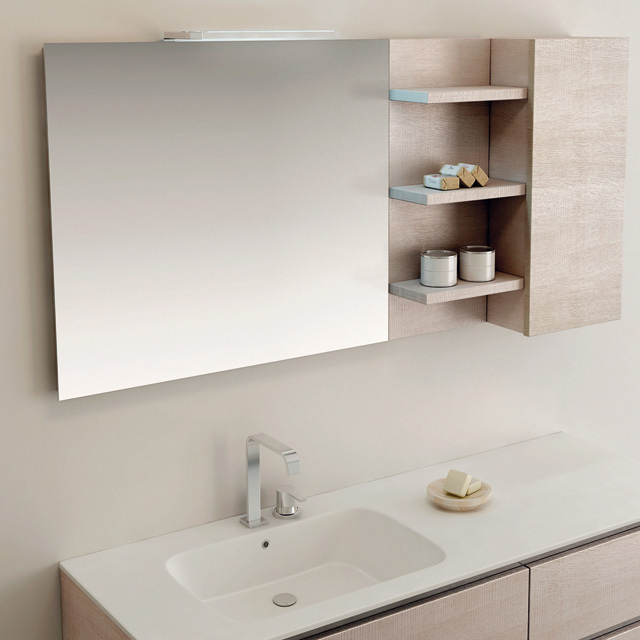 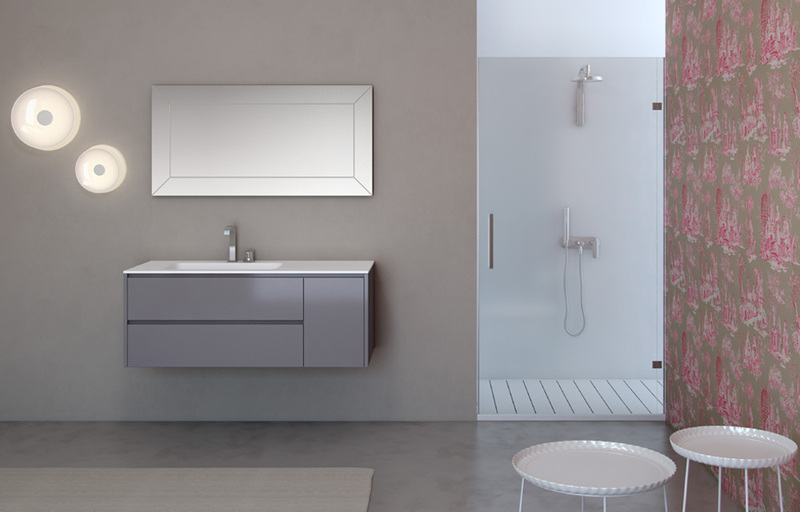 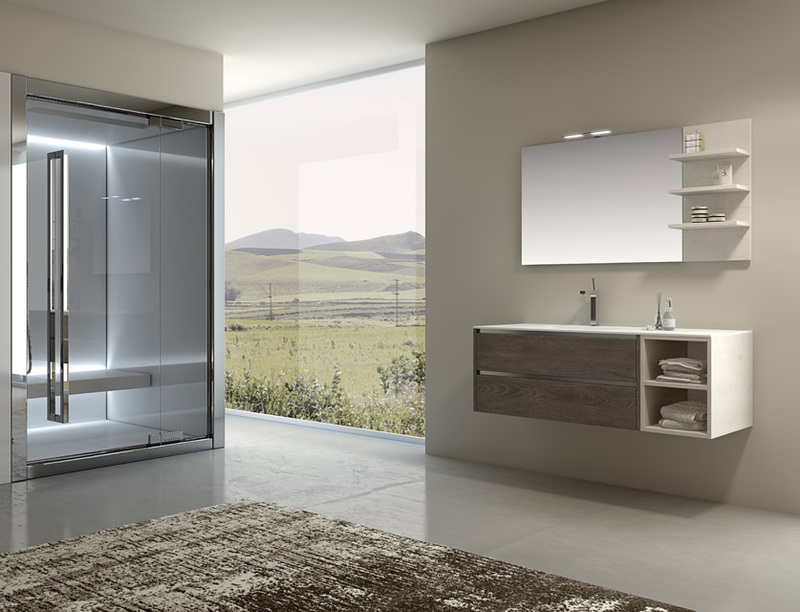 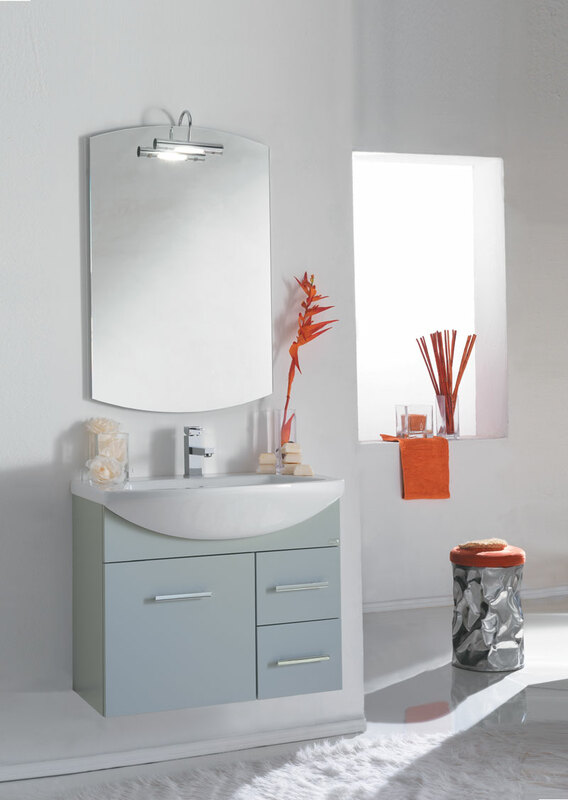 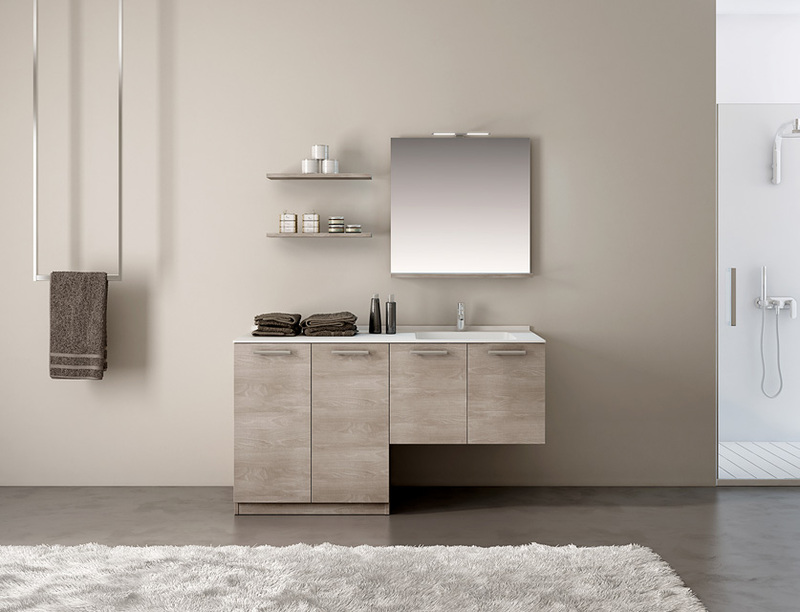 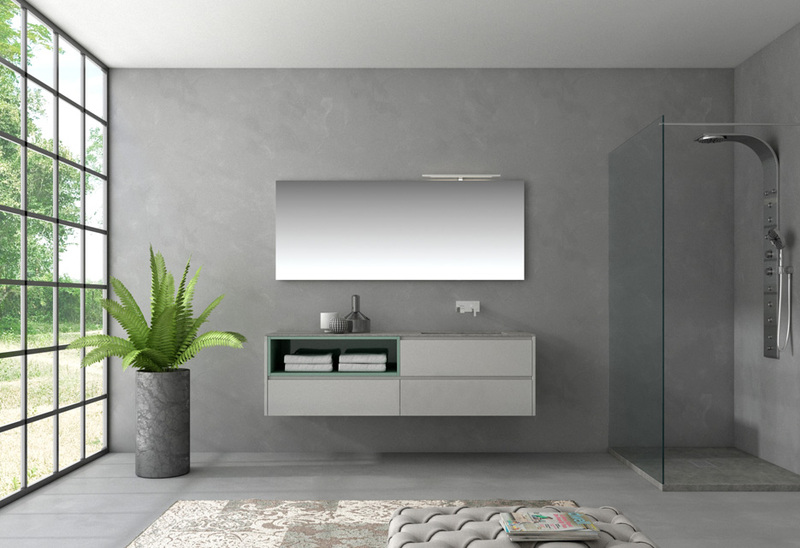 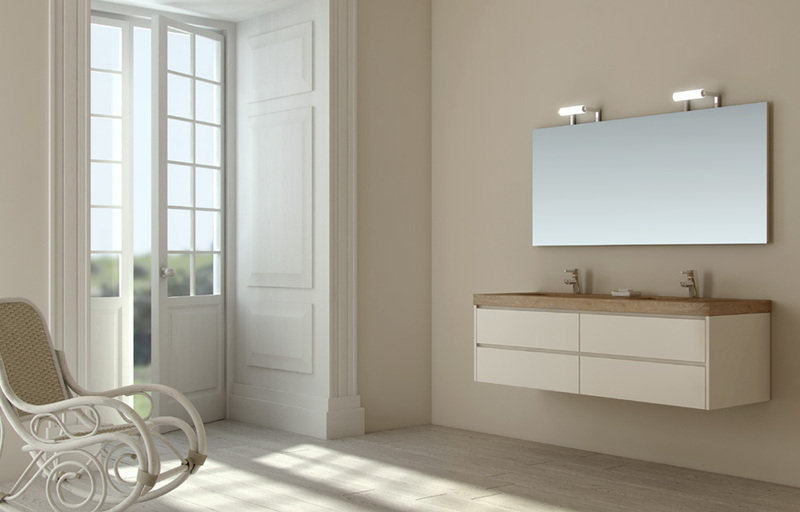 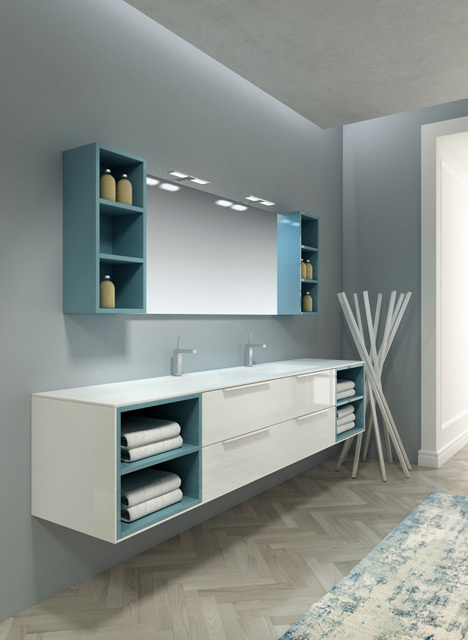 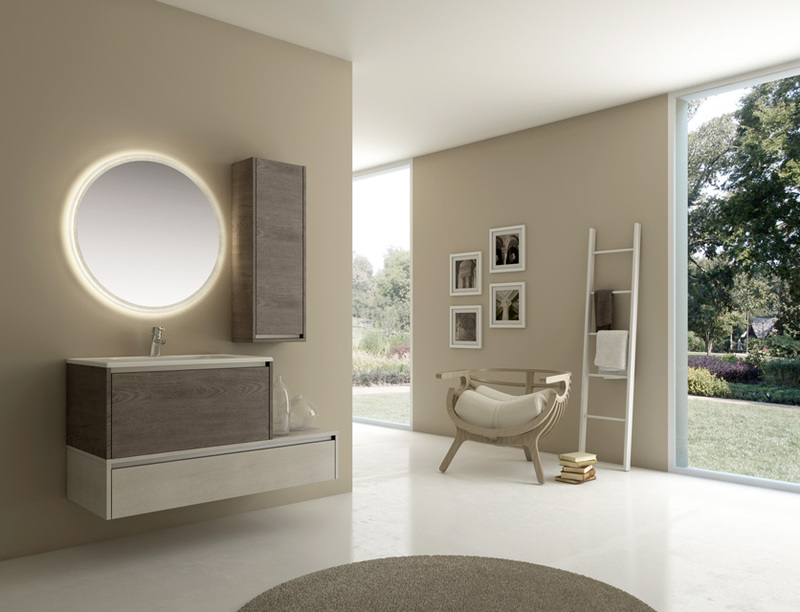 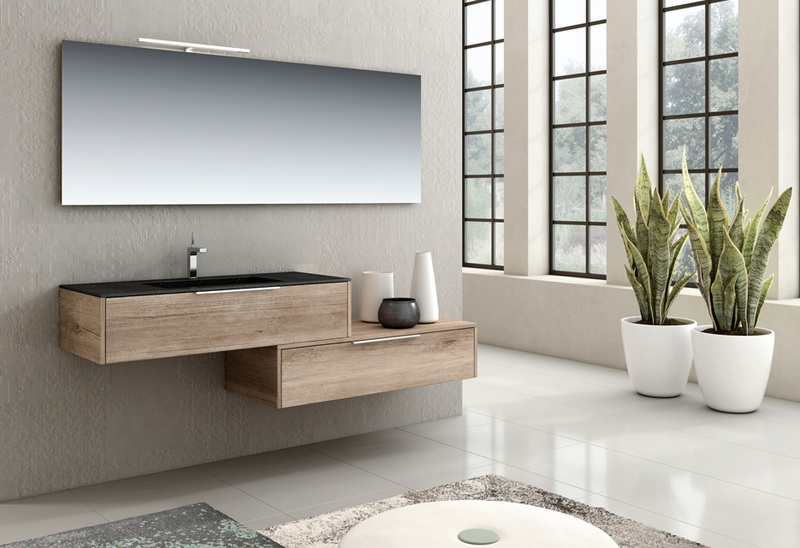 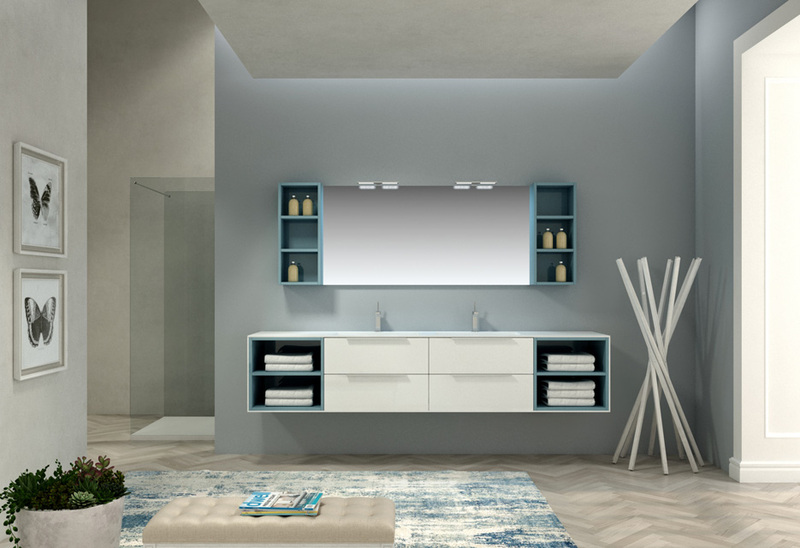 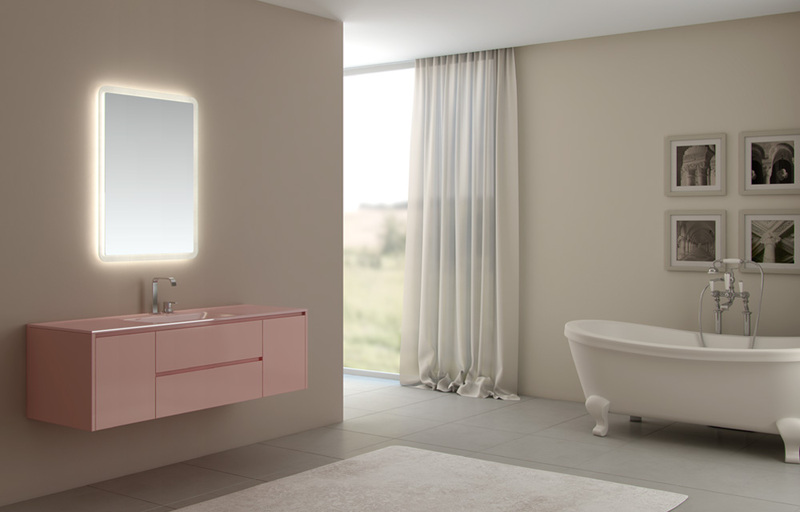 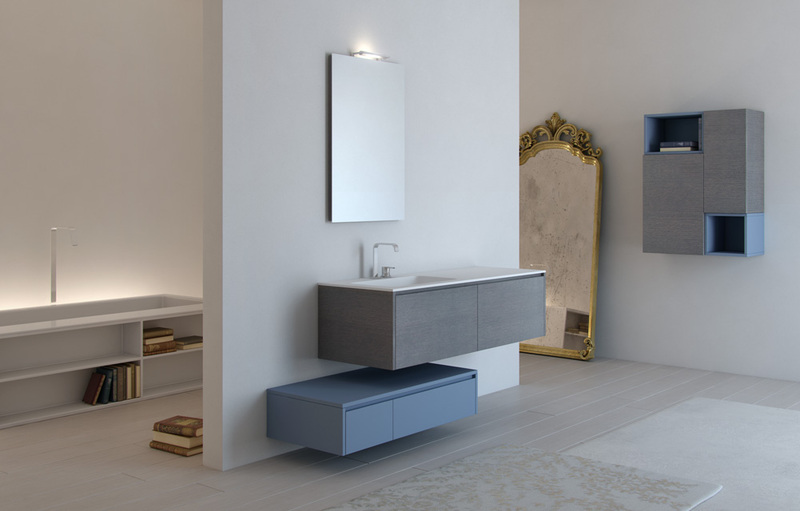 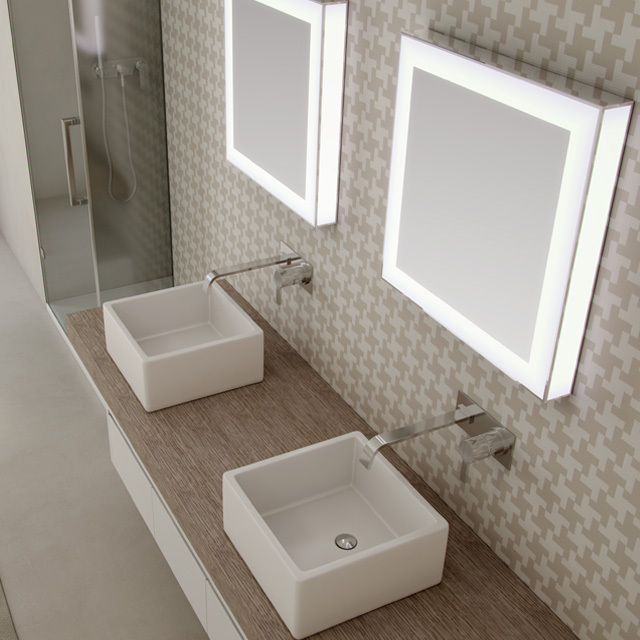 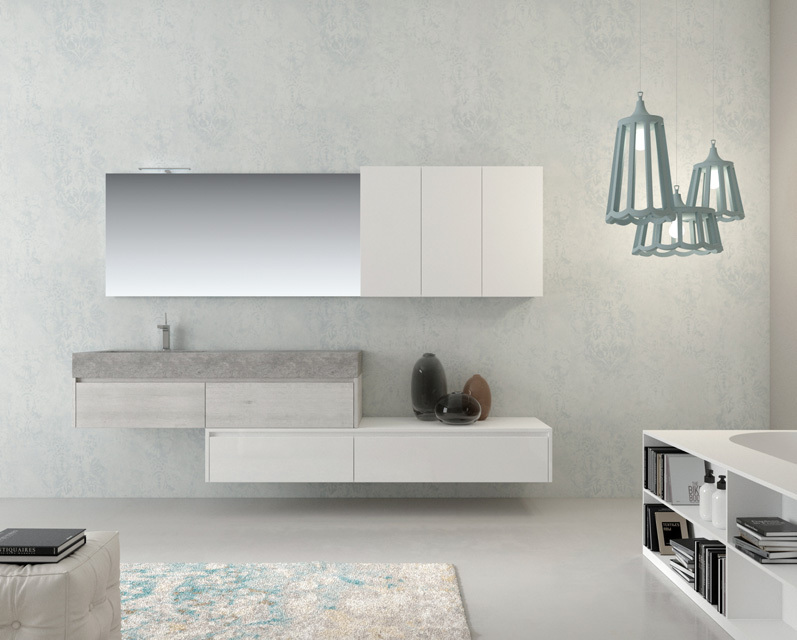 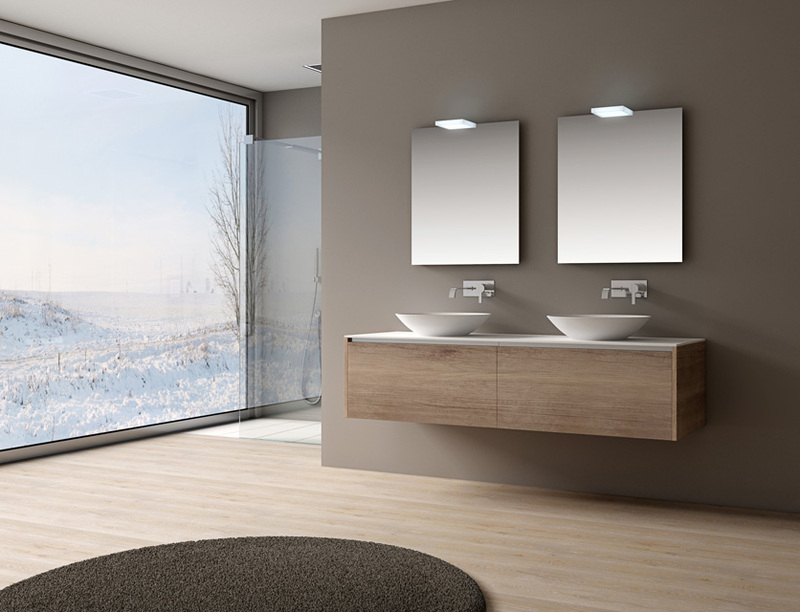 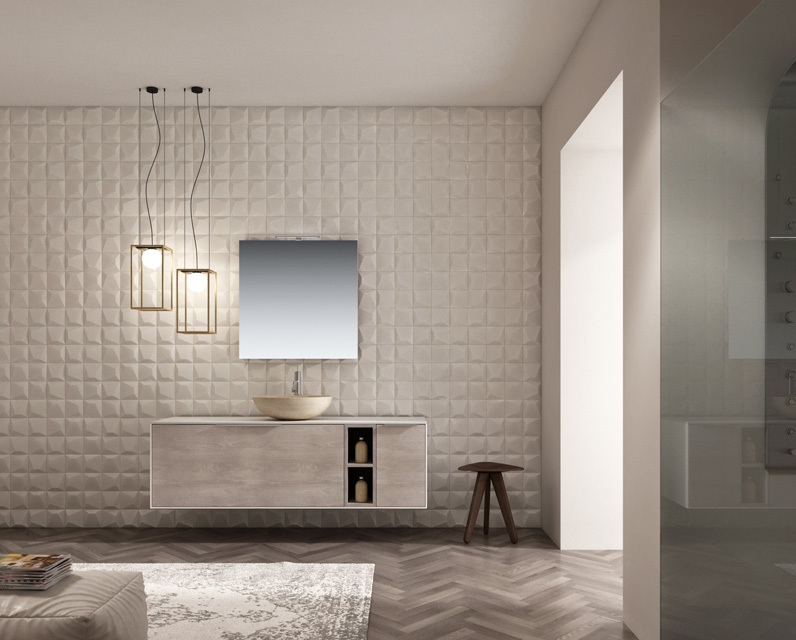 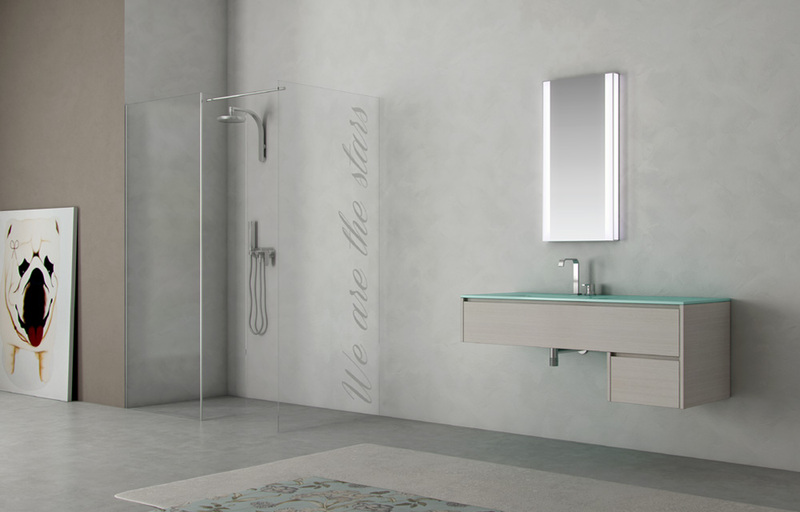 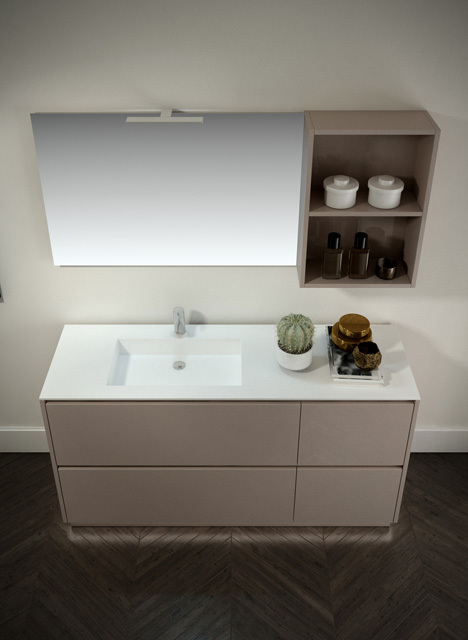 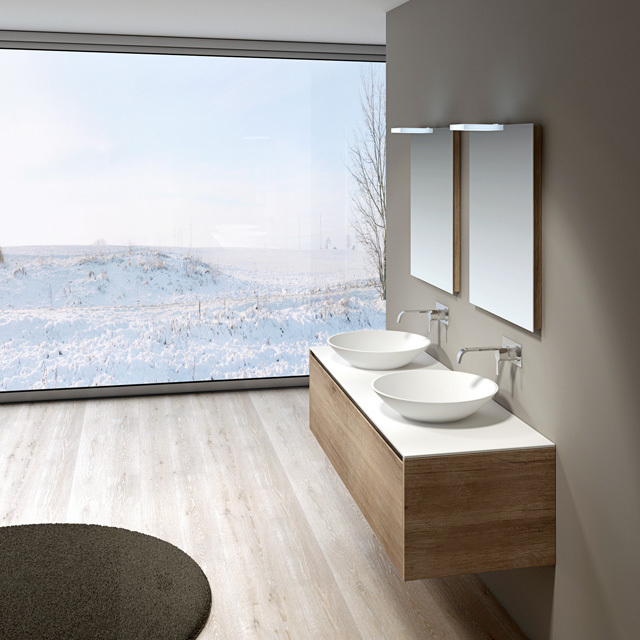 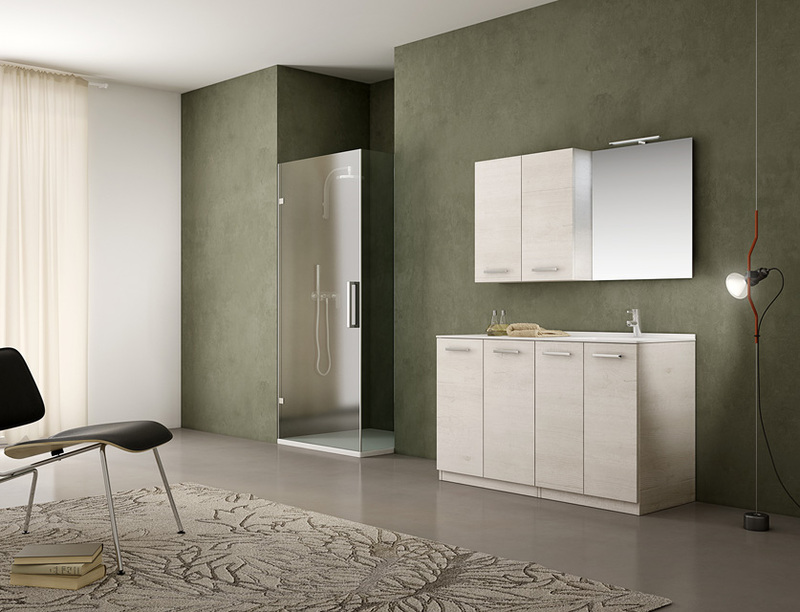 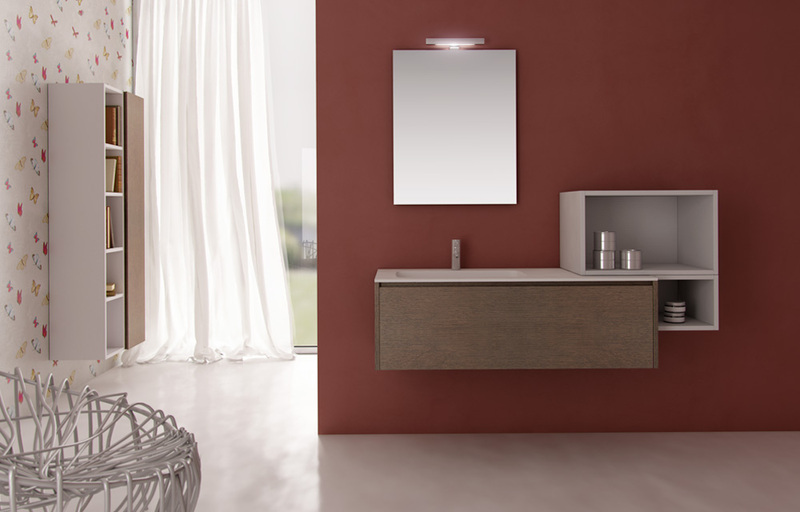 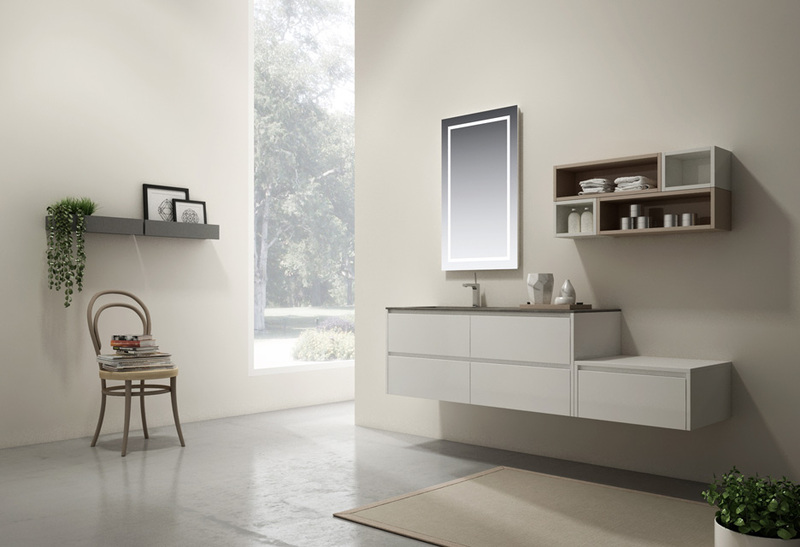 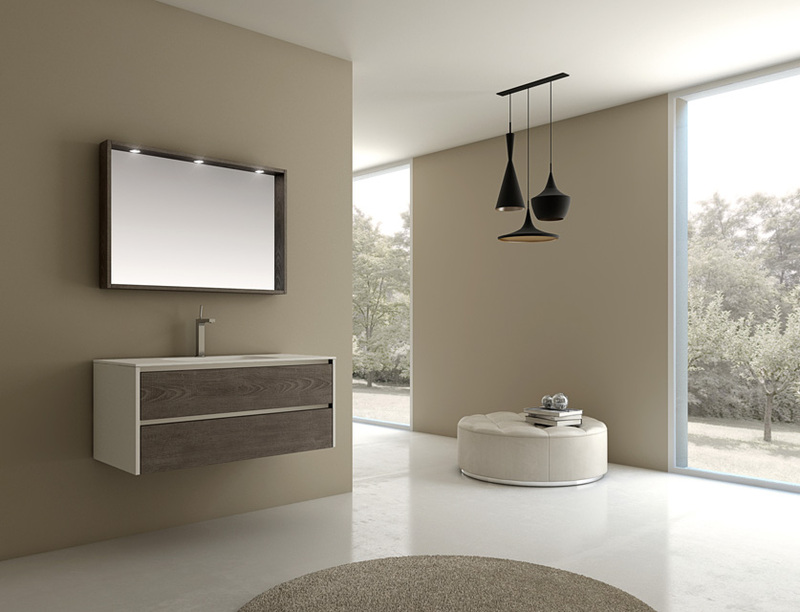 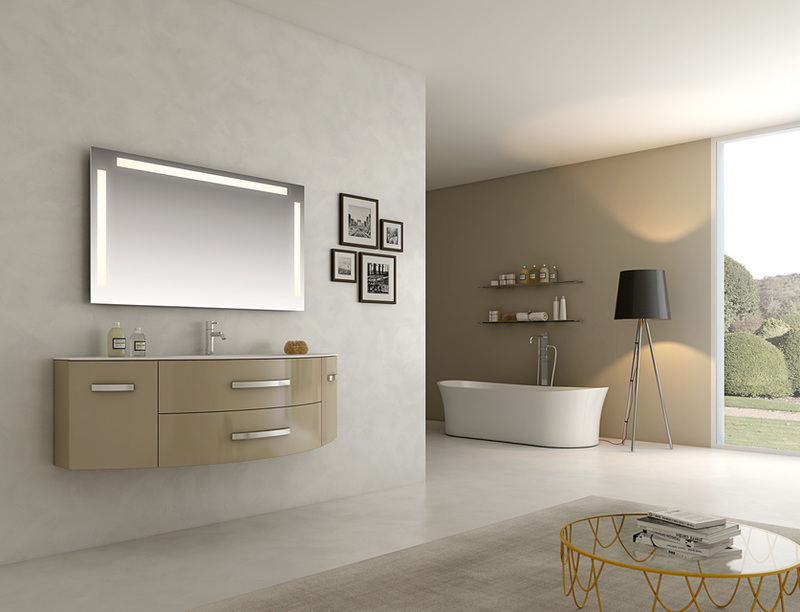 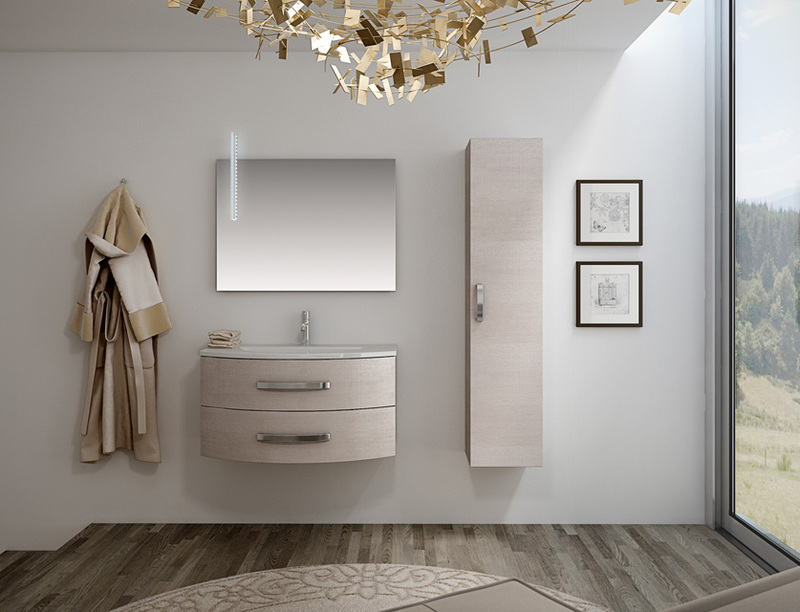 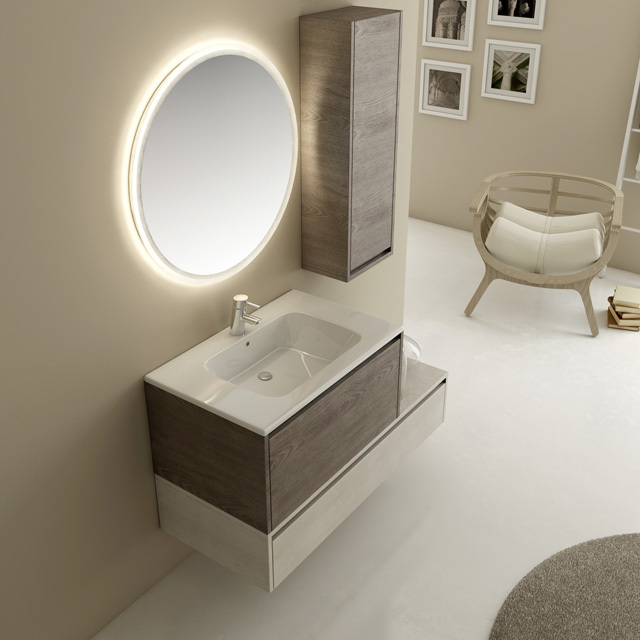 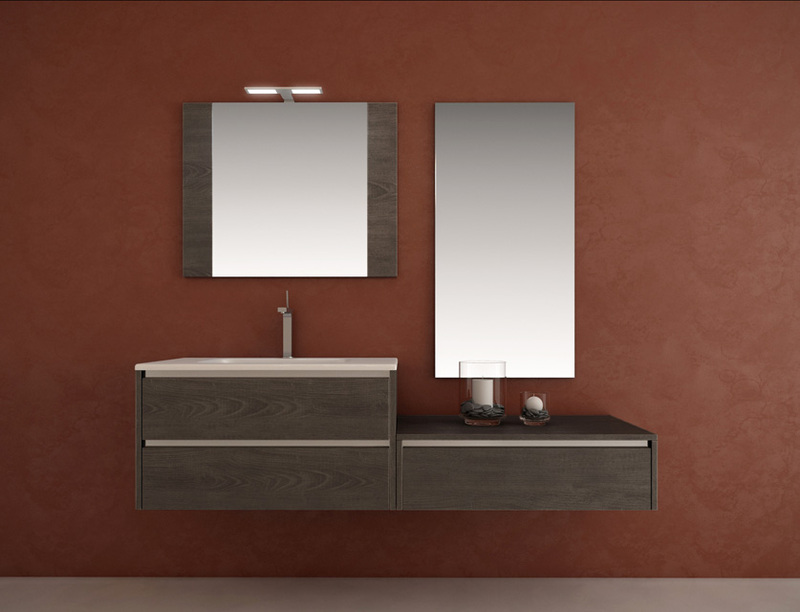 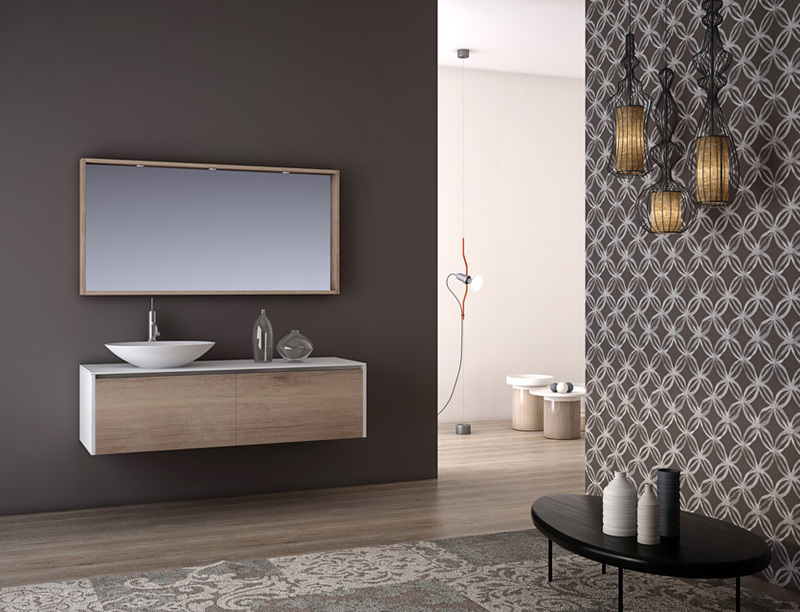 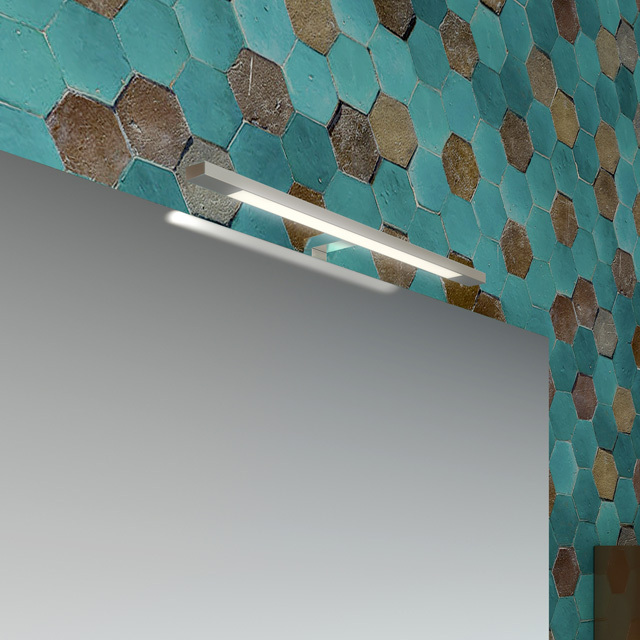 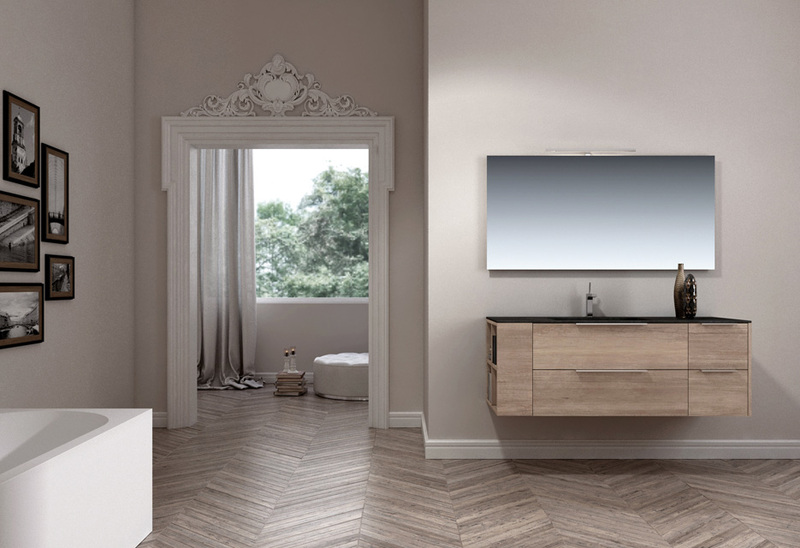 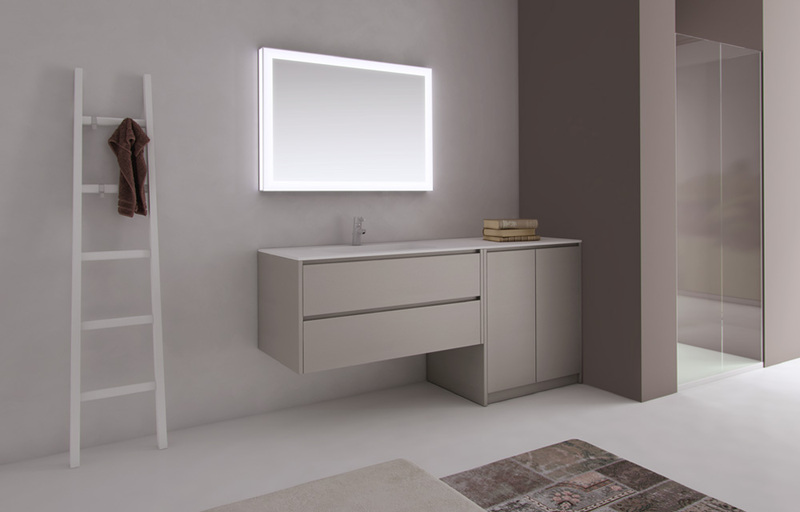 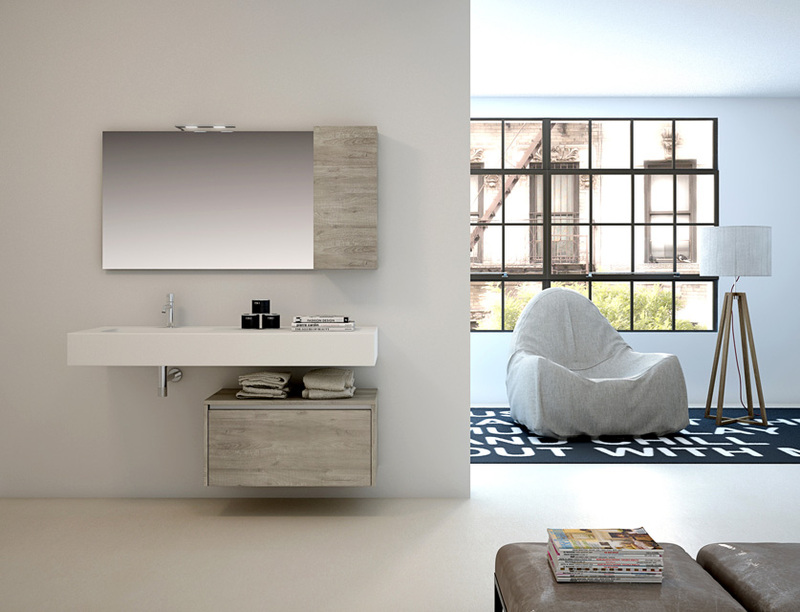 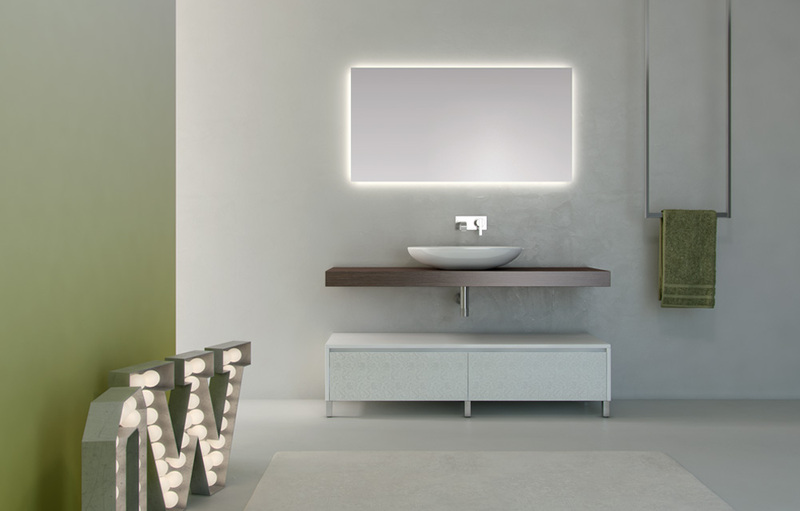 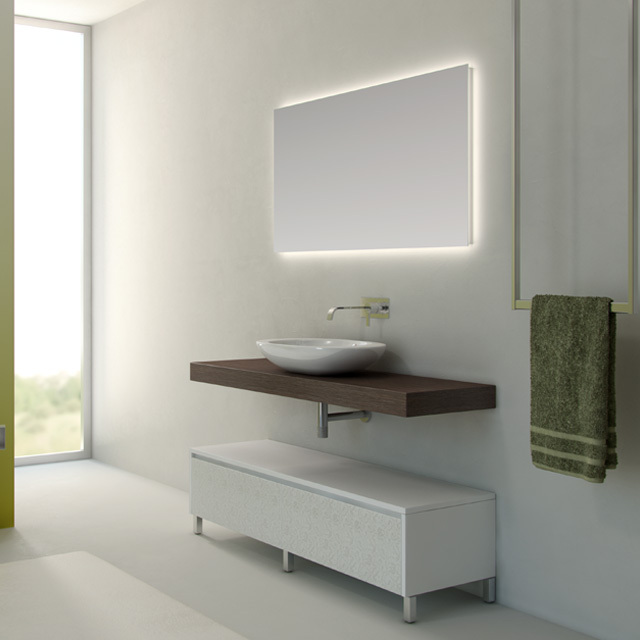 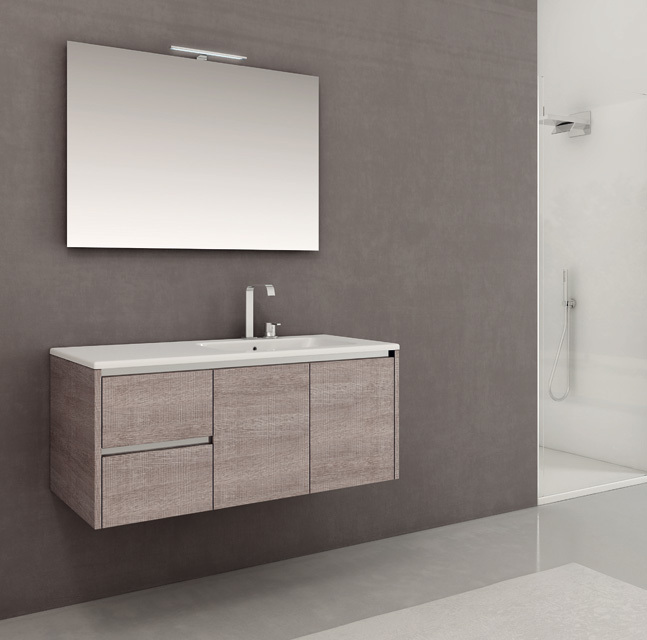 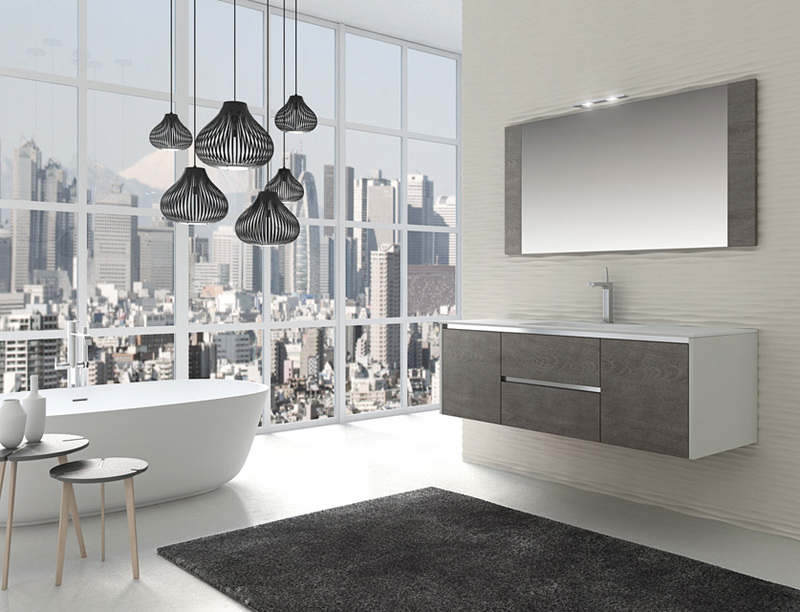 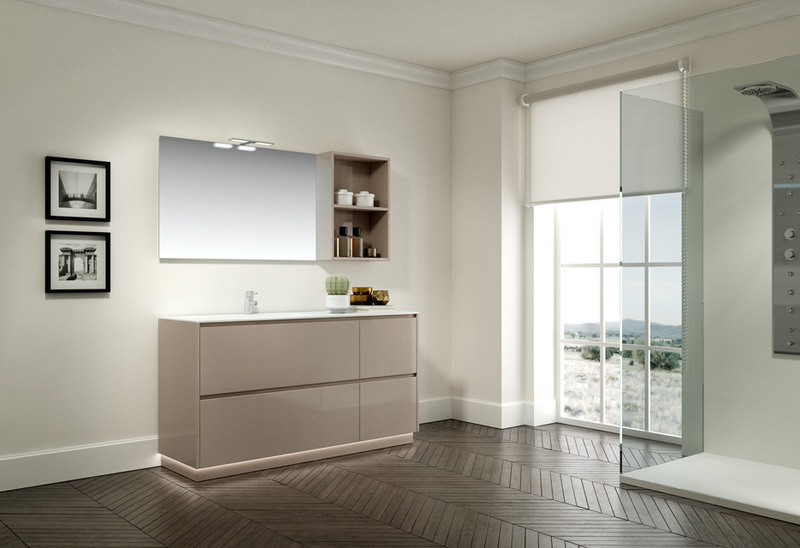 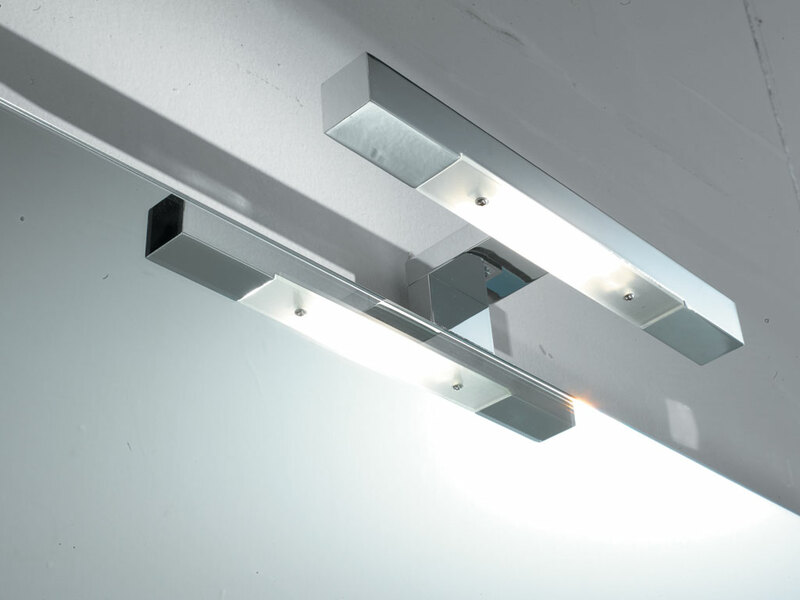 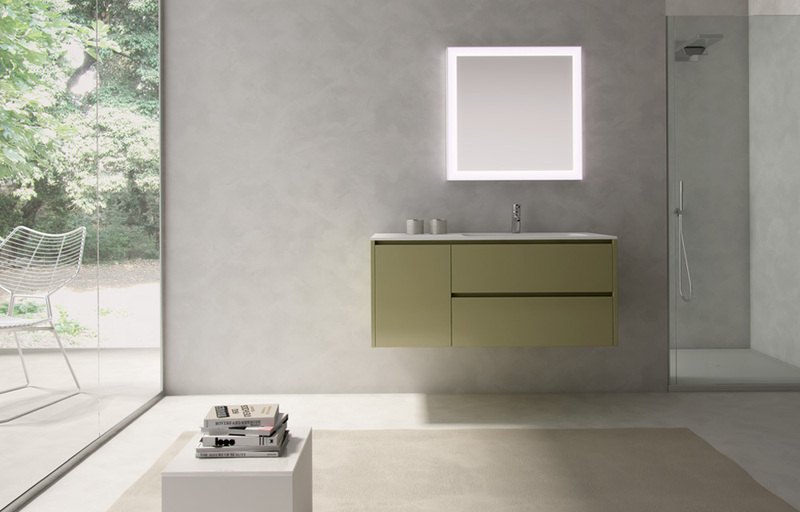 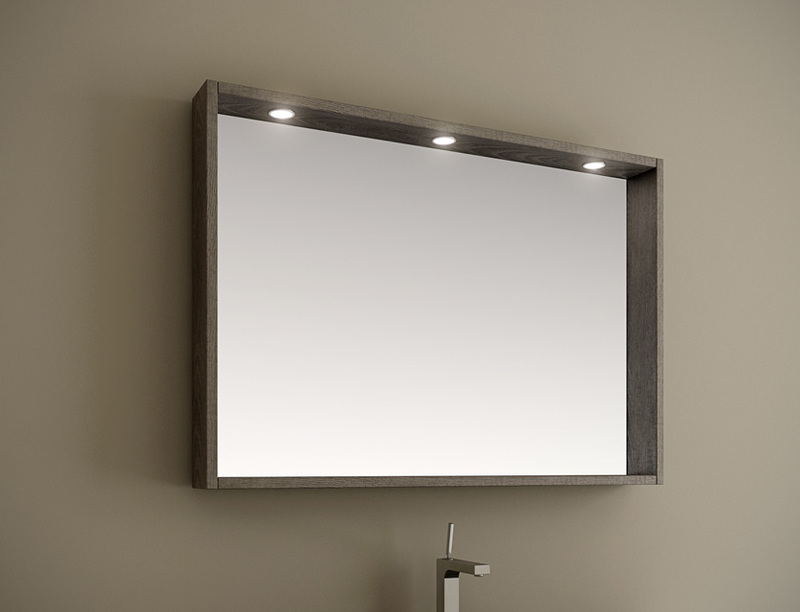 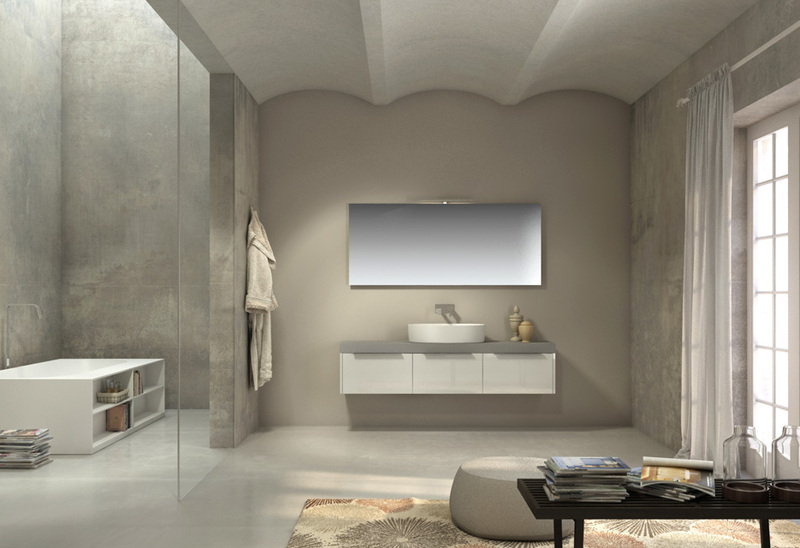 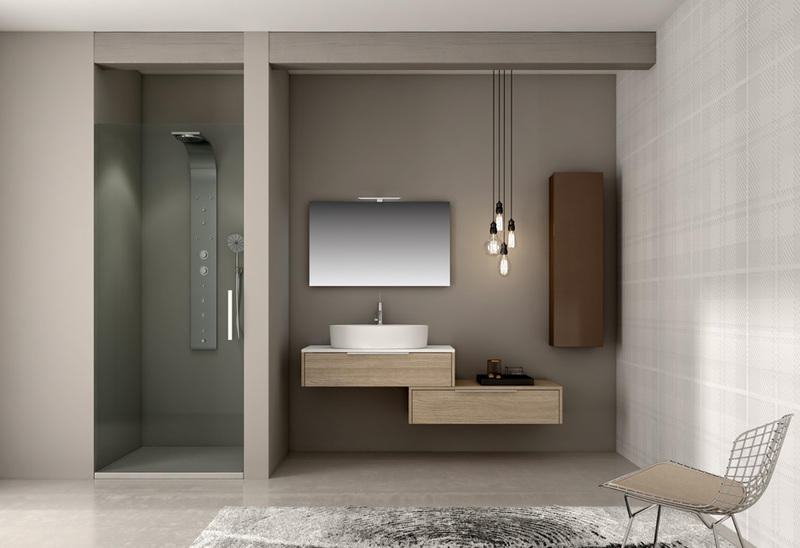 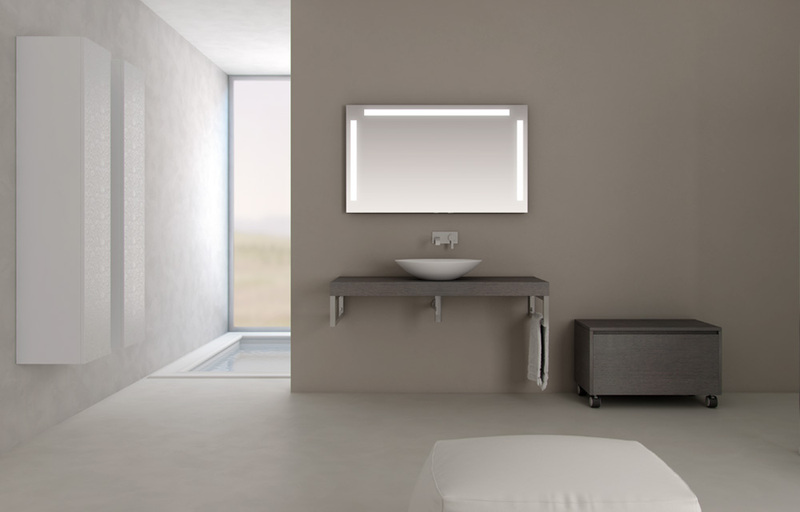 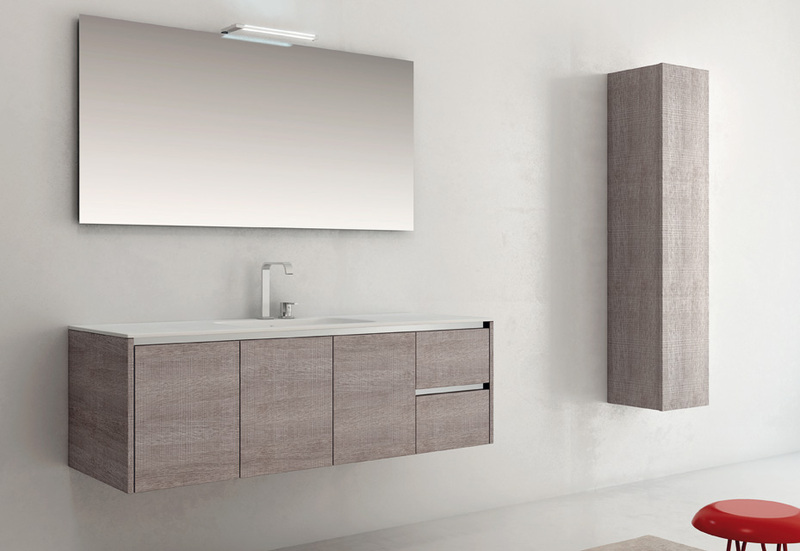 Absolute, with its essentiality’s features, adds new graceful mirrors, led lamp generation of different types, and more chanches to modularity the bathroom, to create a perfect marriage between style and functionality. 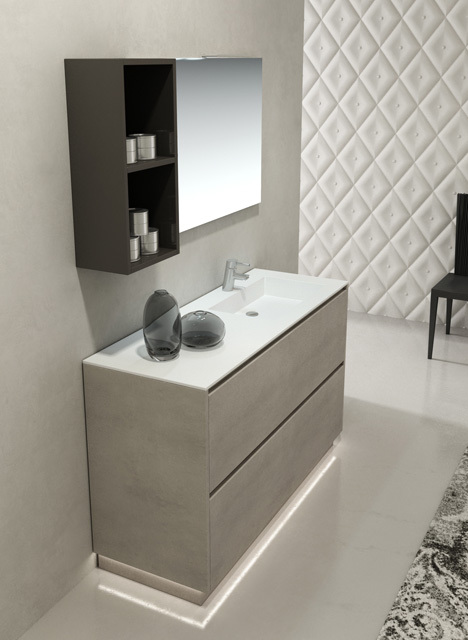 Opera Prima is a clean and essencial collection, with formal synthesis, plenty of details full of style and particular colours and finishes, born to make your bathroom confortable and glamour. 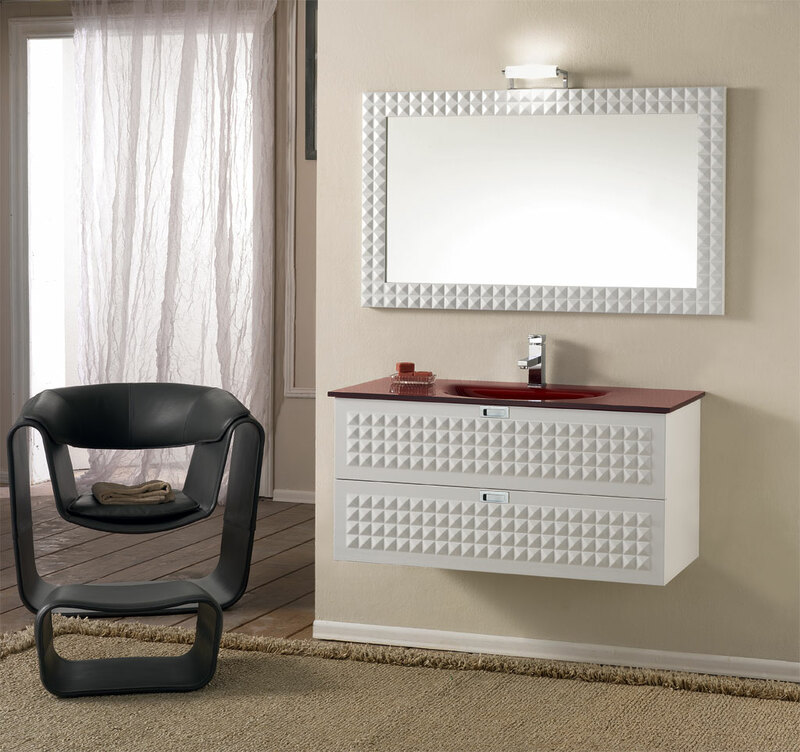 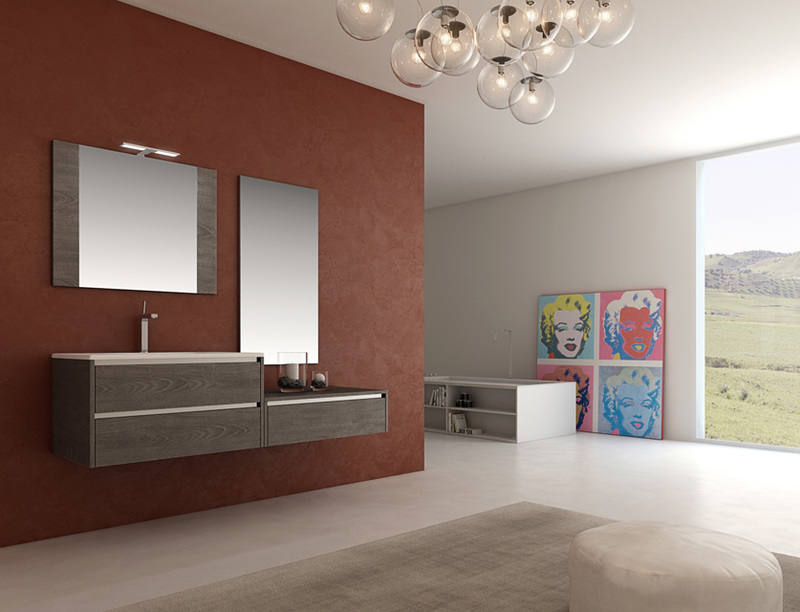 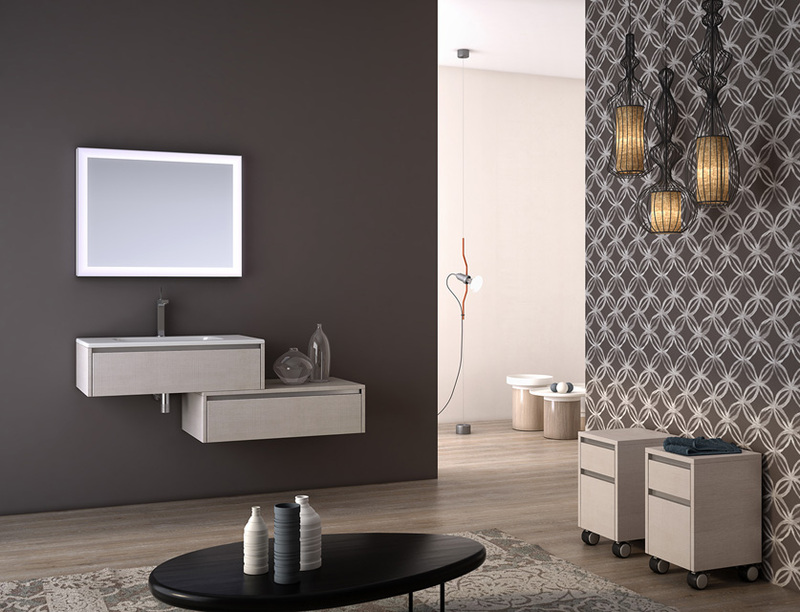 Opera Prima it's a pleasure for the sight, without losing the praticity and the privacy that a bathroom must have. 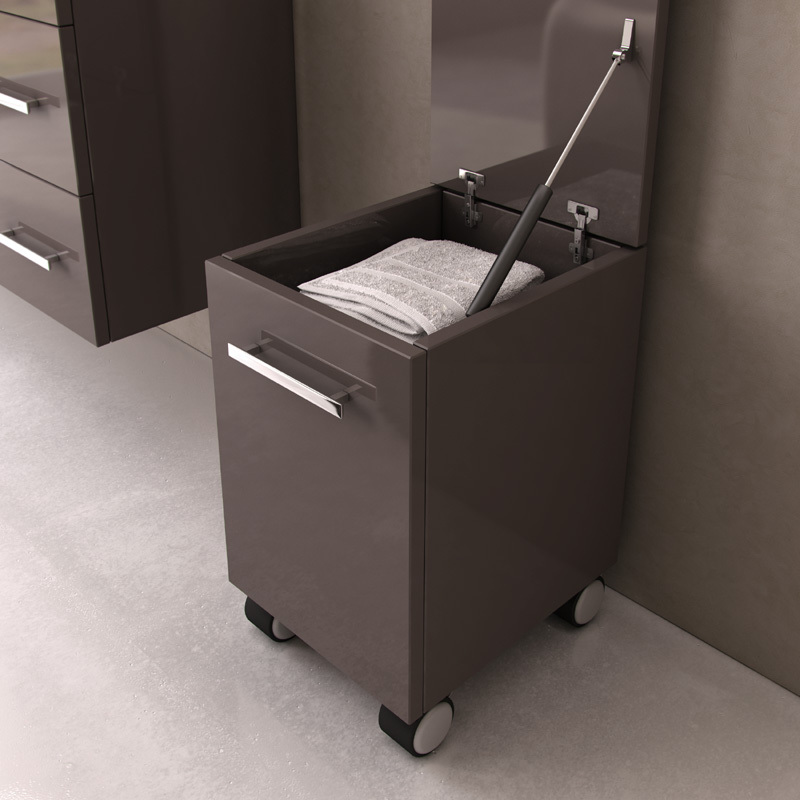 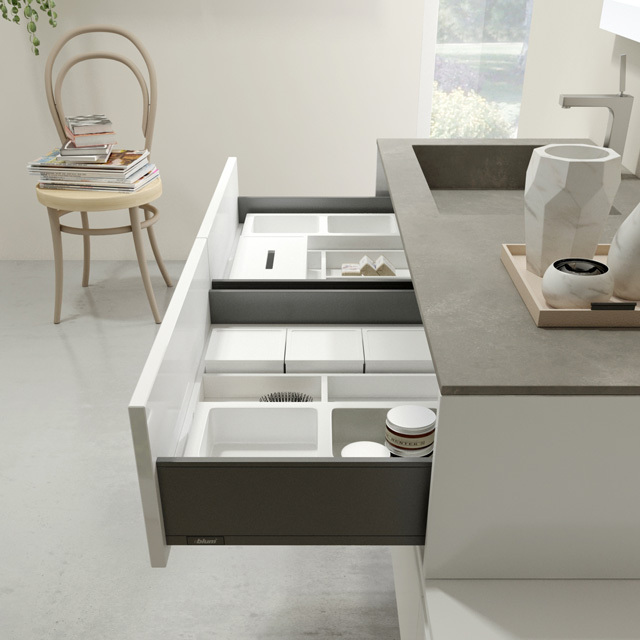 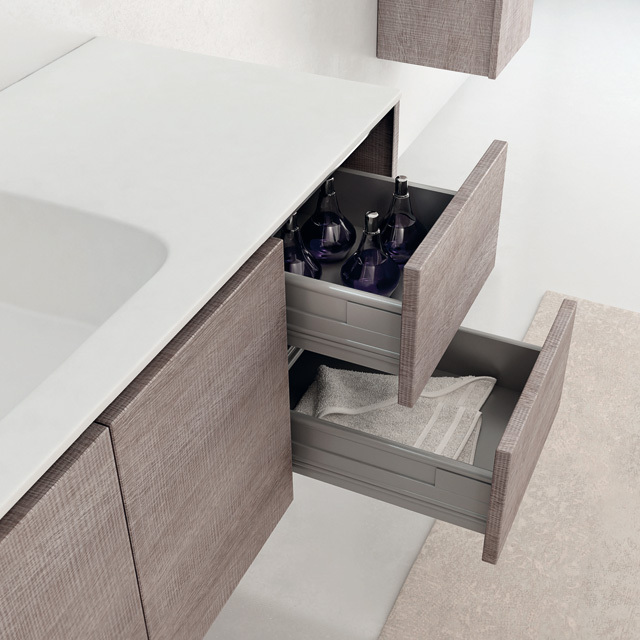 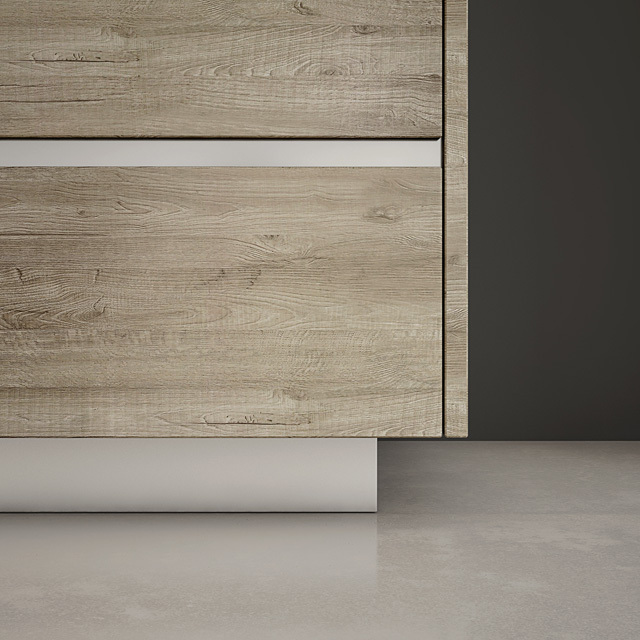 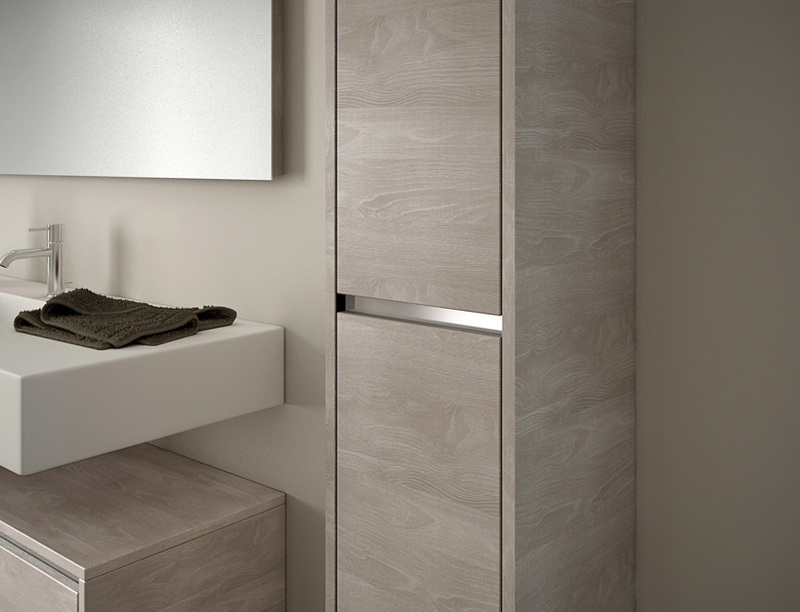 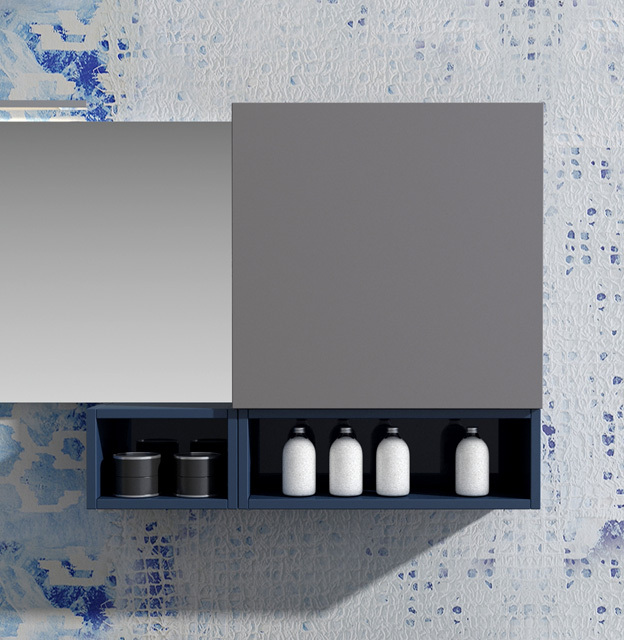 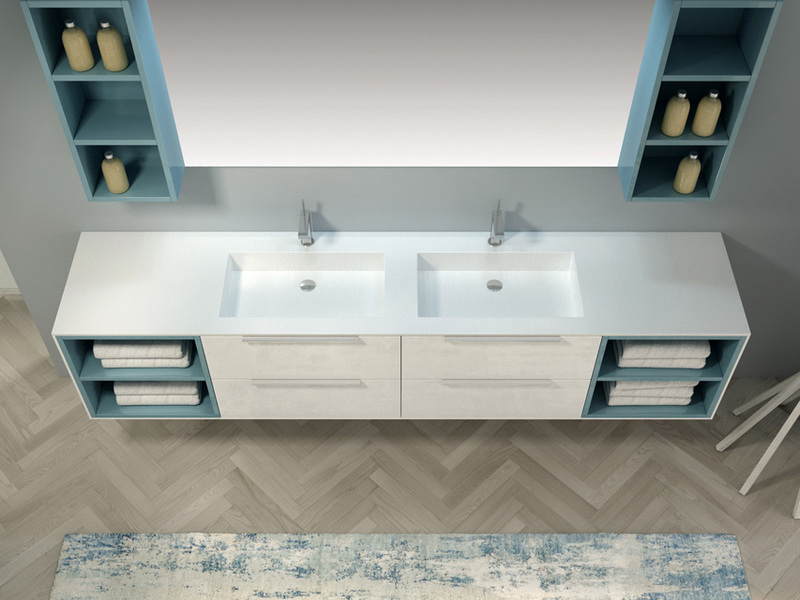 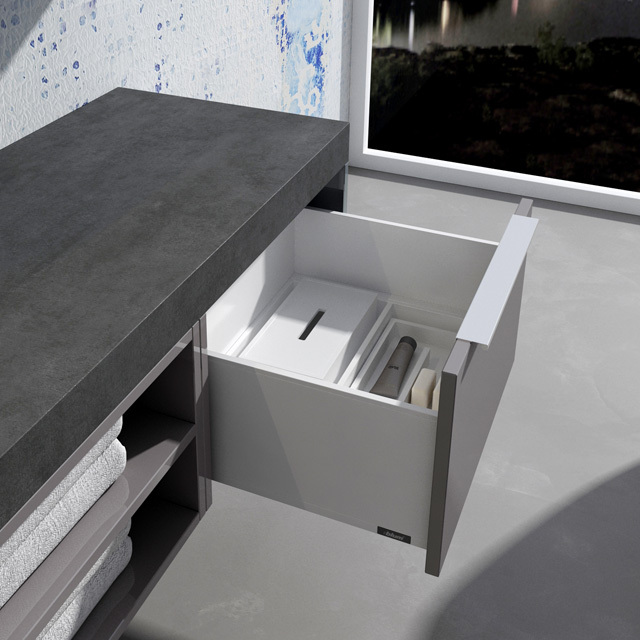 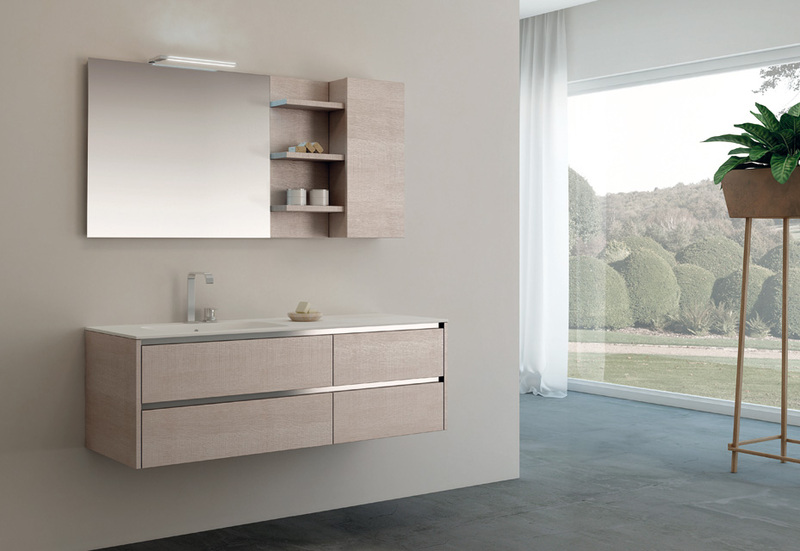 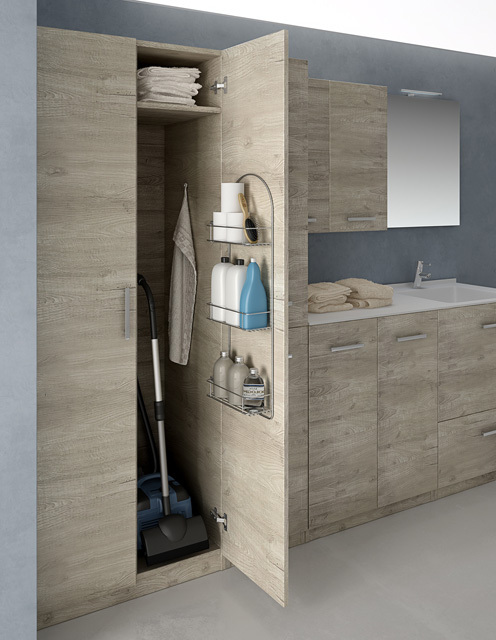 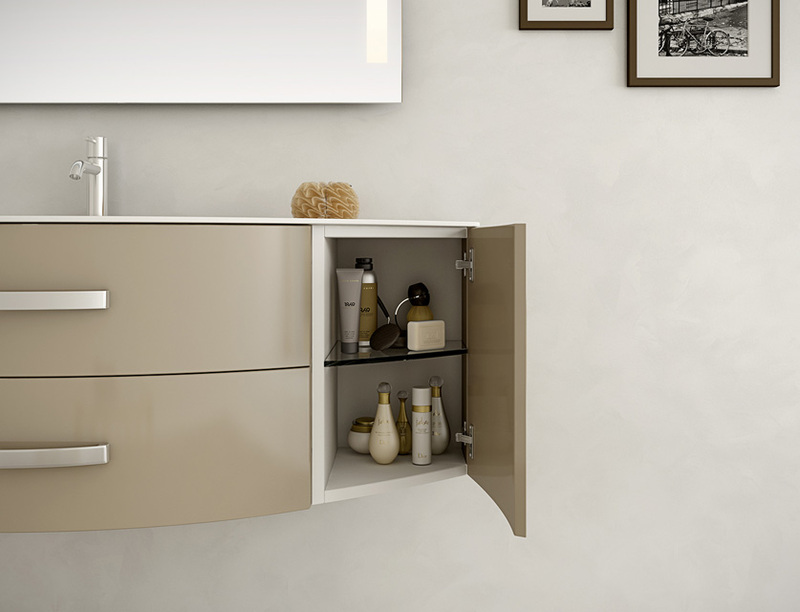 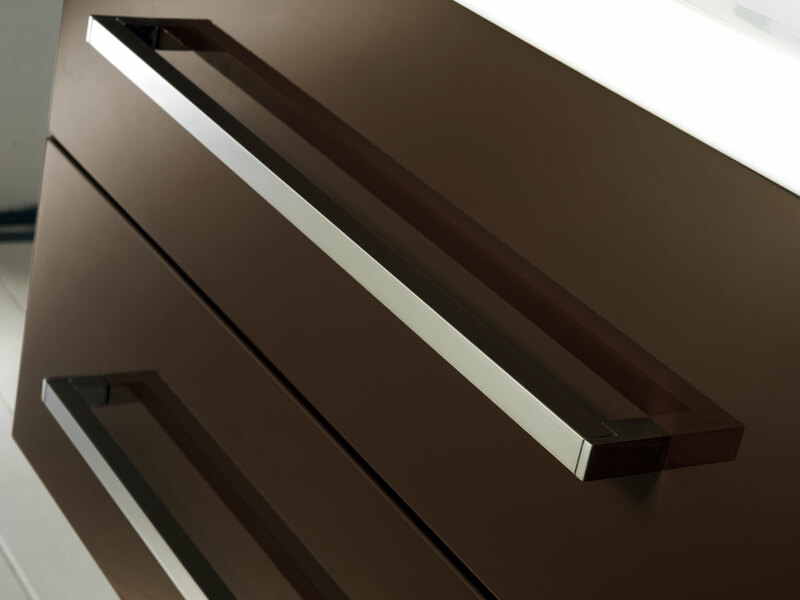 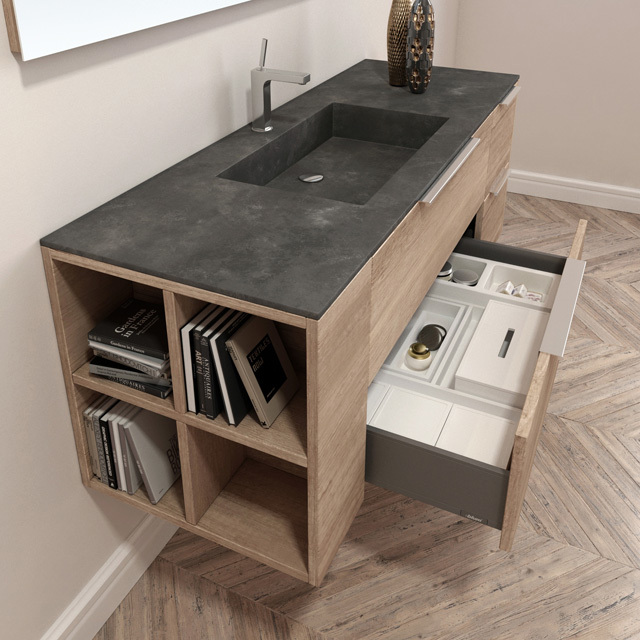 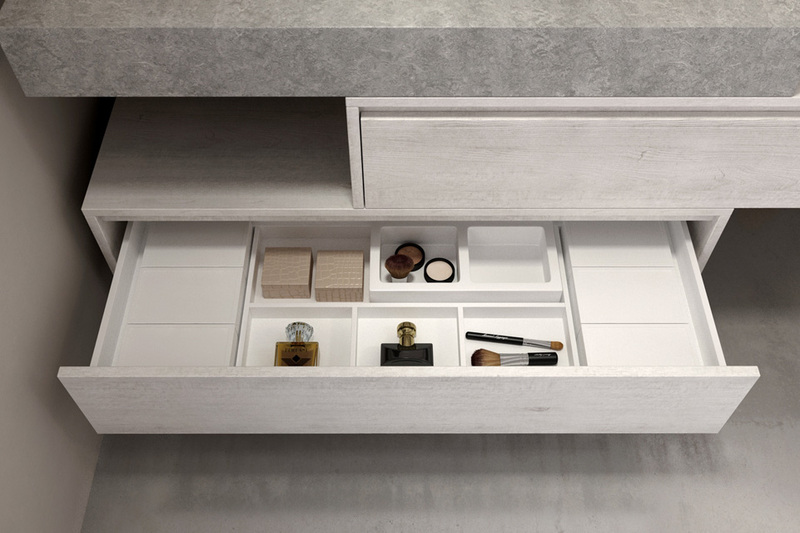 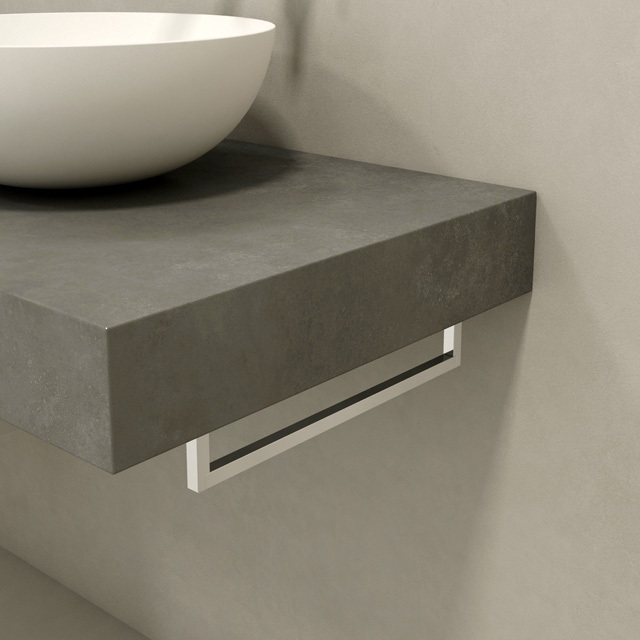 With its essential and clean design, with the full extraction drawers with handles from blum guide, Absolute is the perfect choice to decorate the bathroom with style. 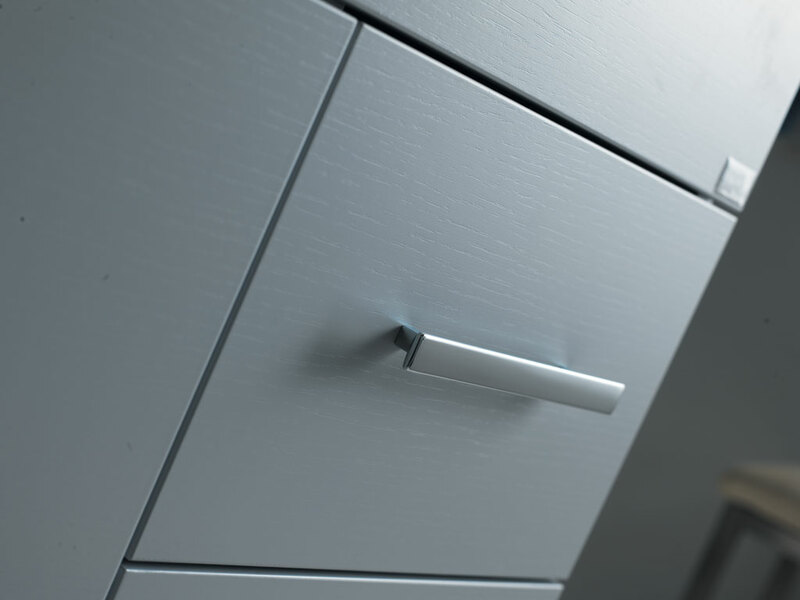 Realized with m.d.f. 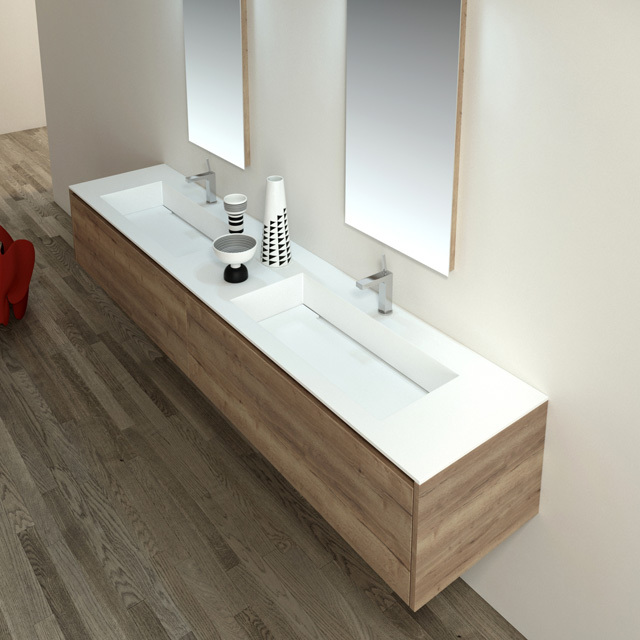 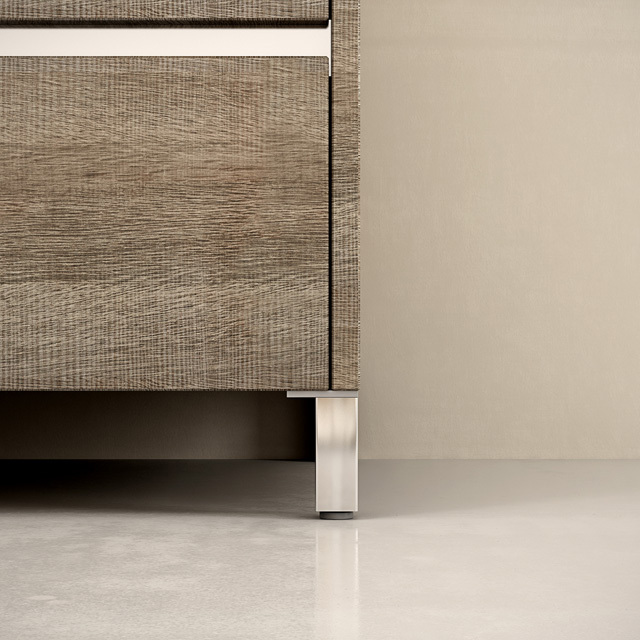 water- repellent, Absolute has a wide range of finishes, which includes matt and glossy varnished and laminates in tranchè oak. 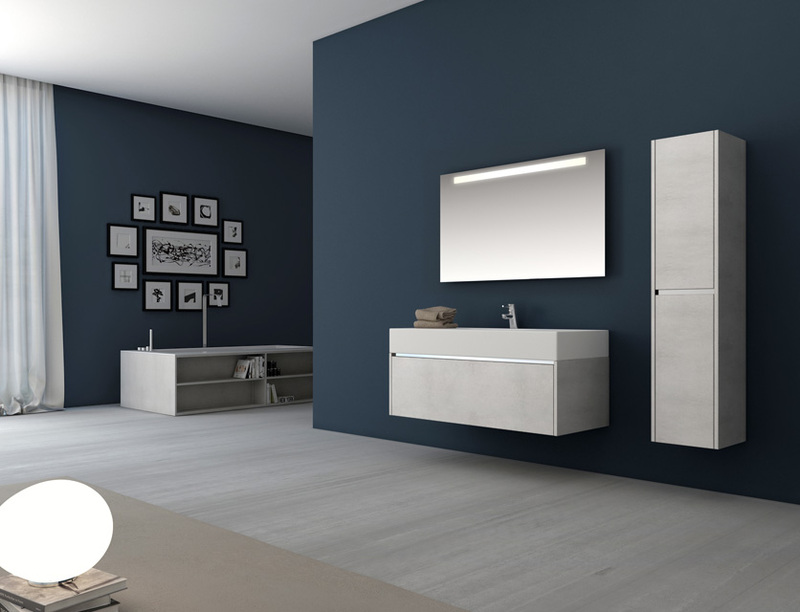 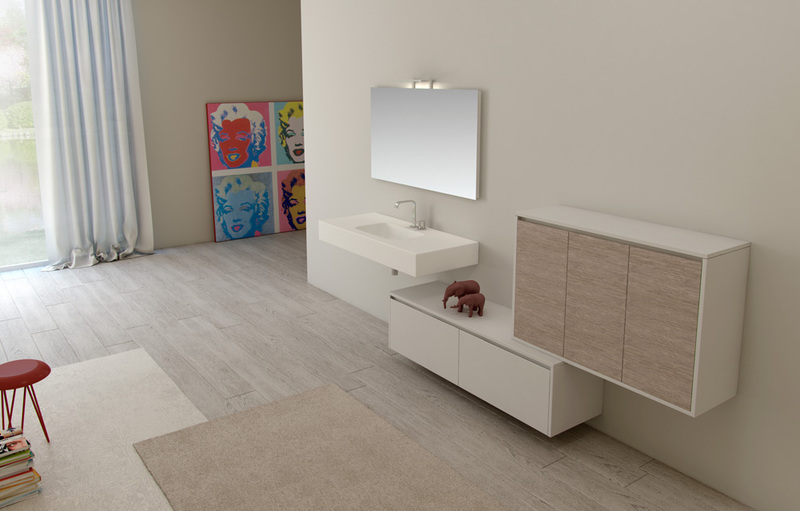 A modern collection with furnitures of different sizes, realized to arrange the washbasin units, in order to customize the bathroom. 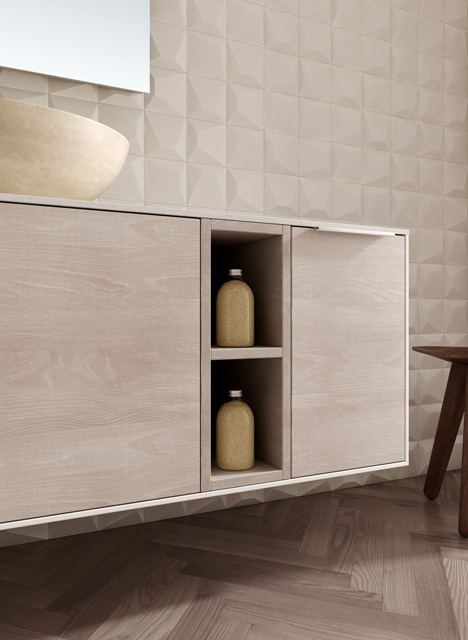 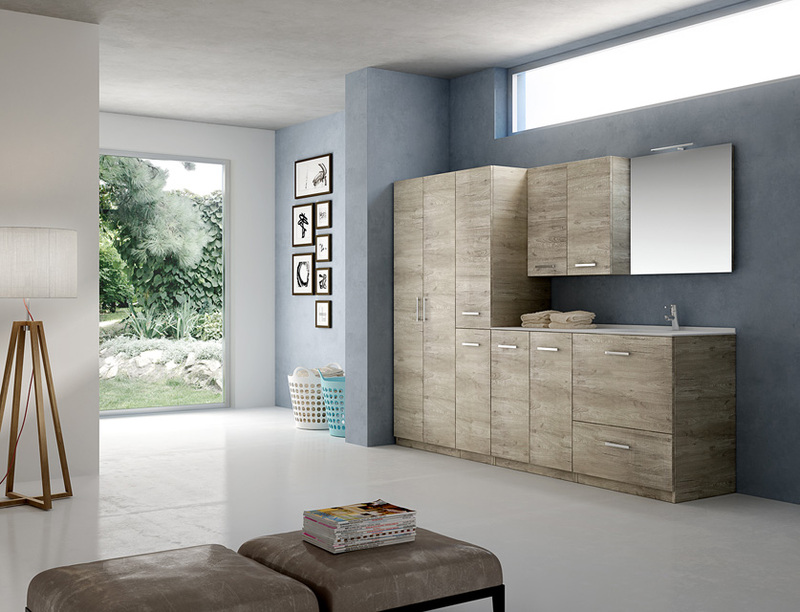 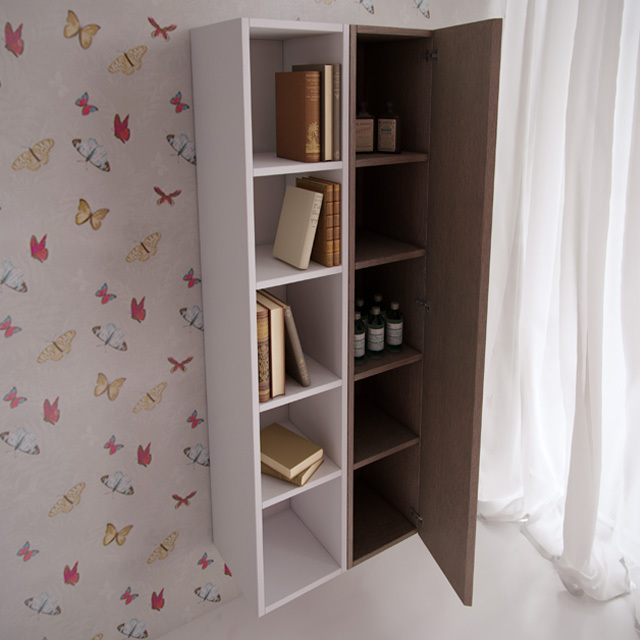 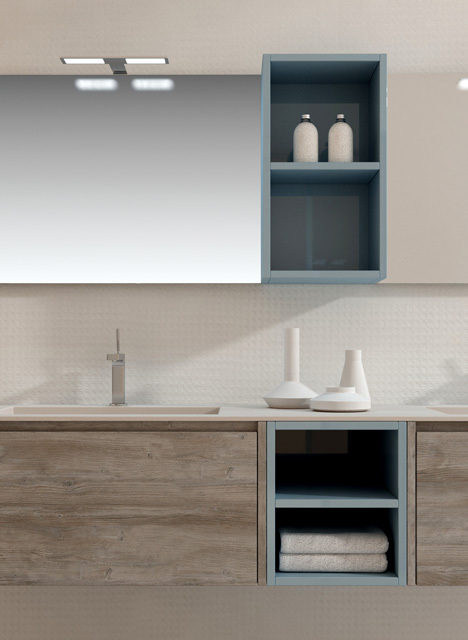 Manhattan, available in bleached and wengè oak, could be varnished in different colors opaque (MANHATTAN COLOR) and glossy (MANHATTAN COLOR GLOSSY). 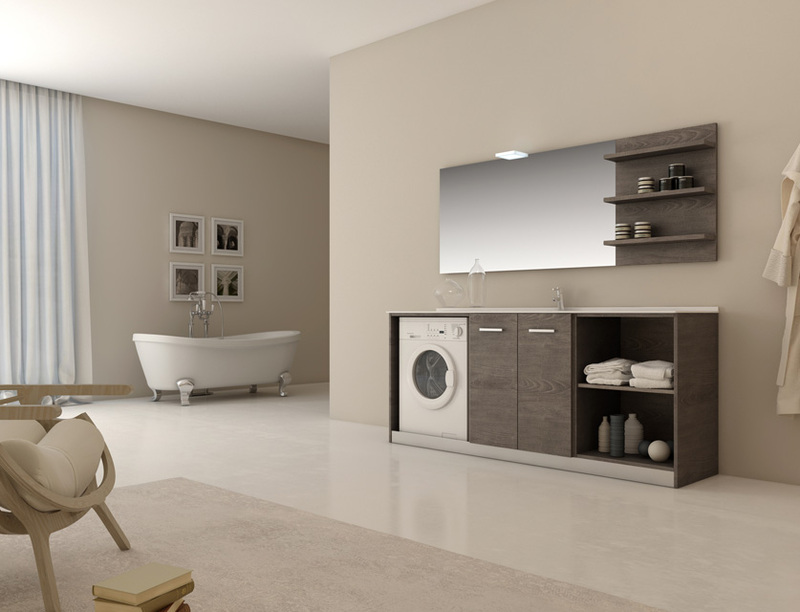 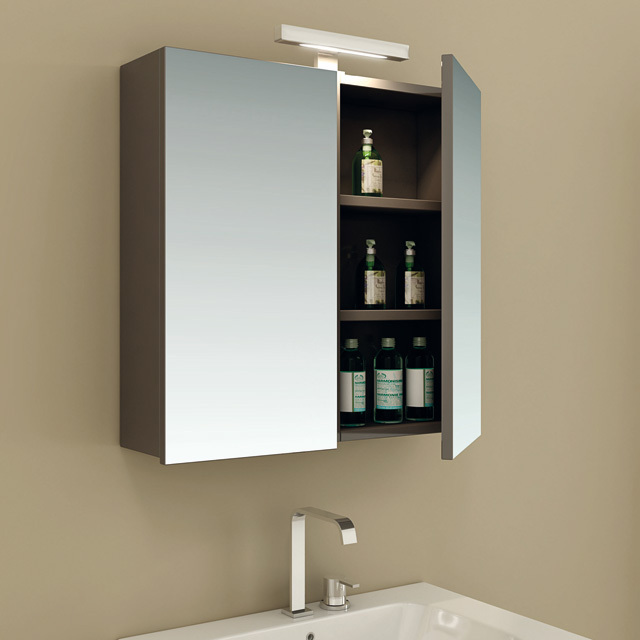 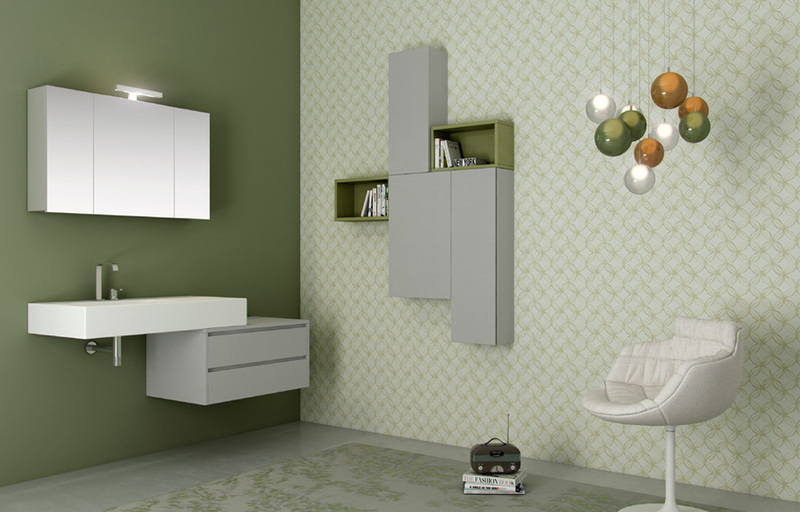 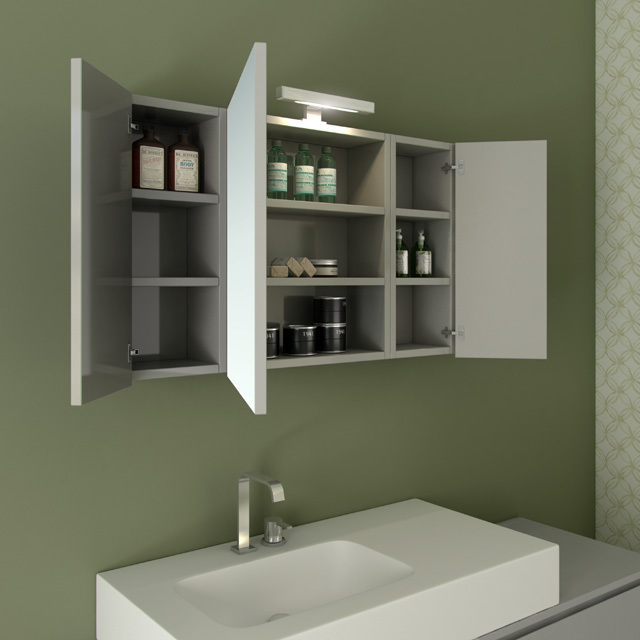 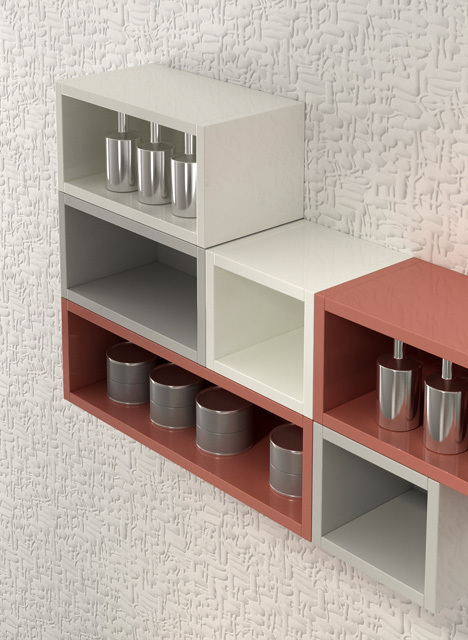 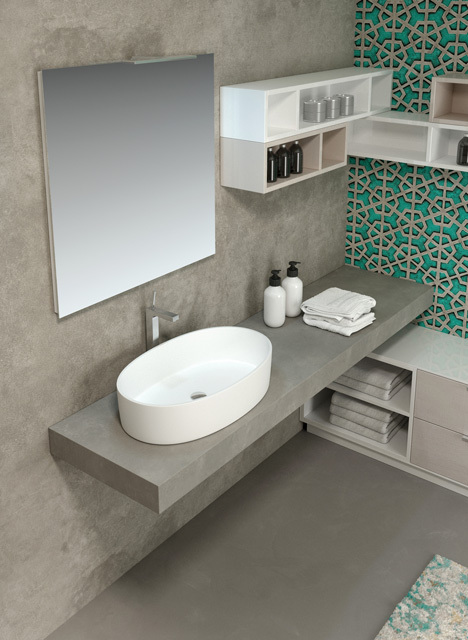 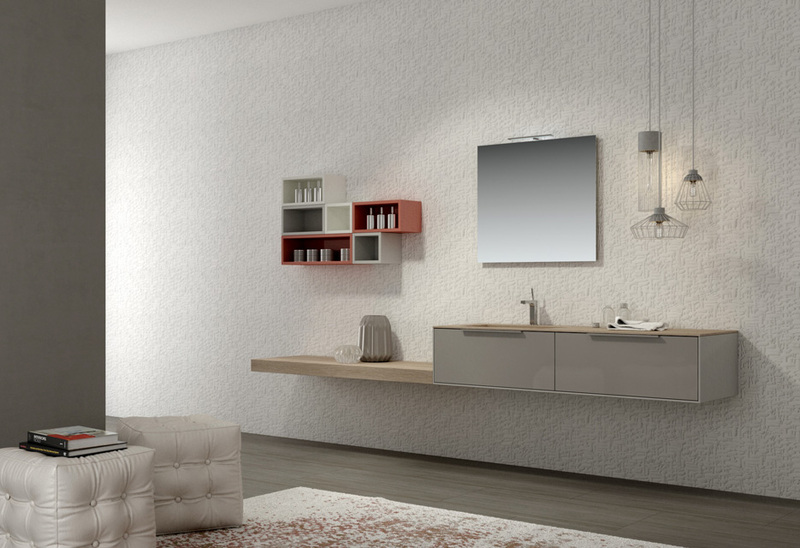 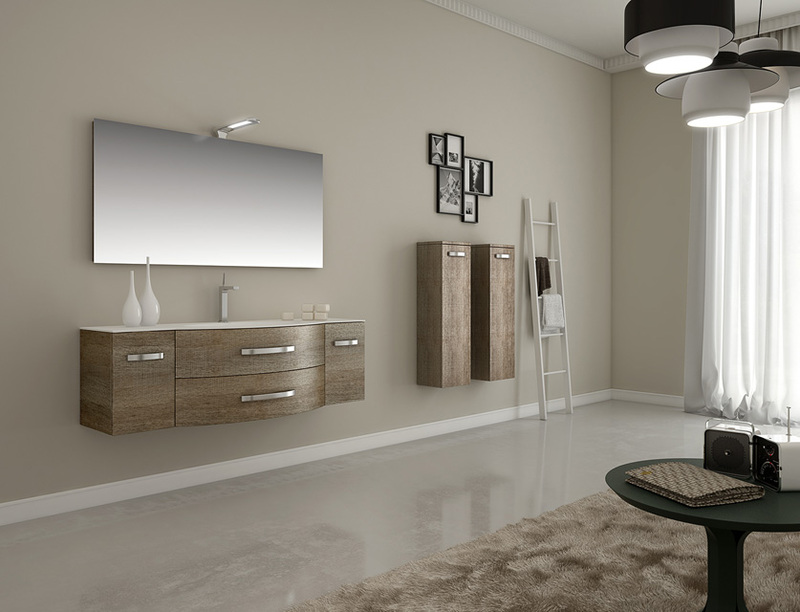 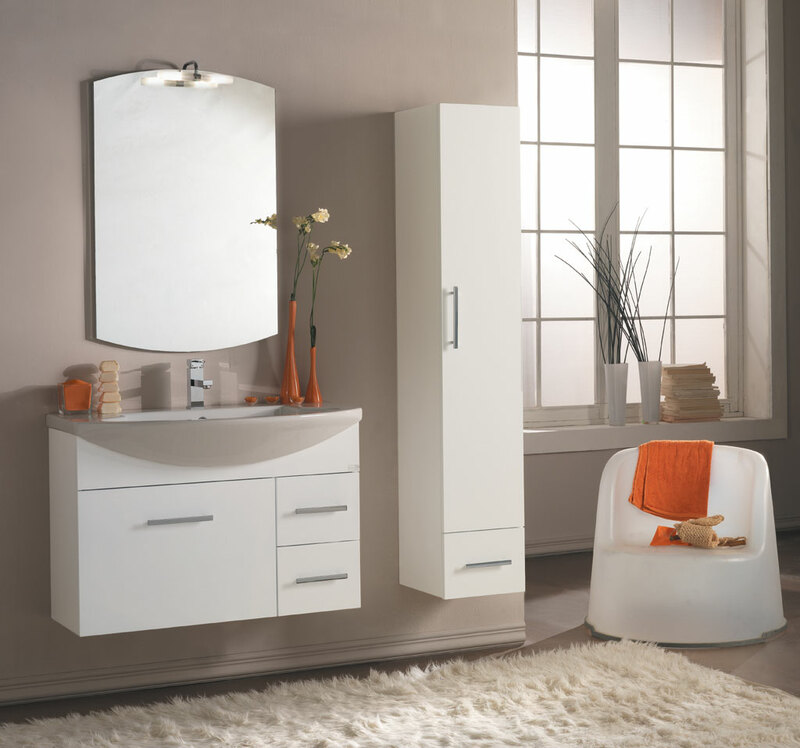 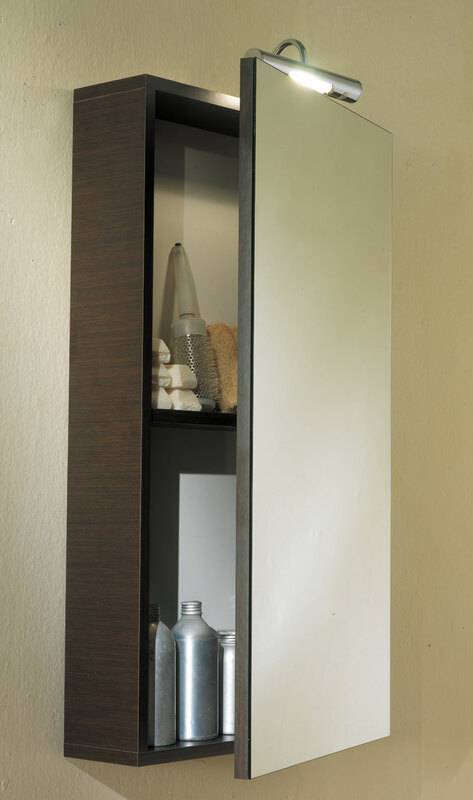 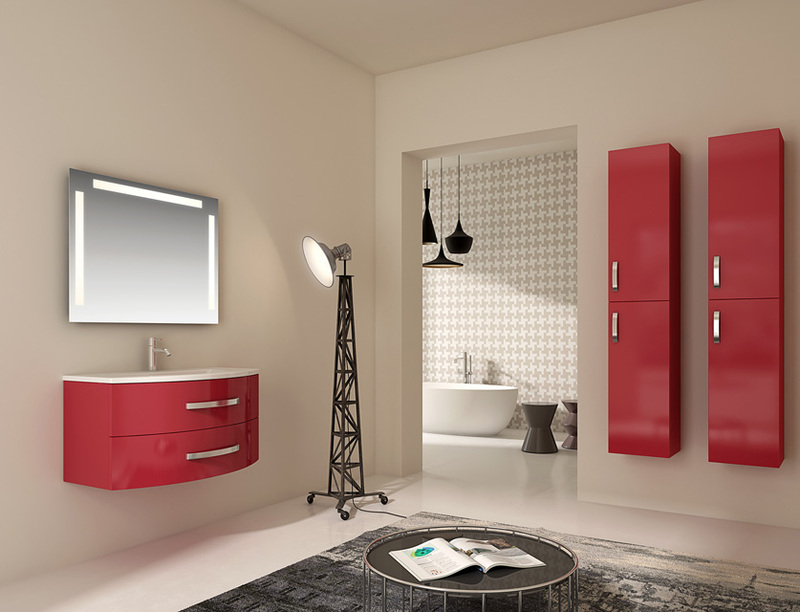 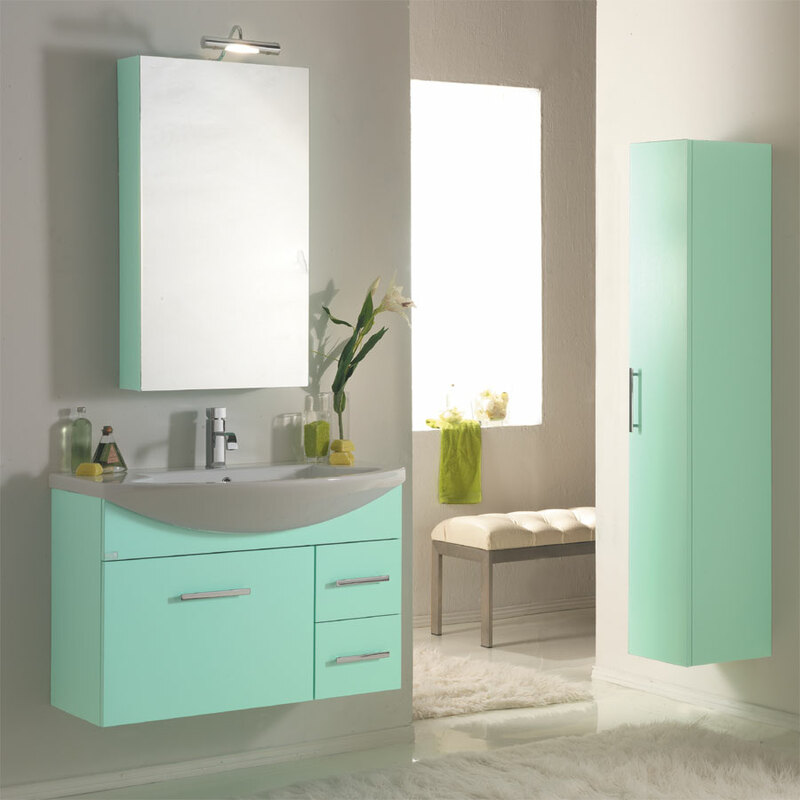 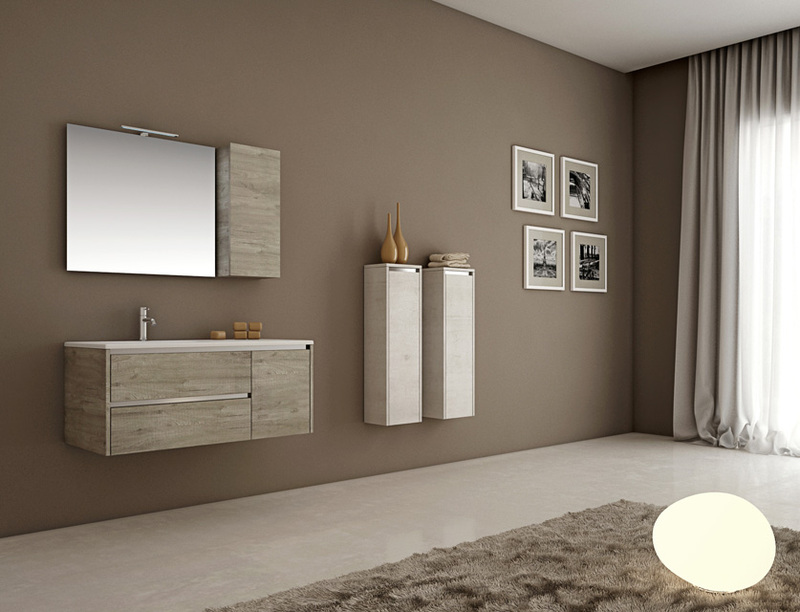 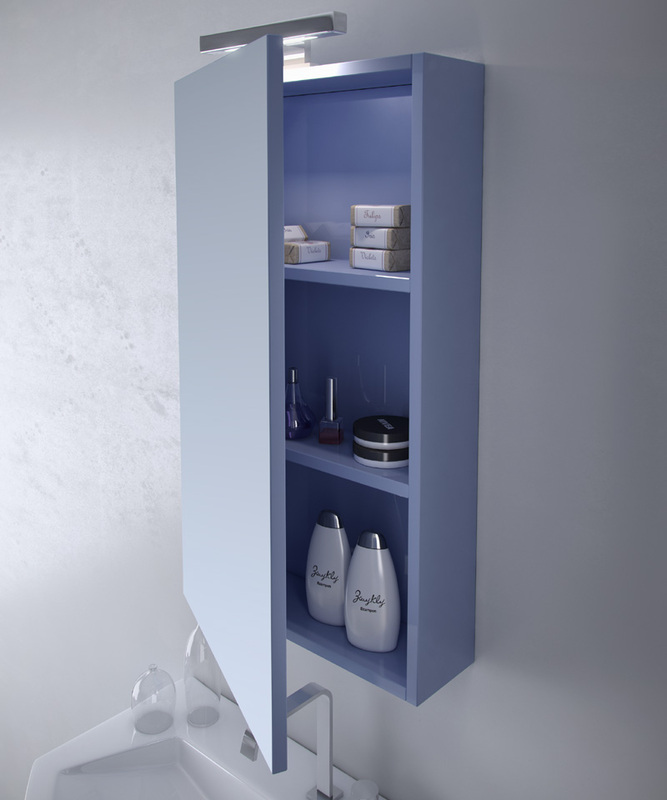 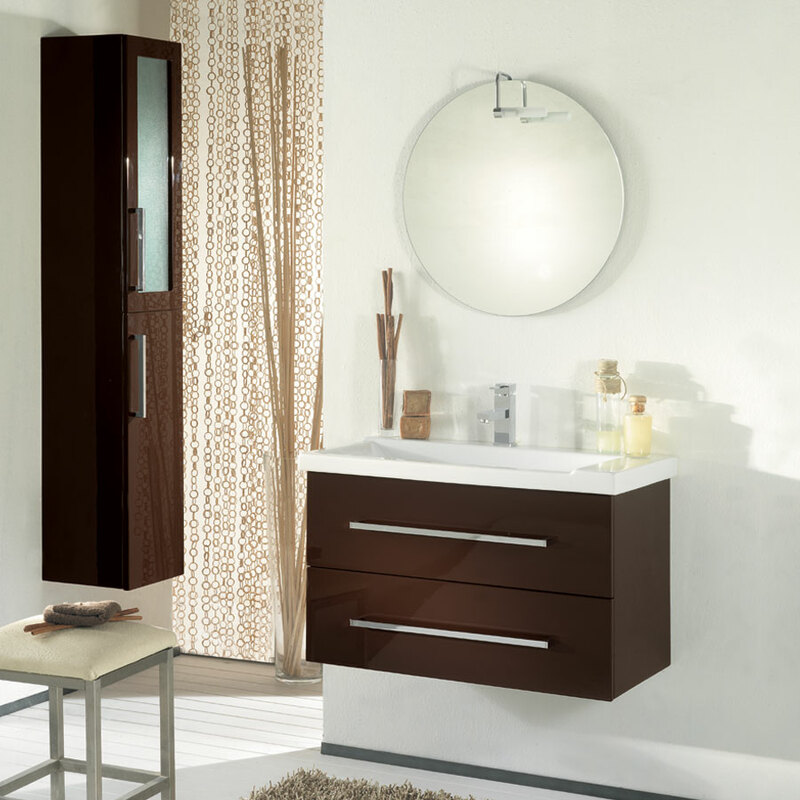 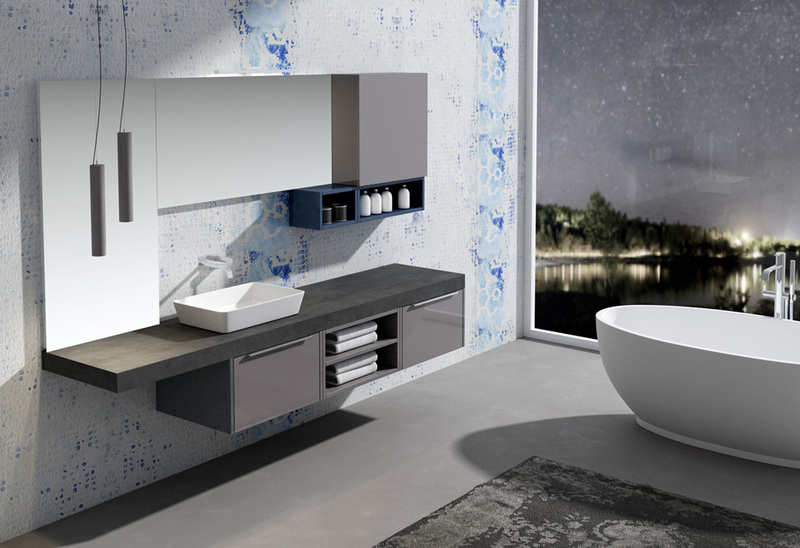 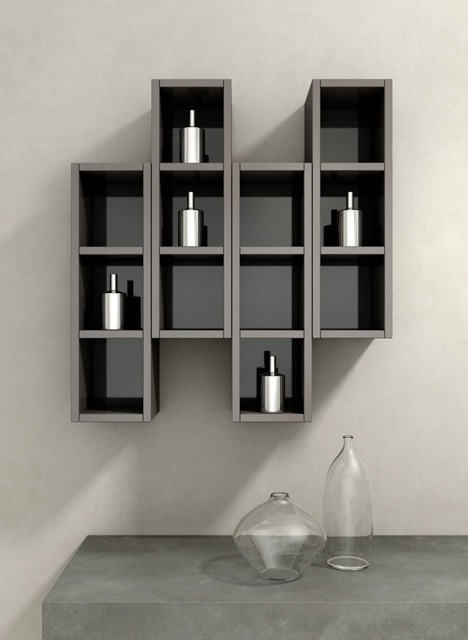 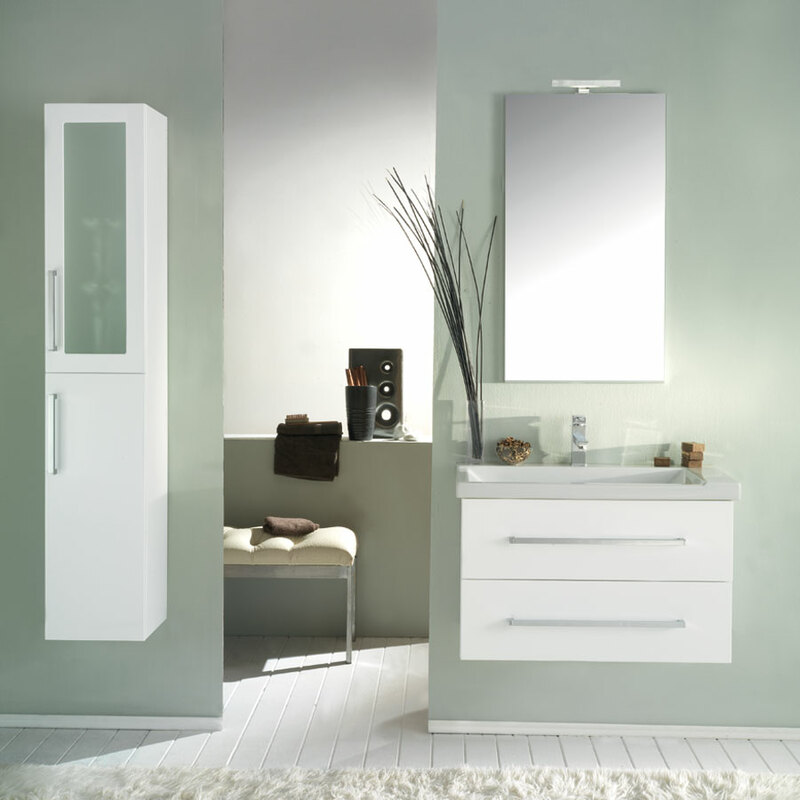 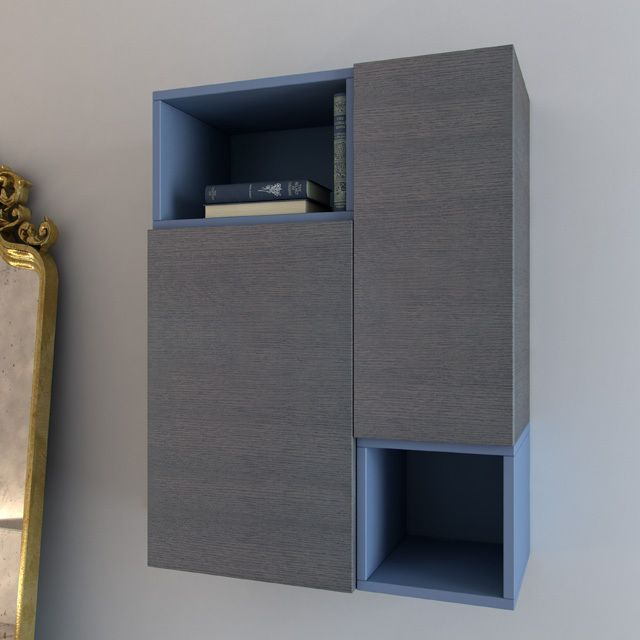 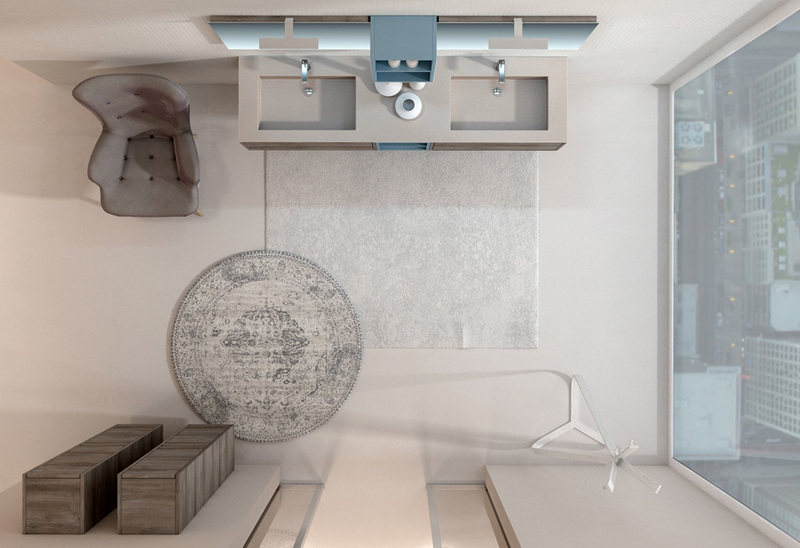 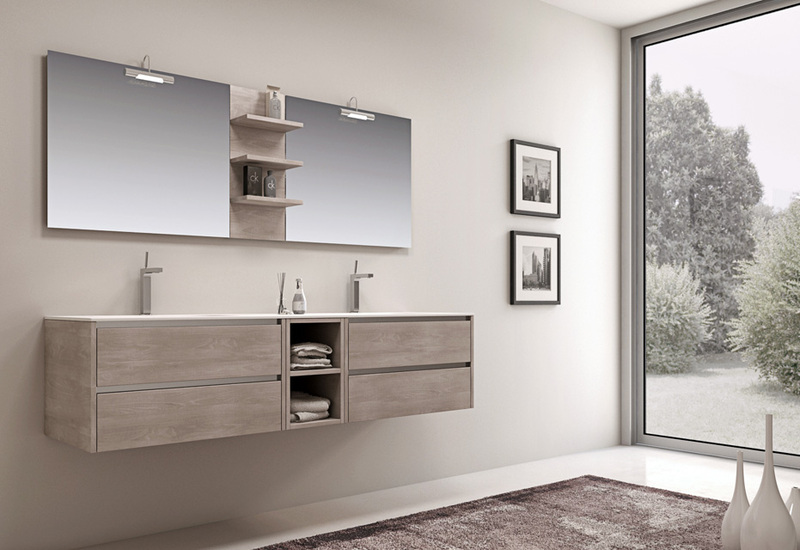 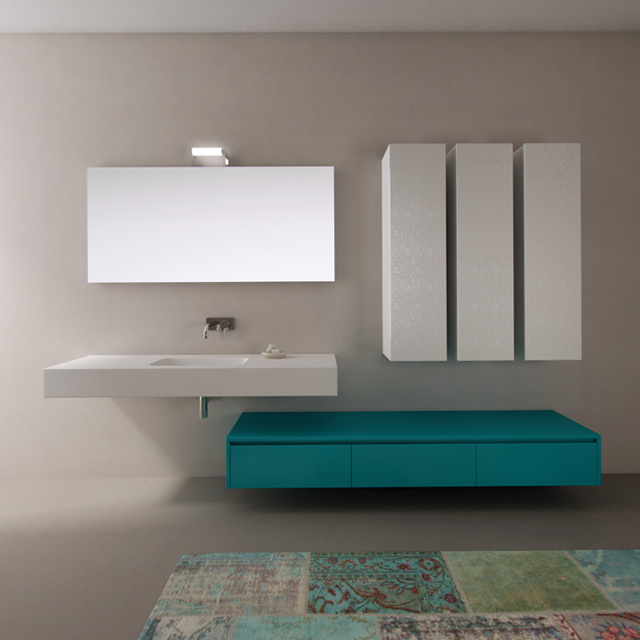 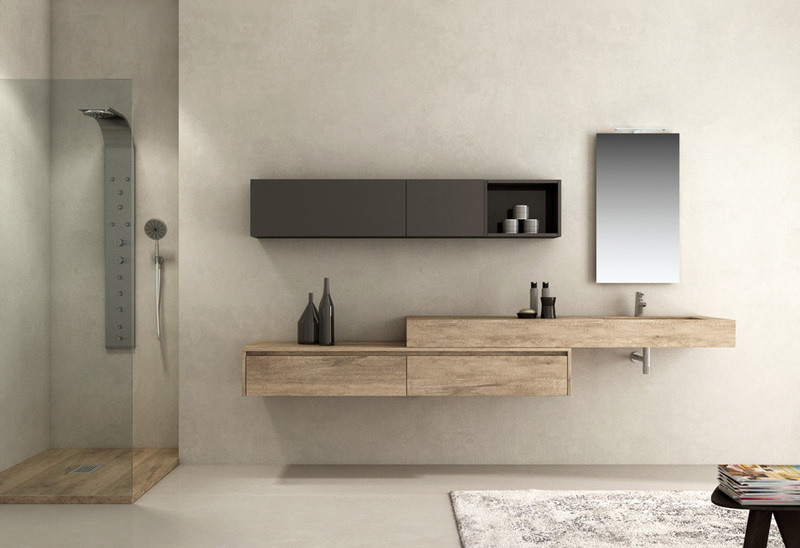 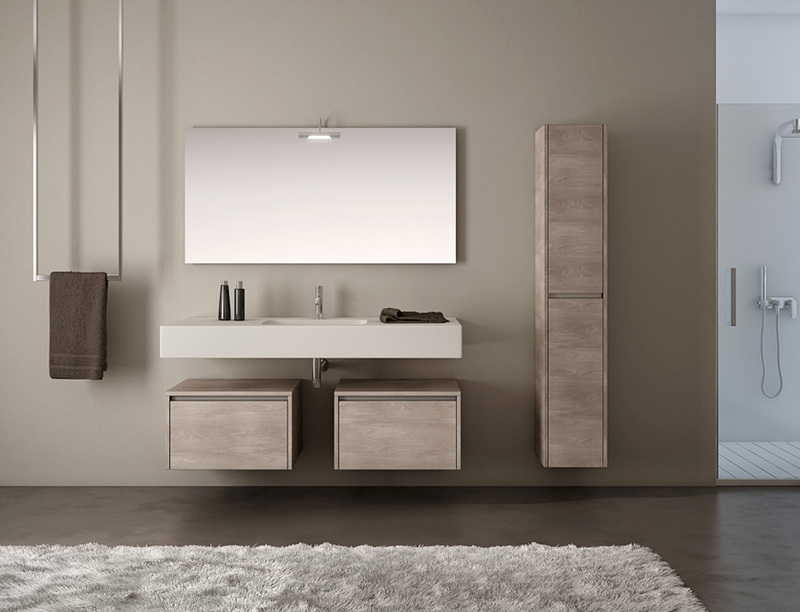 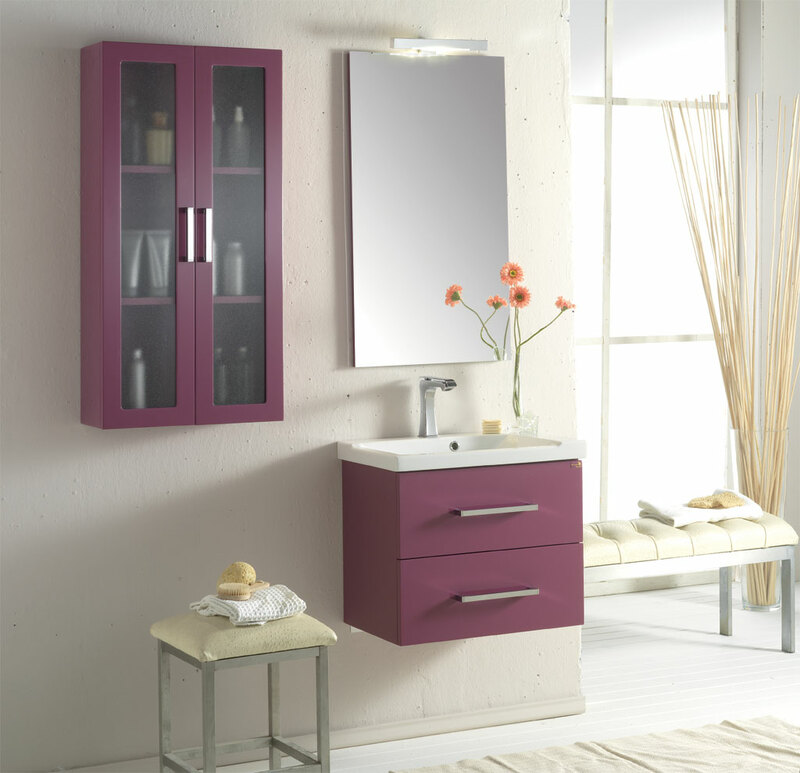 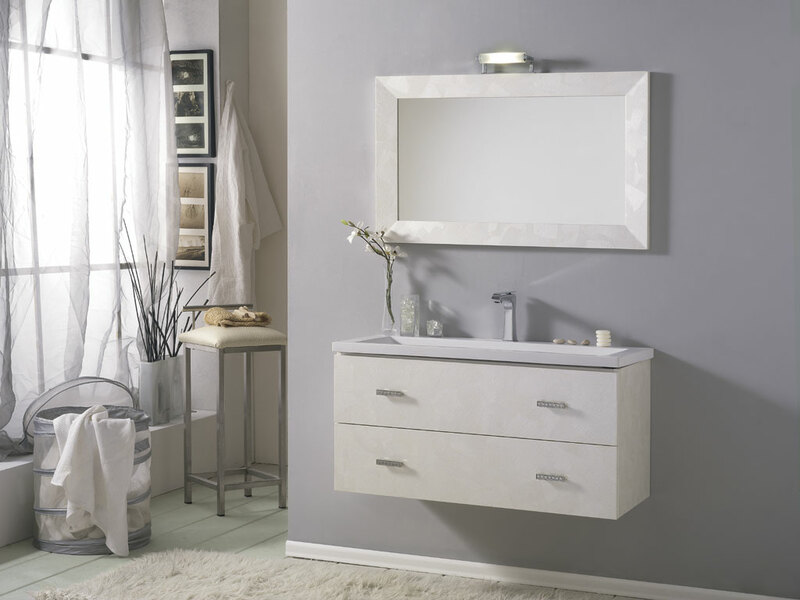 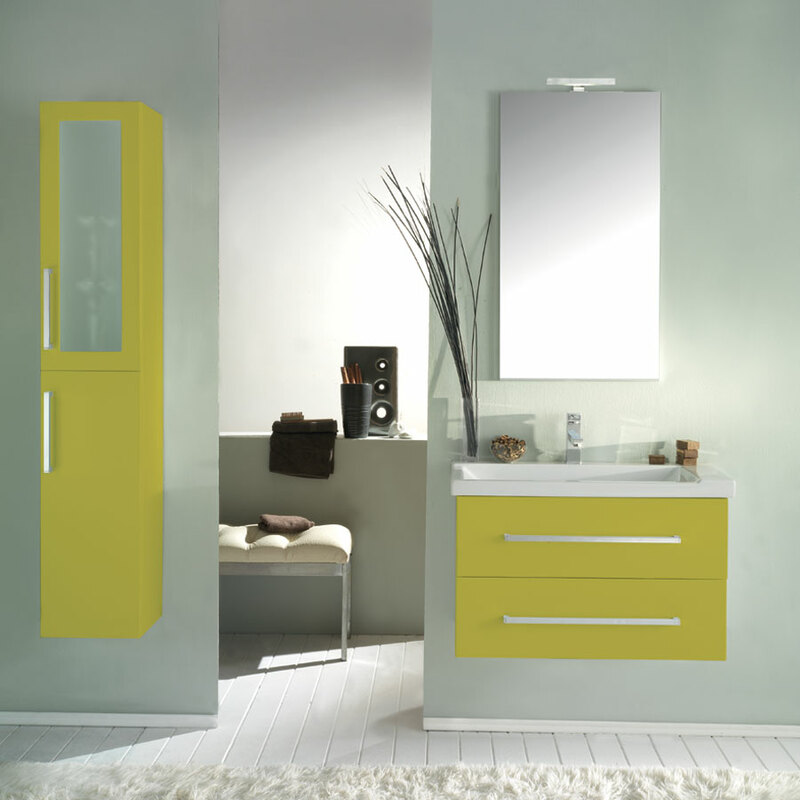 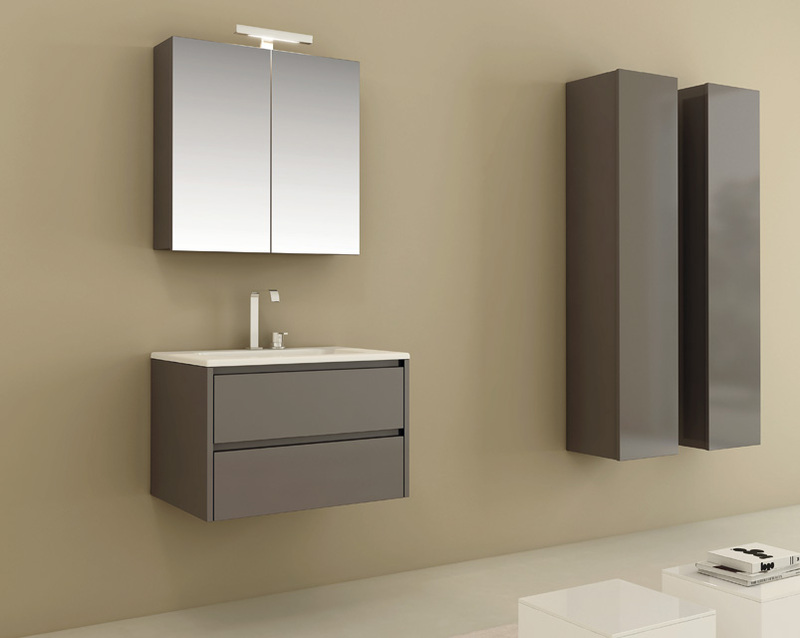 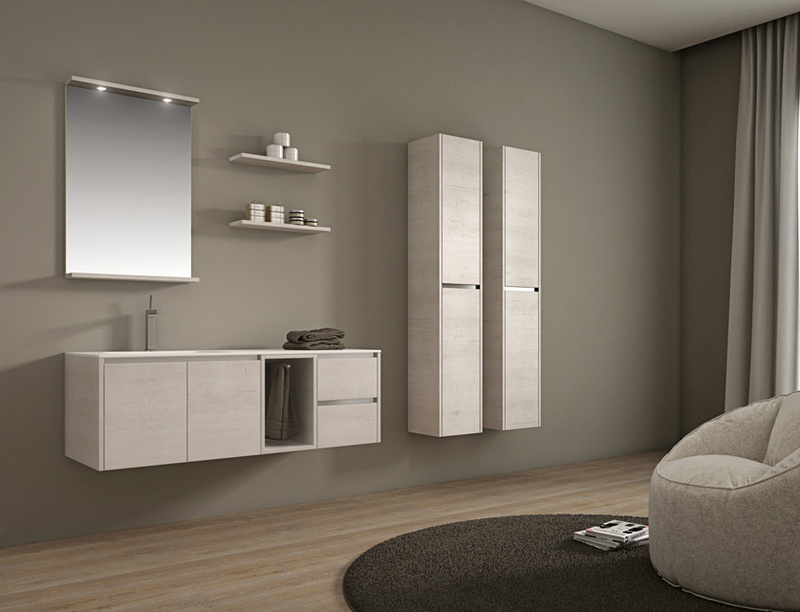 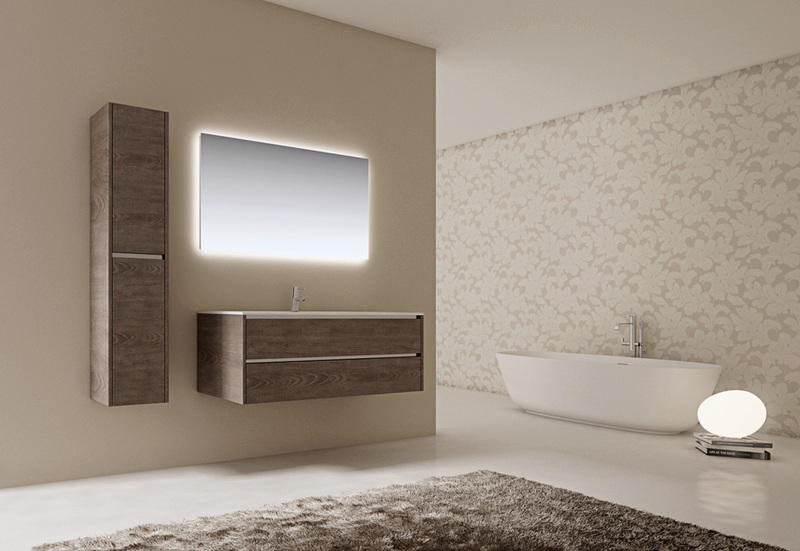 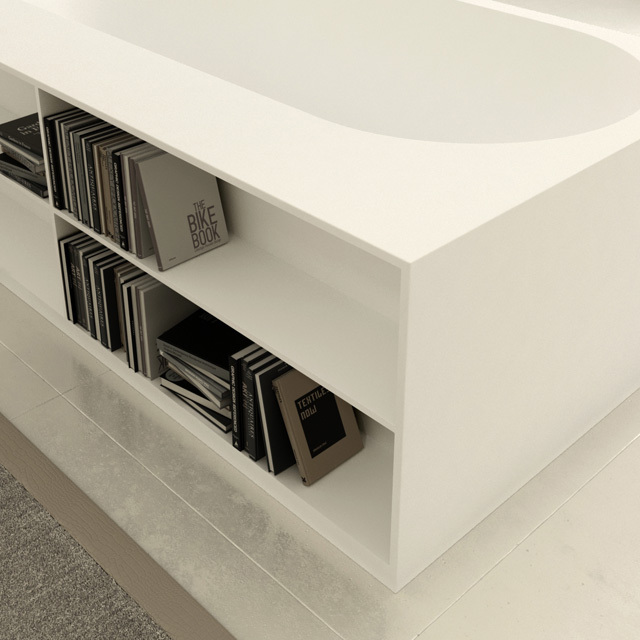 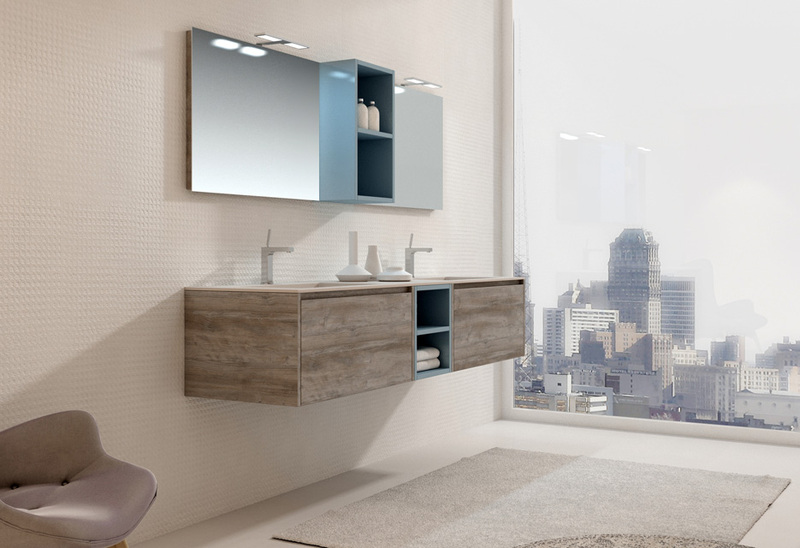 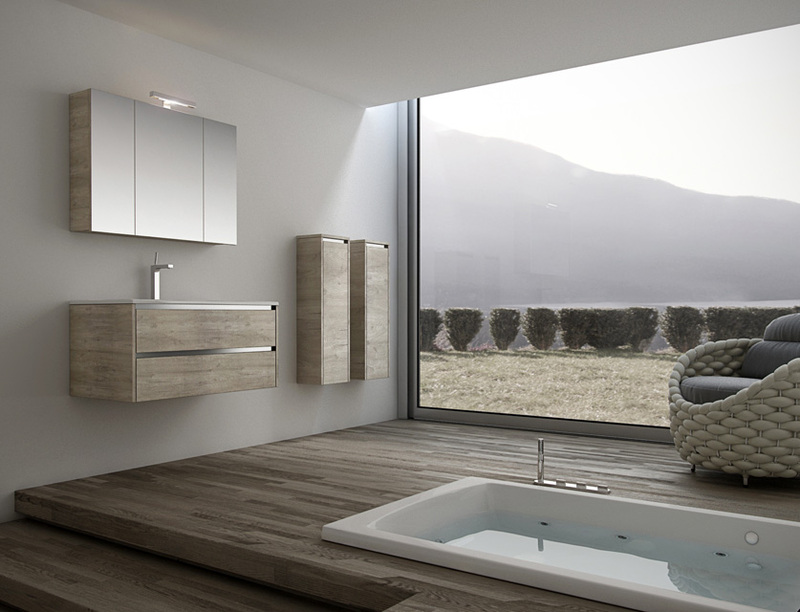 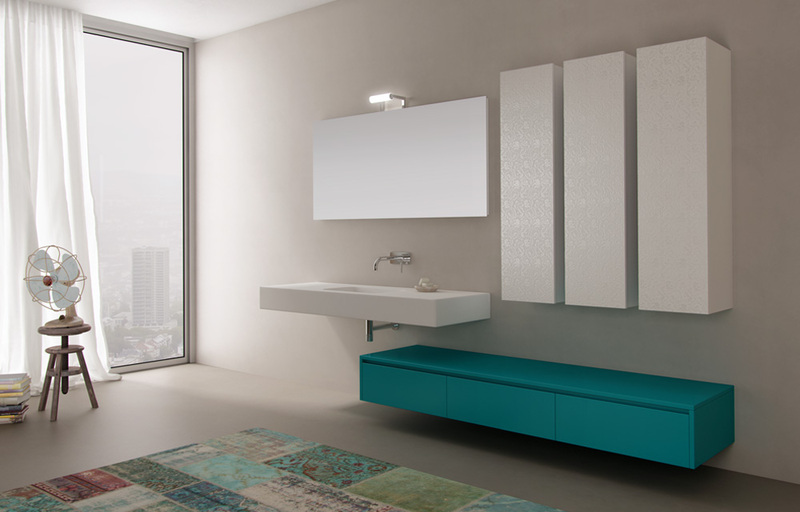 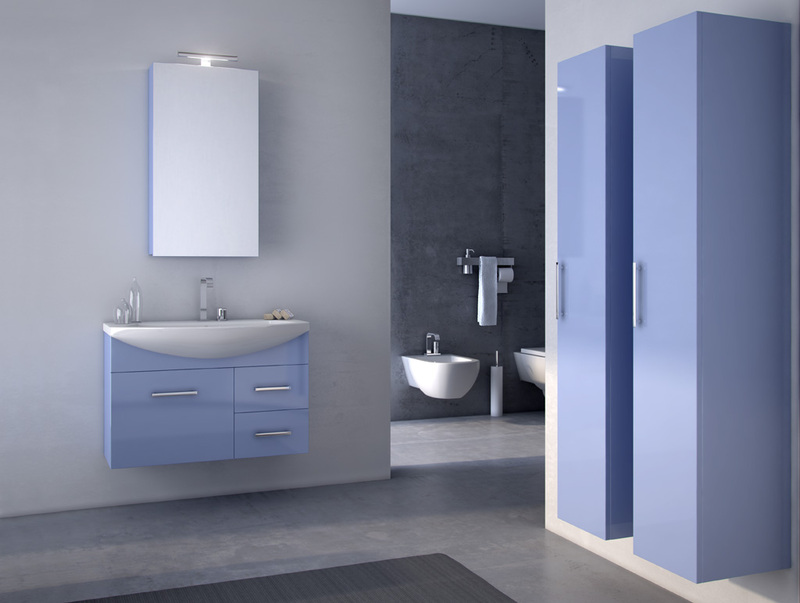 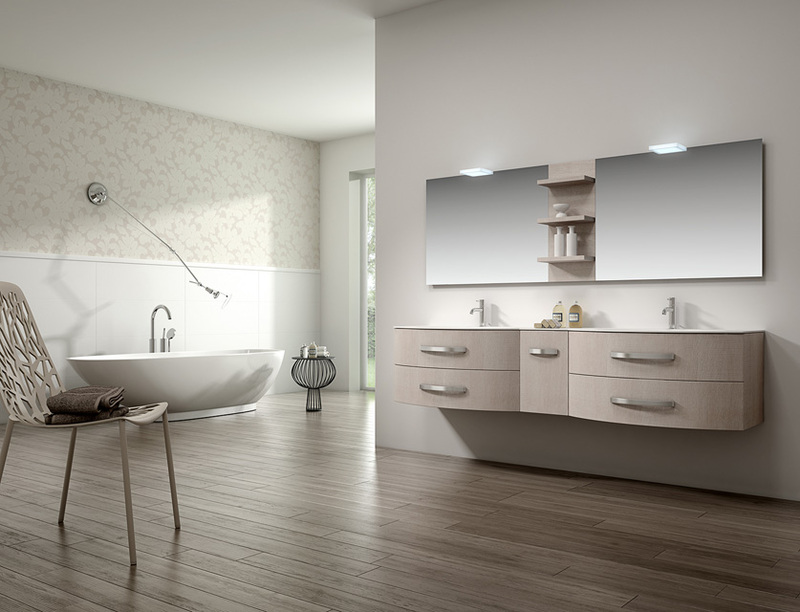 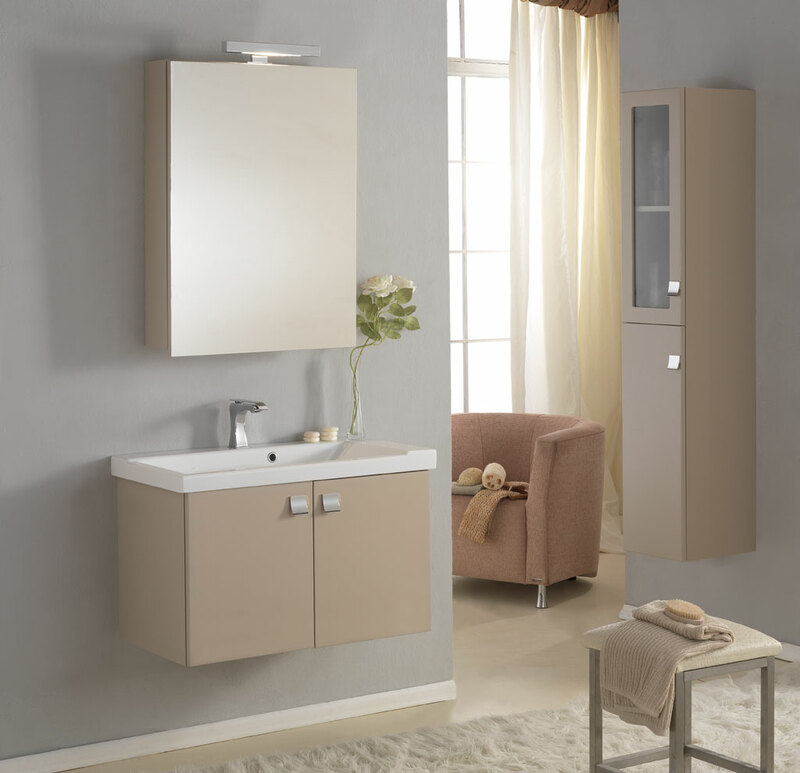 There are also wall units and columns suspended, essential to have a perfect bathroom. 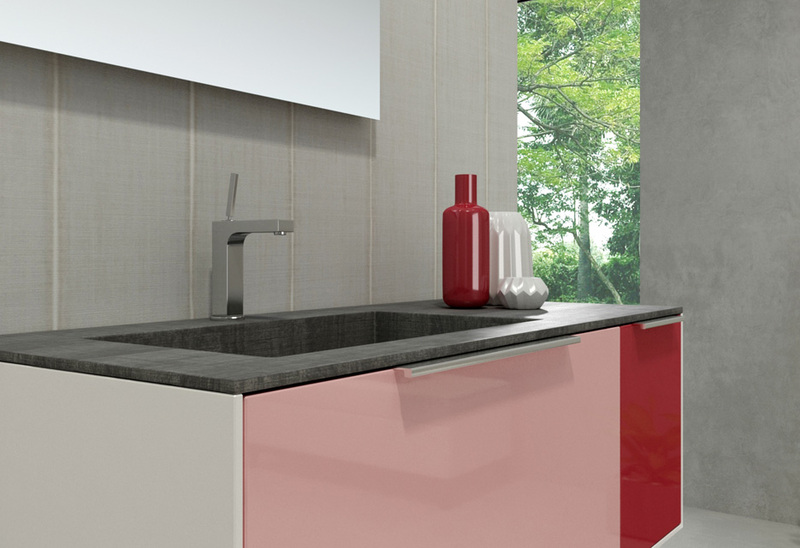 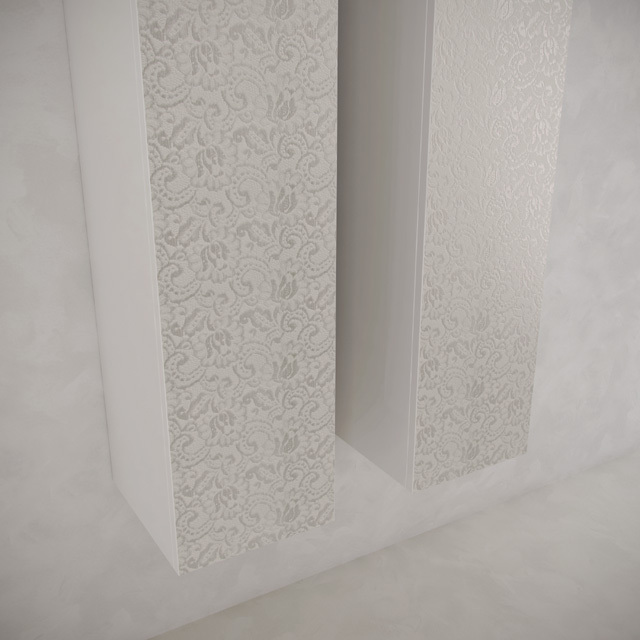 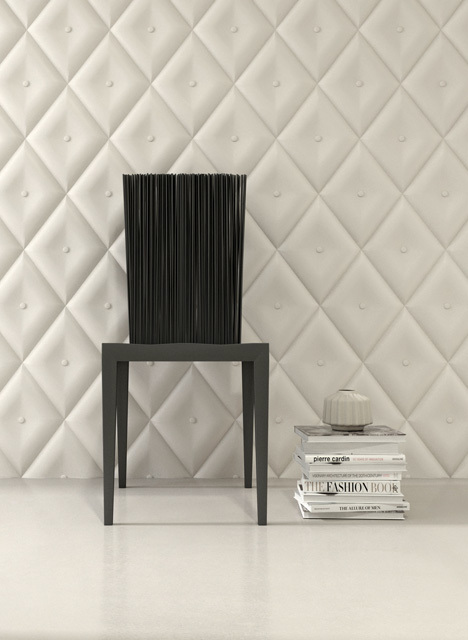 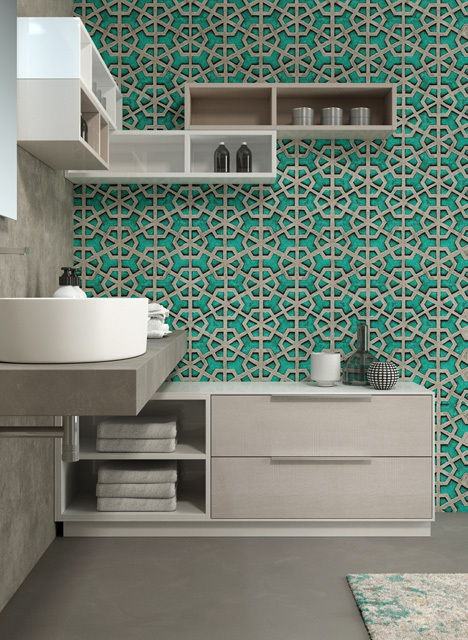 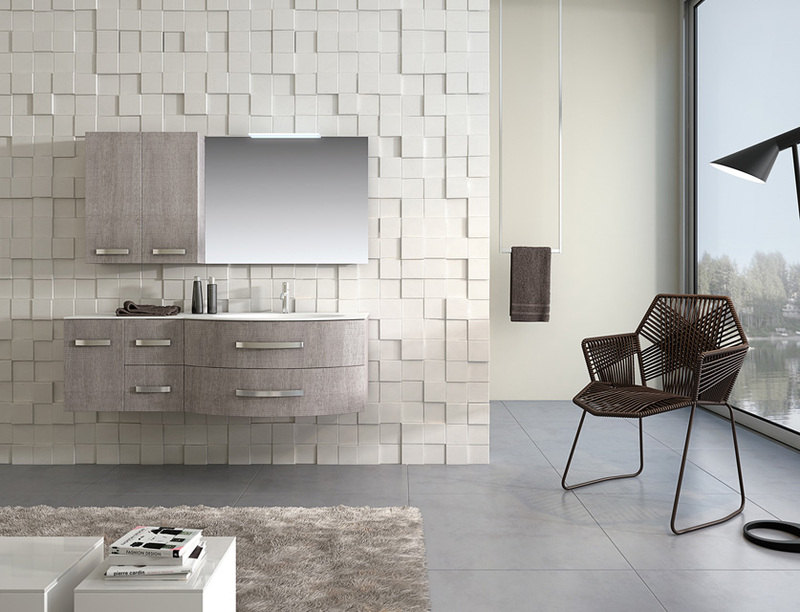 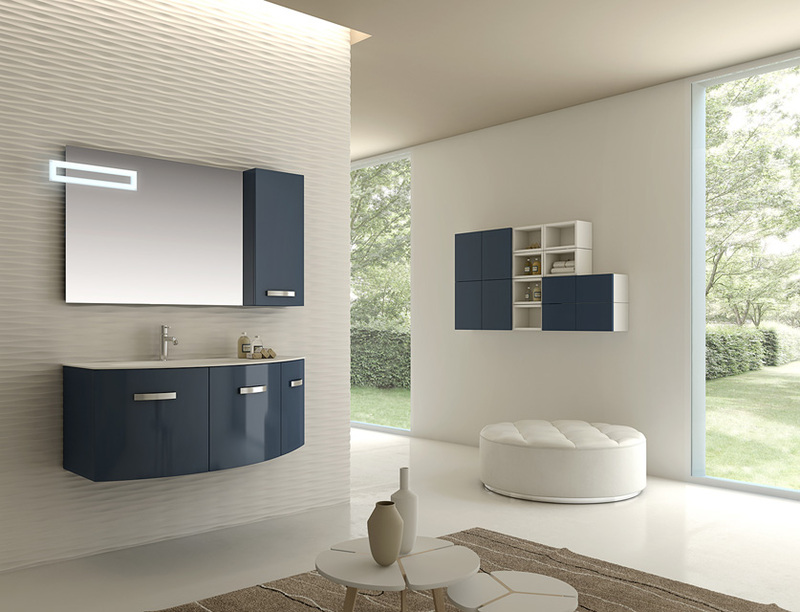 The spring collection is a modernity and elegance choice, which follow the color’s trends of ceramics. 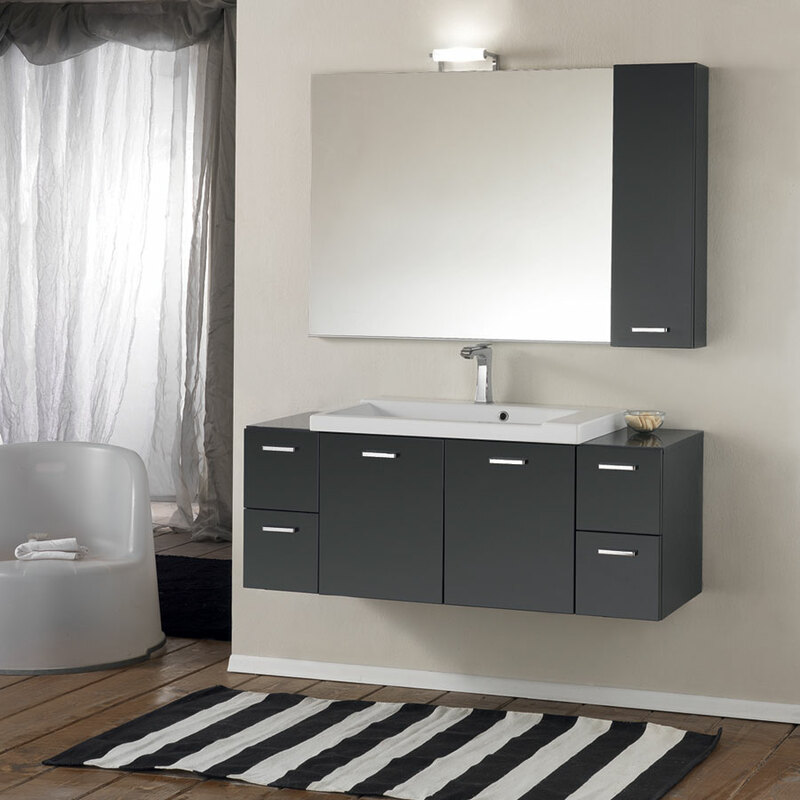 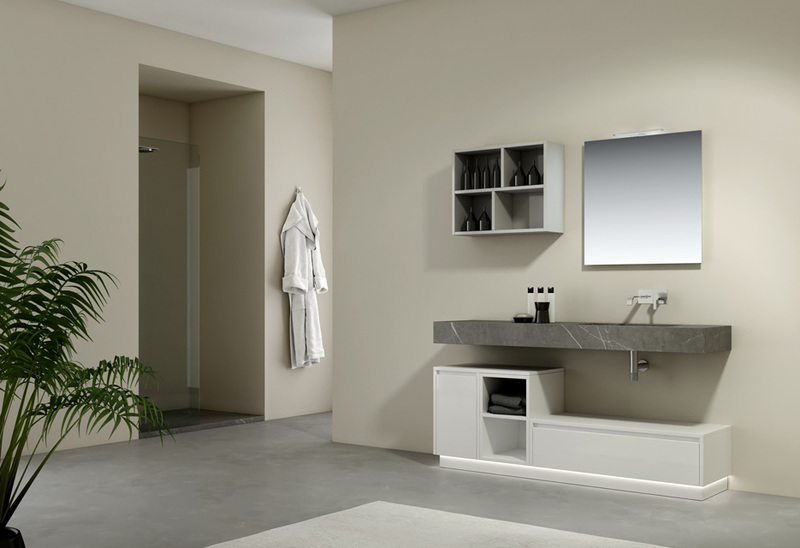 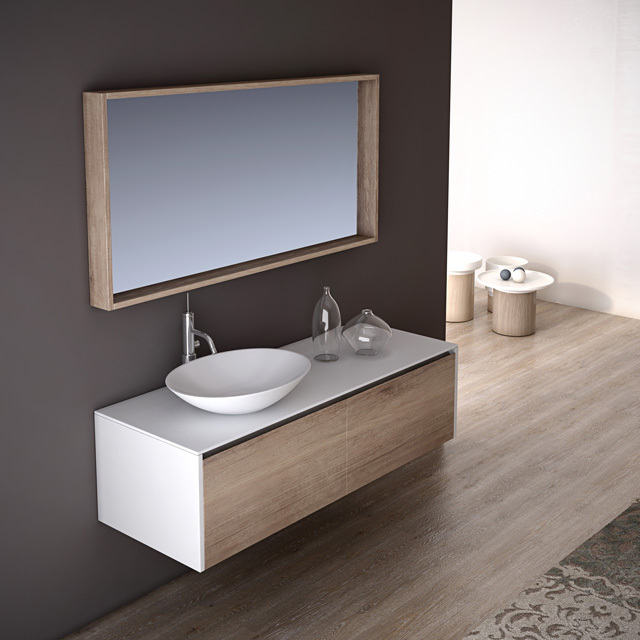 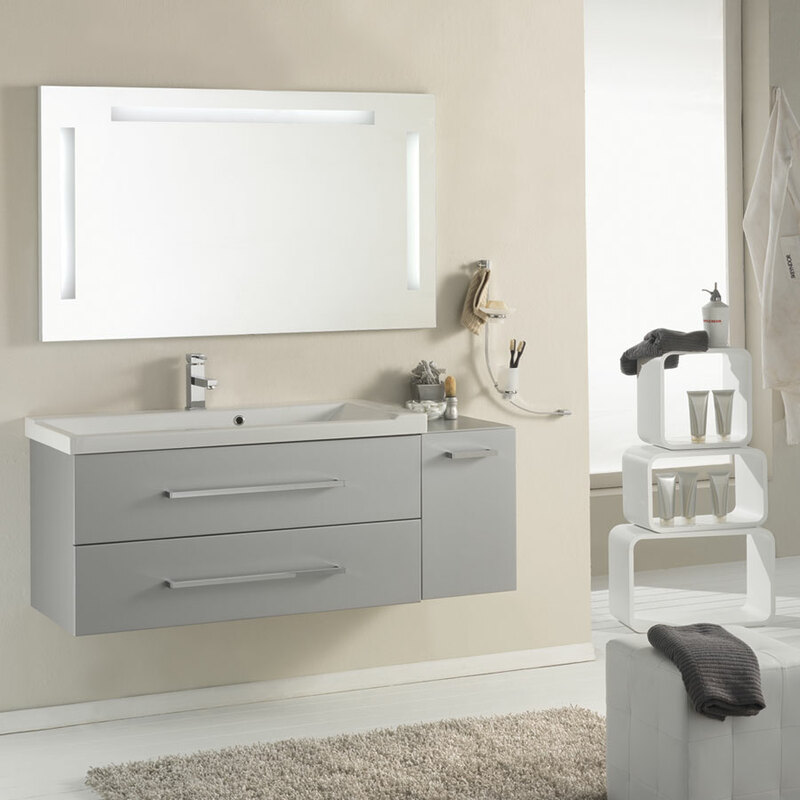 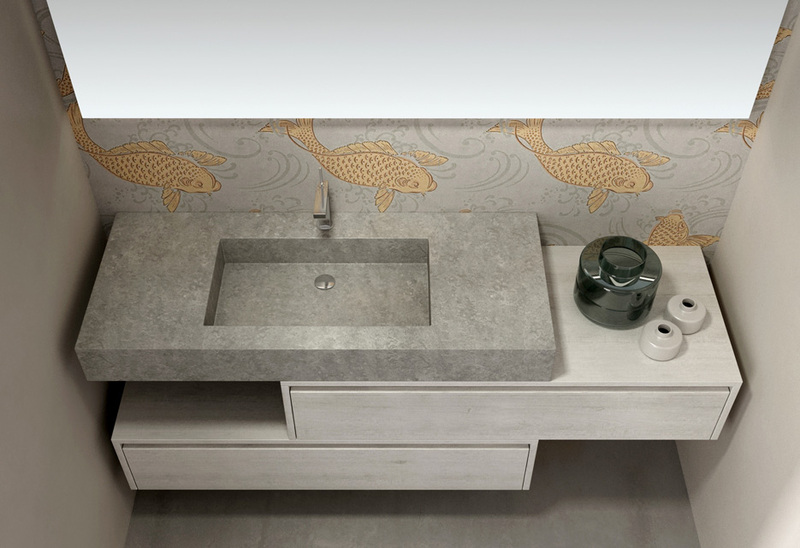 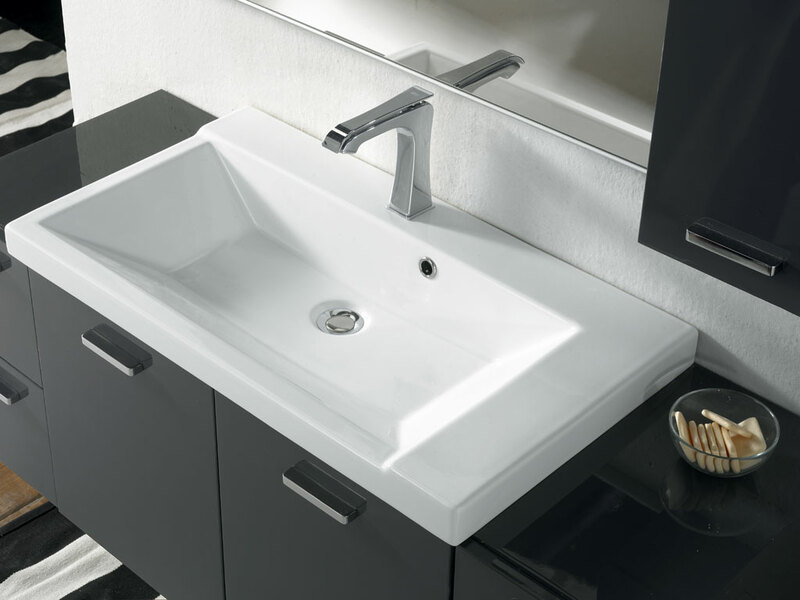 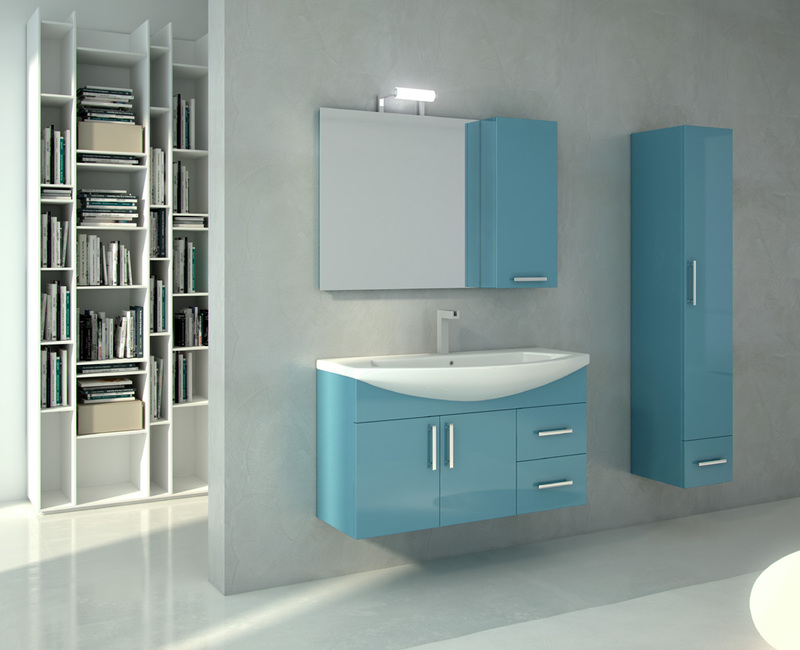 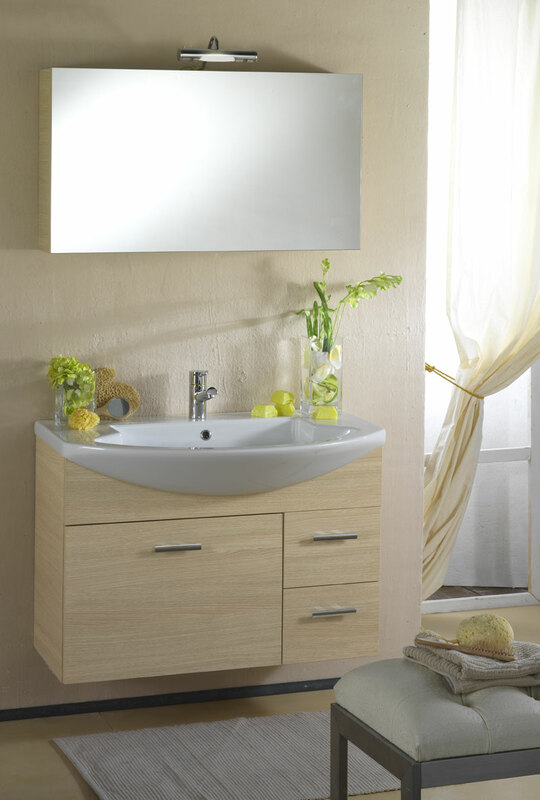 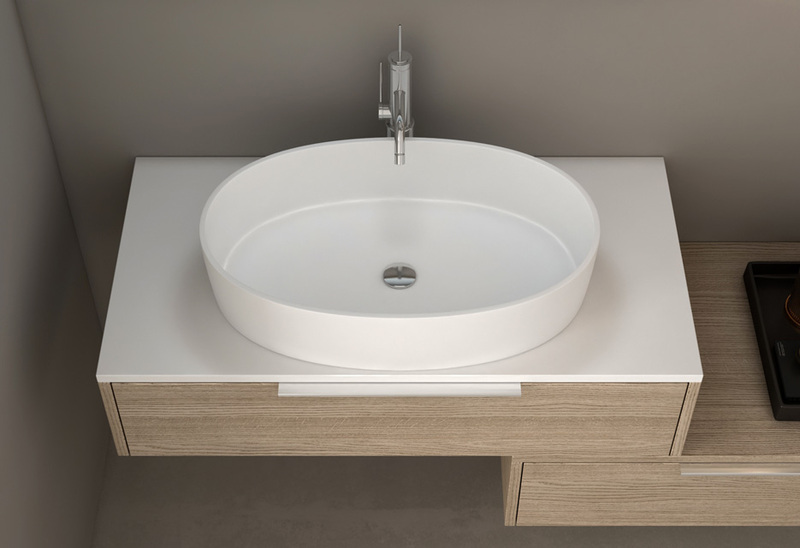 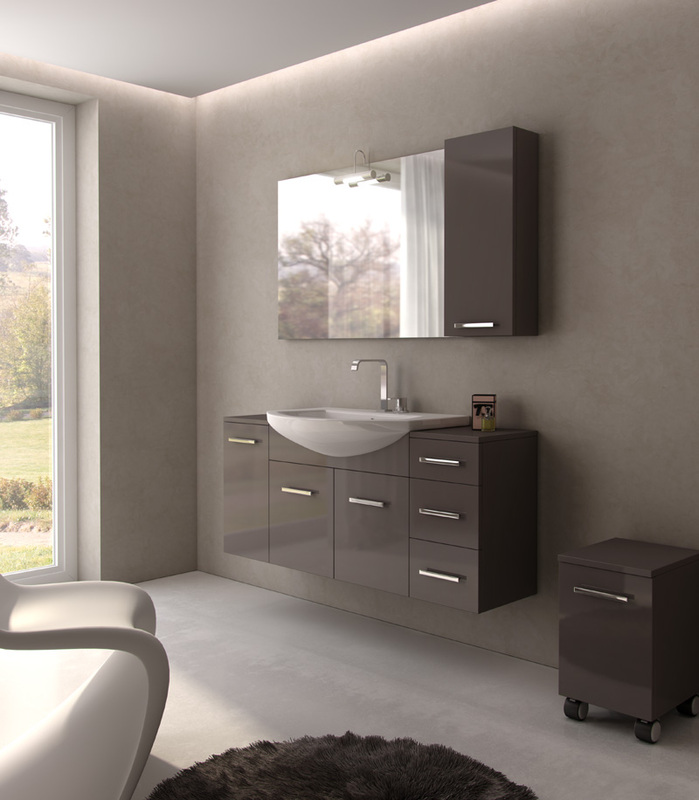 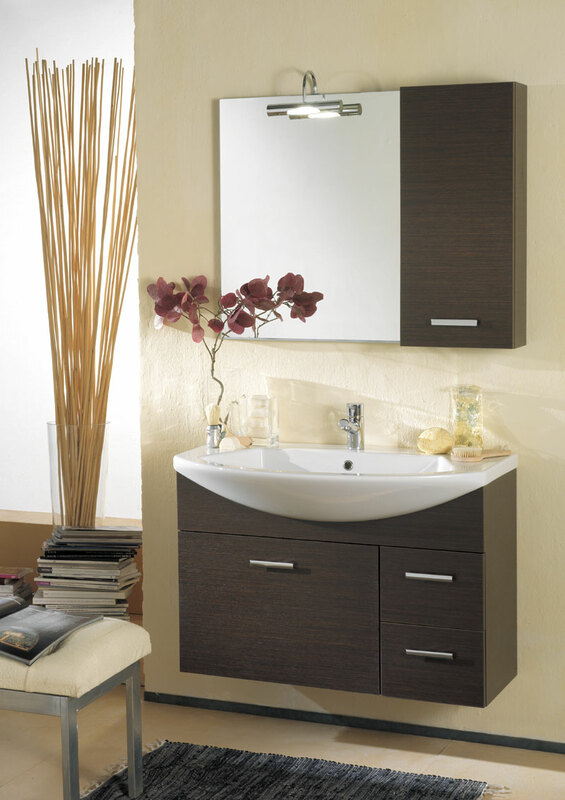 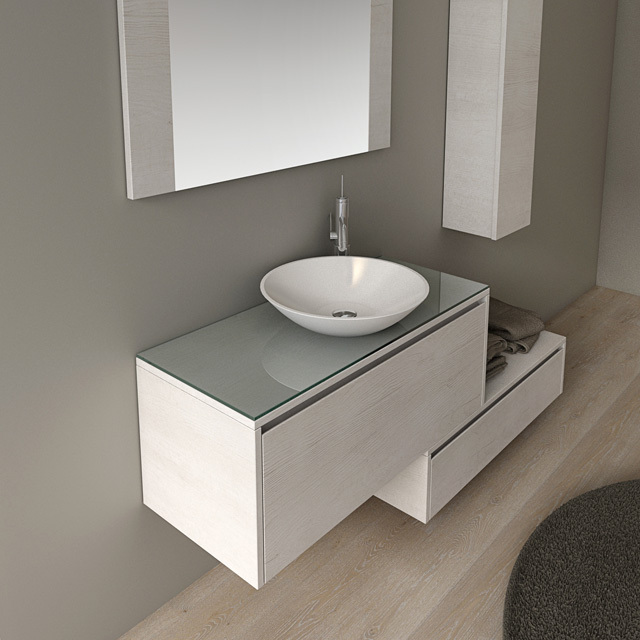 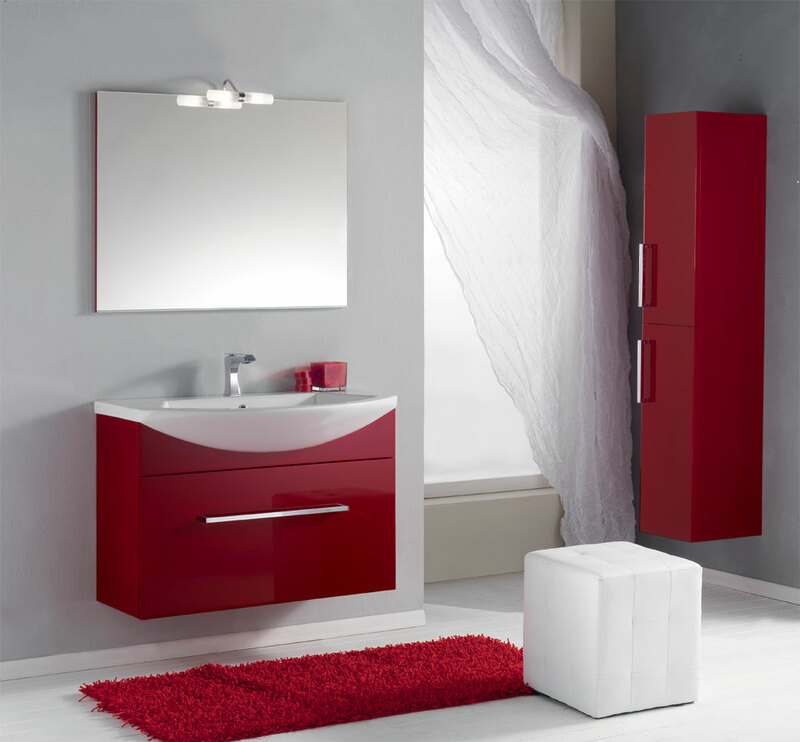 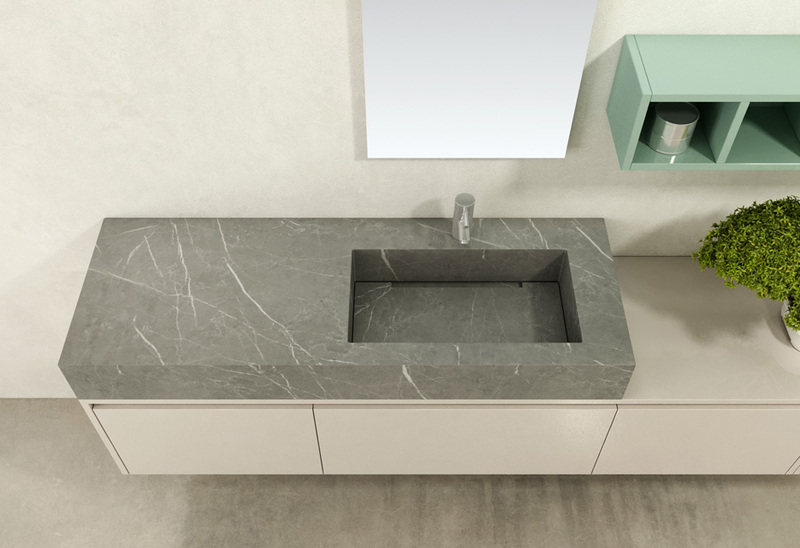 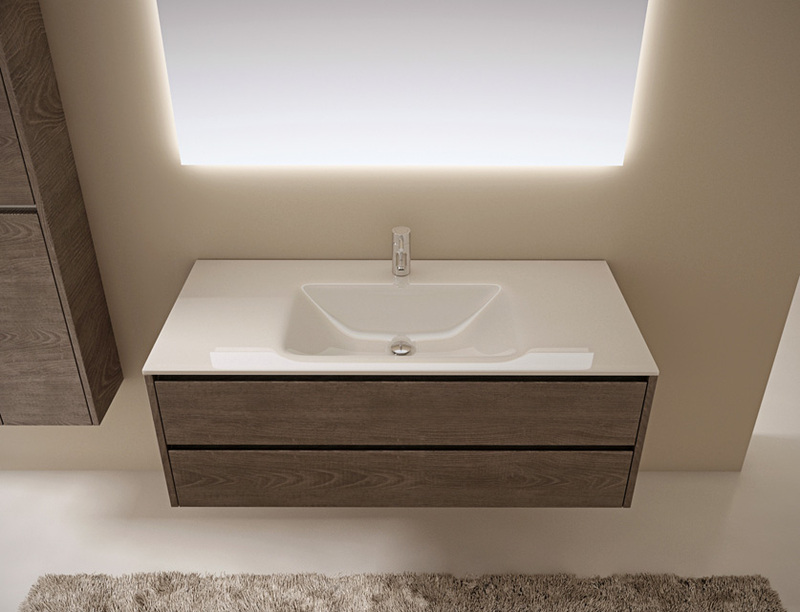 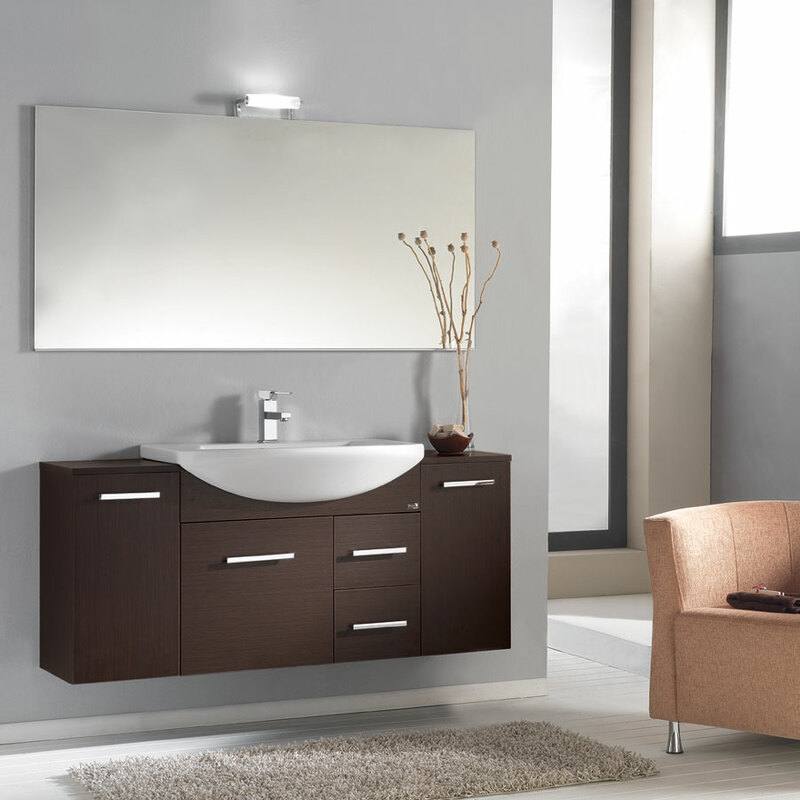 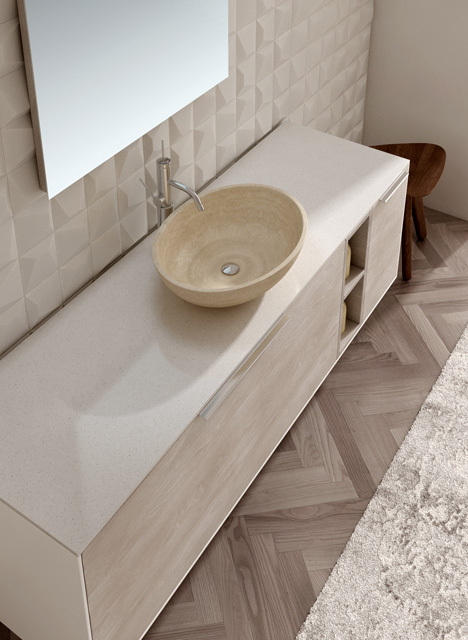 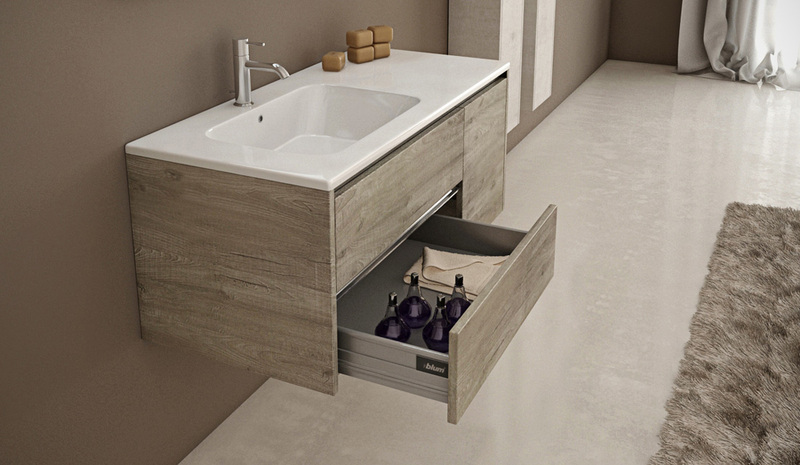 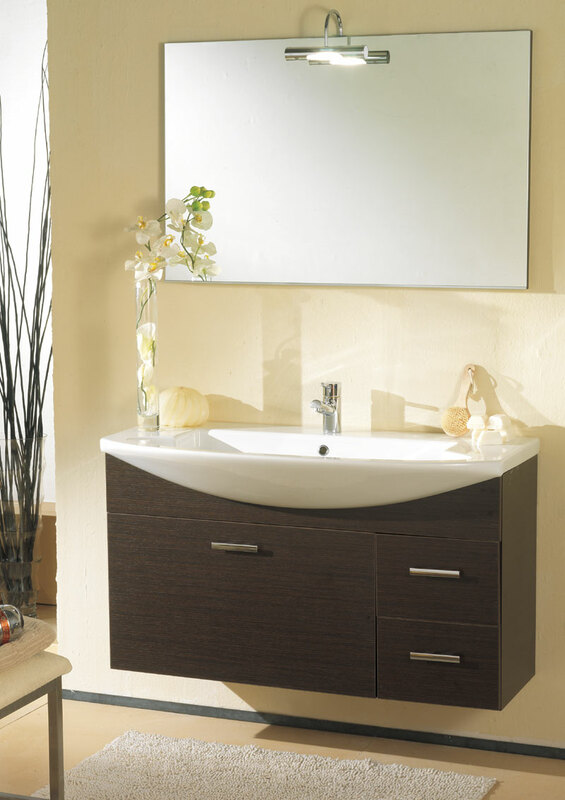 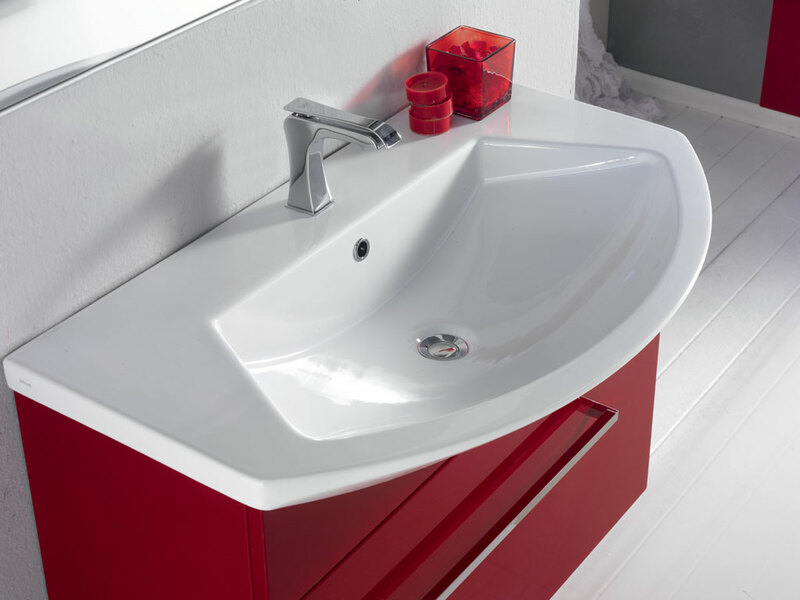 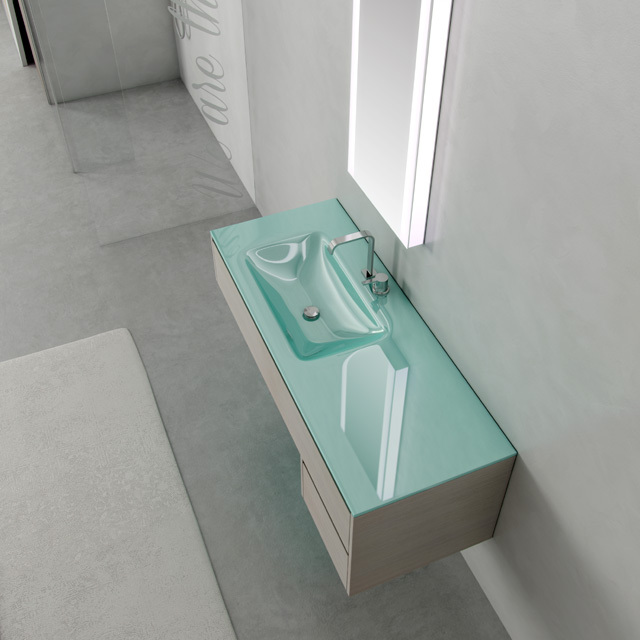 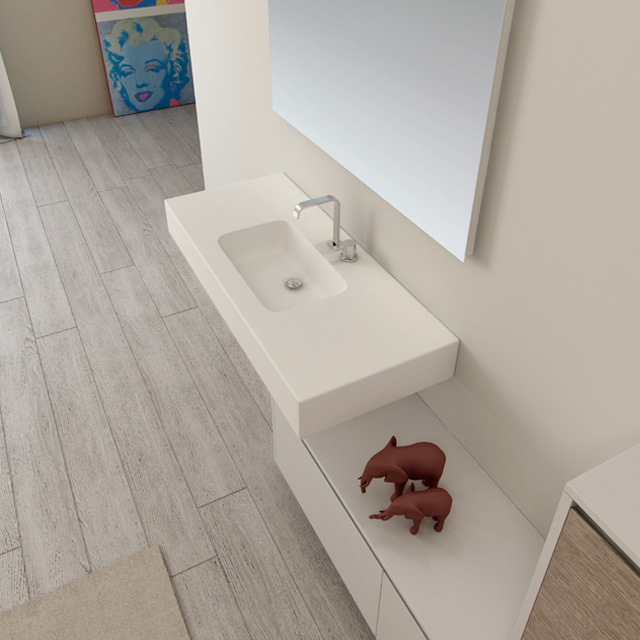 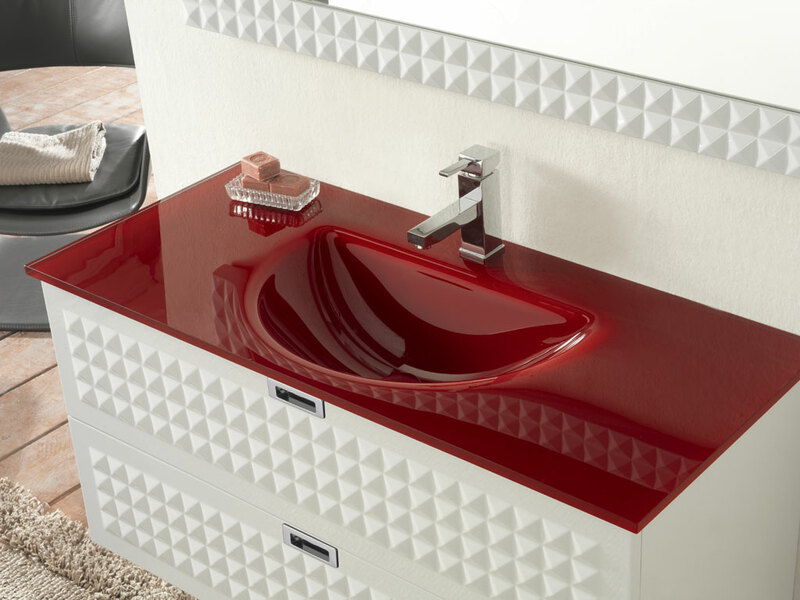 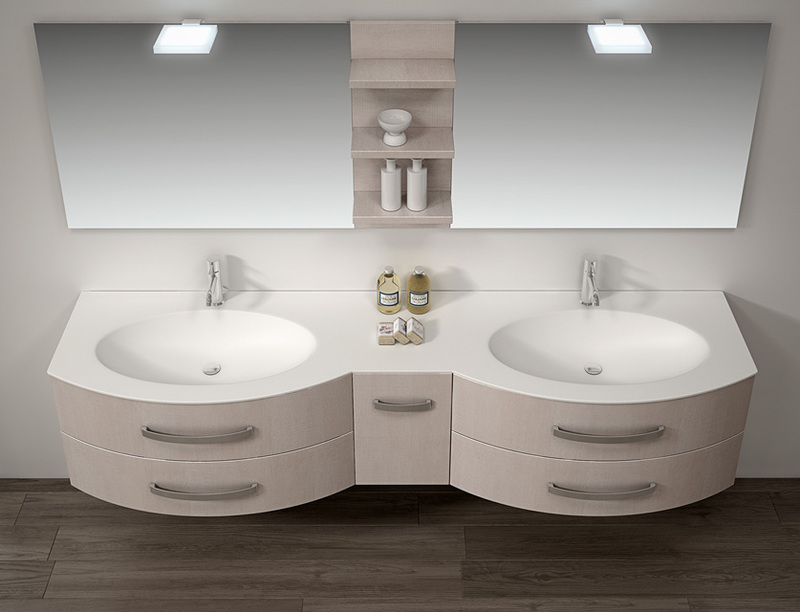 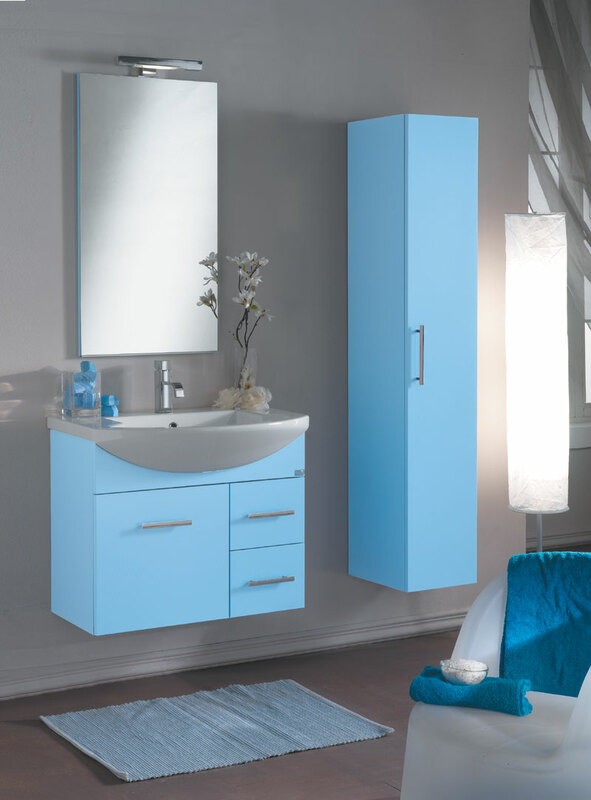 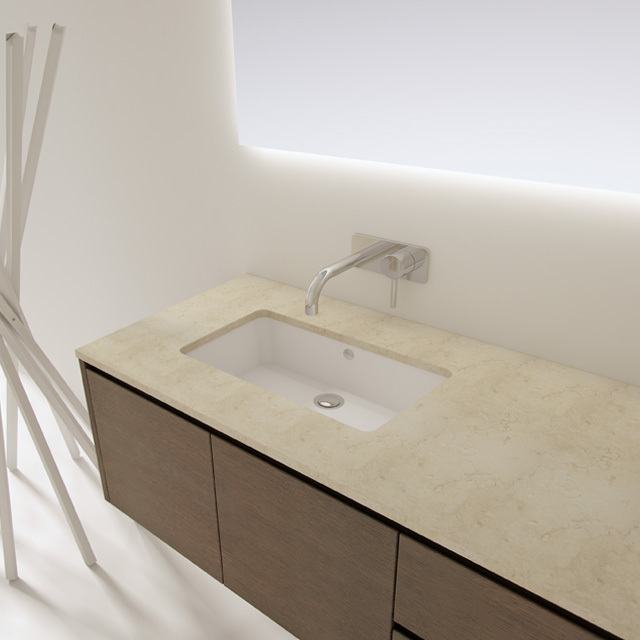 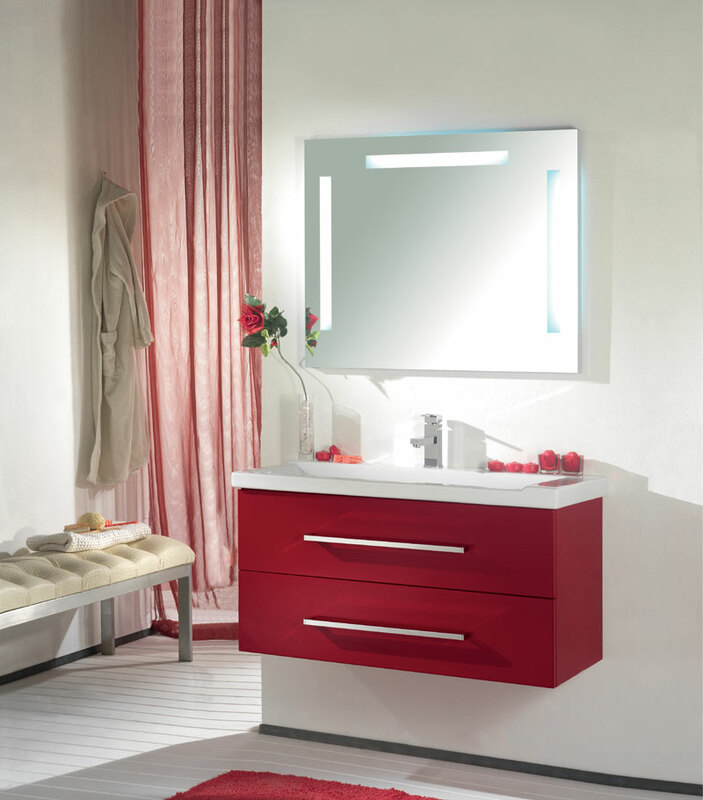 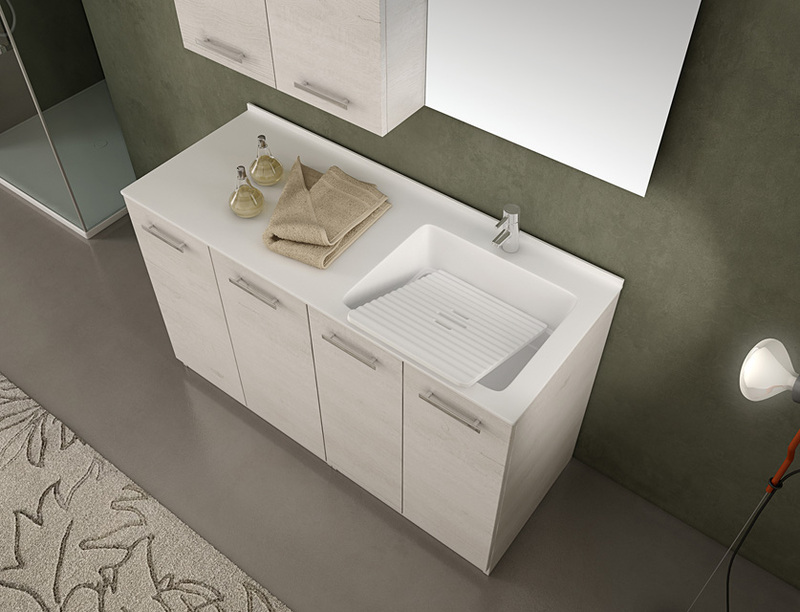 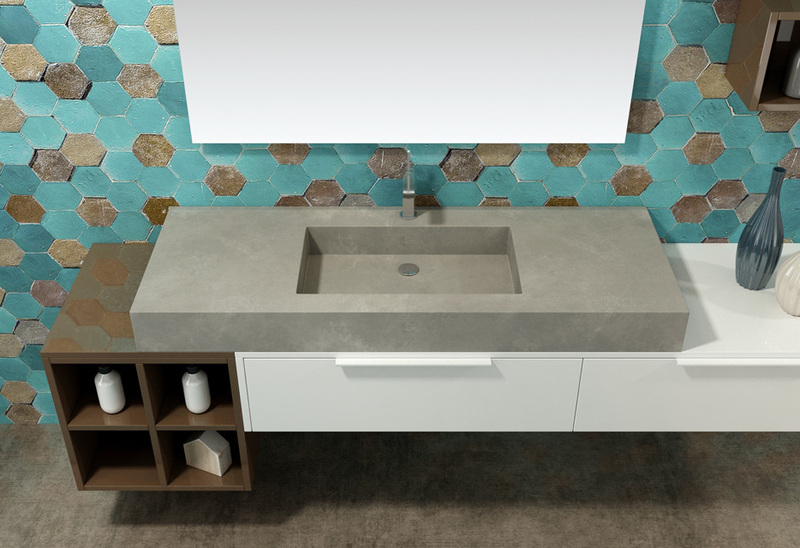 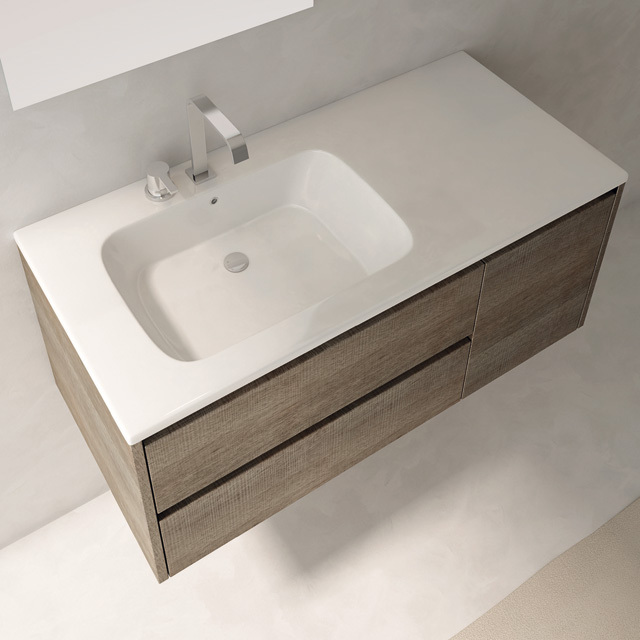 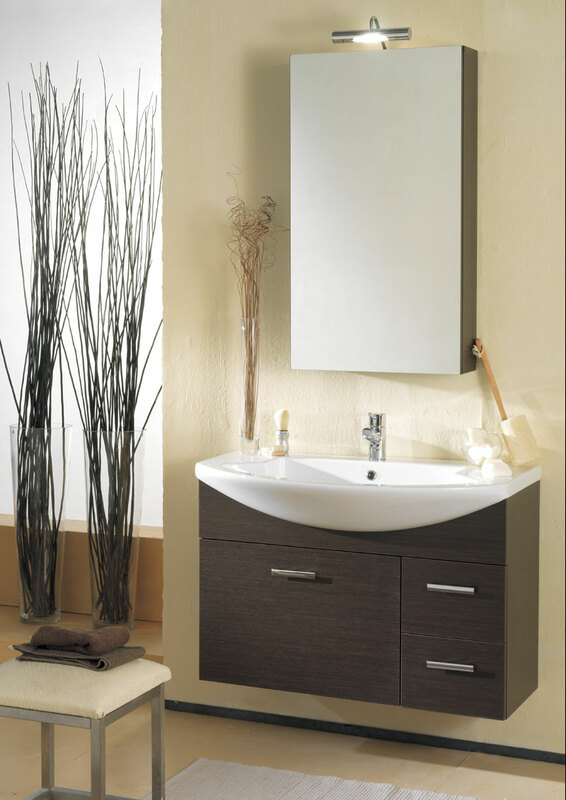 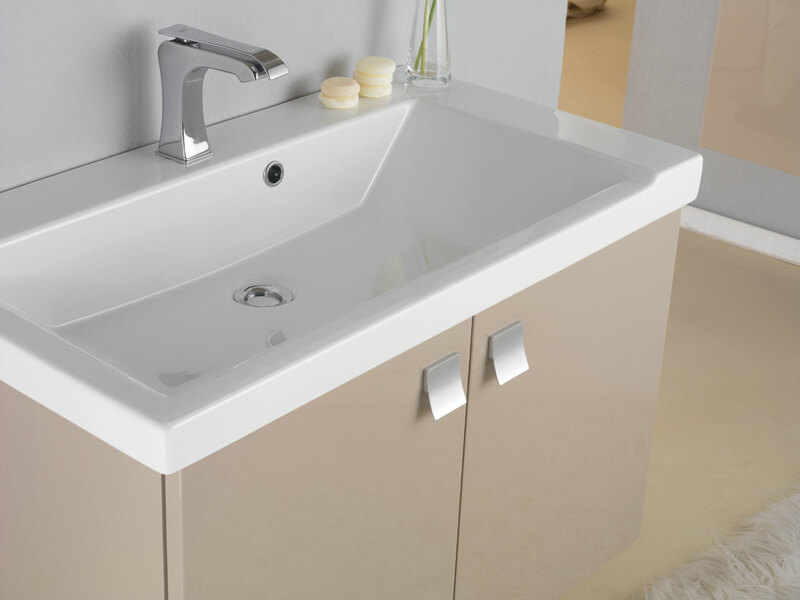 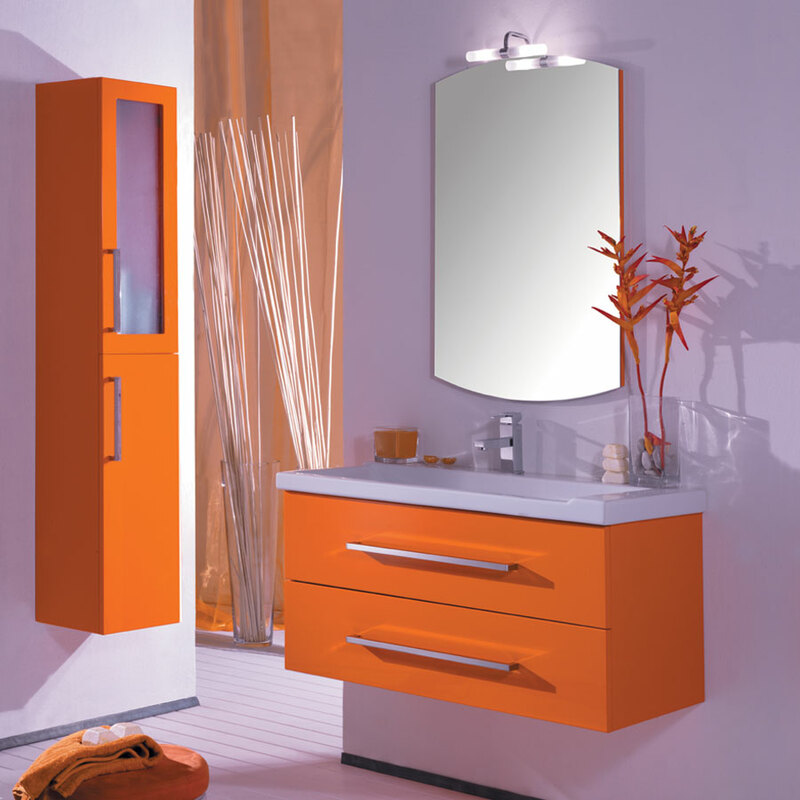 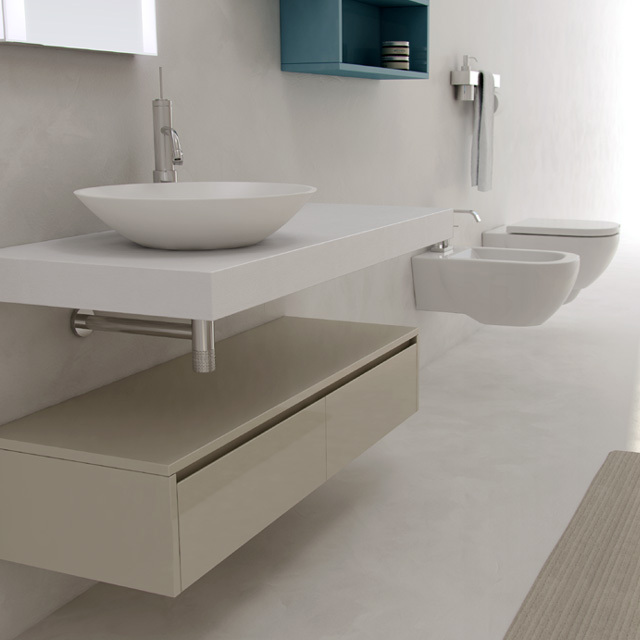 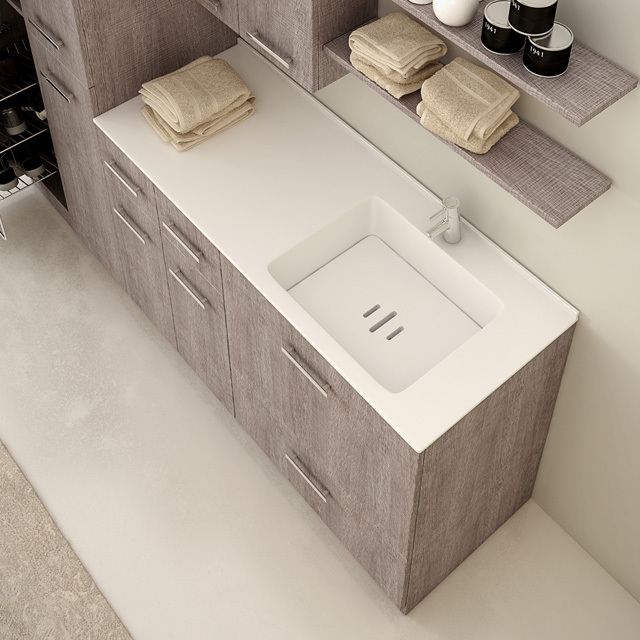 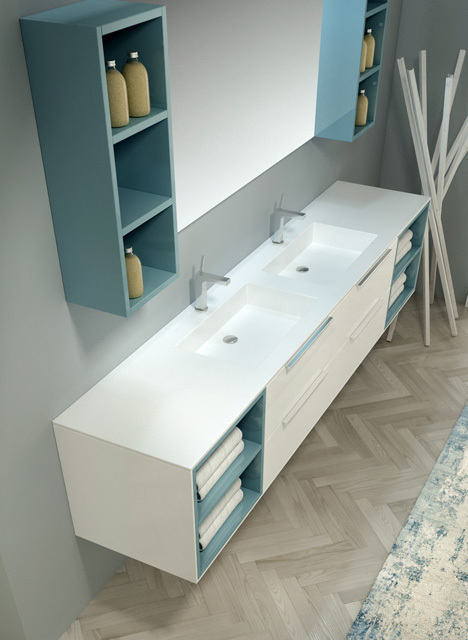 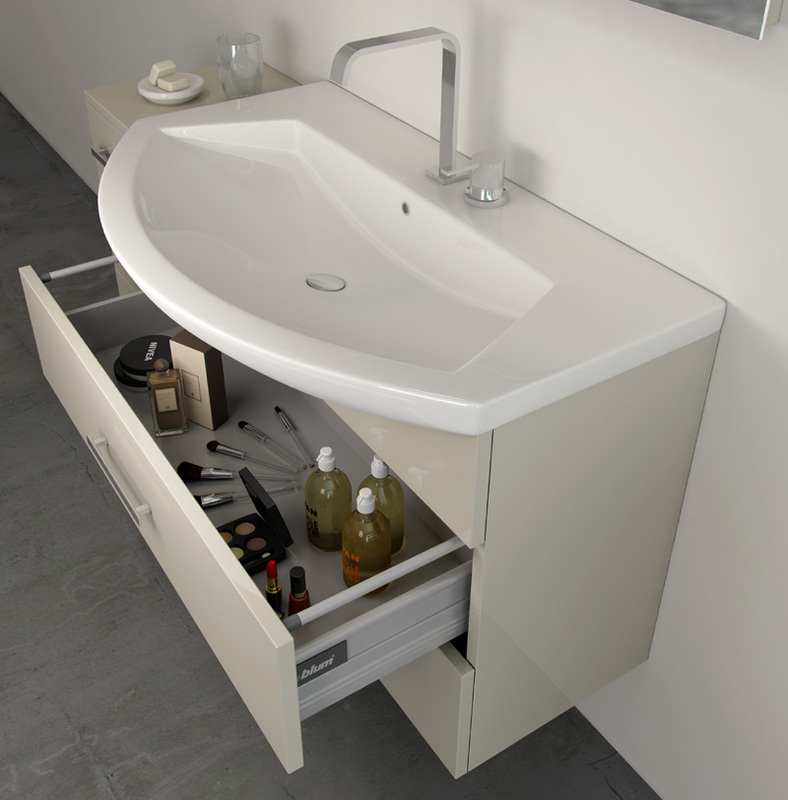 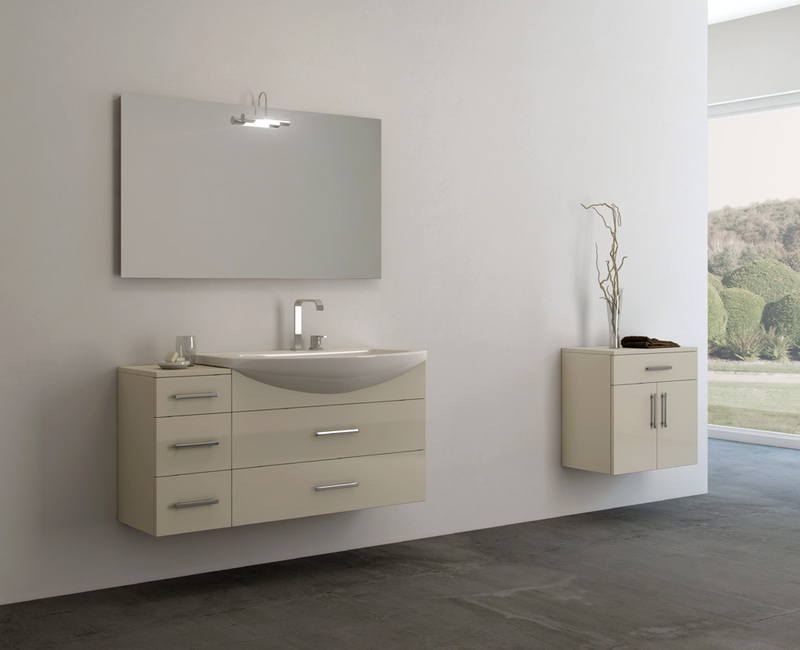 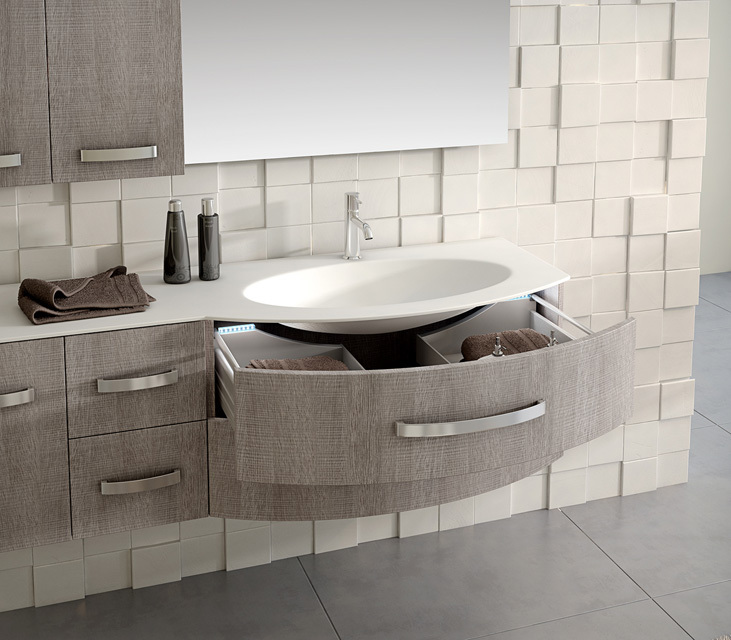 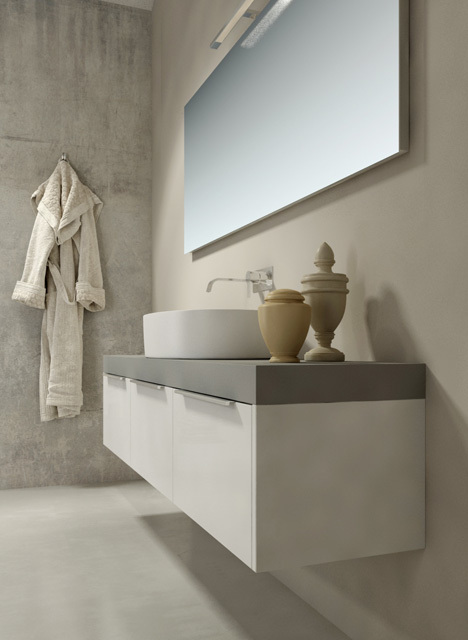 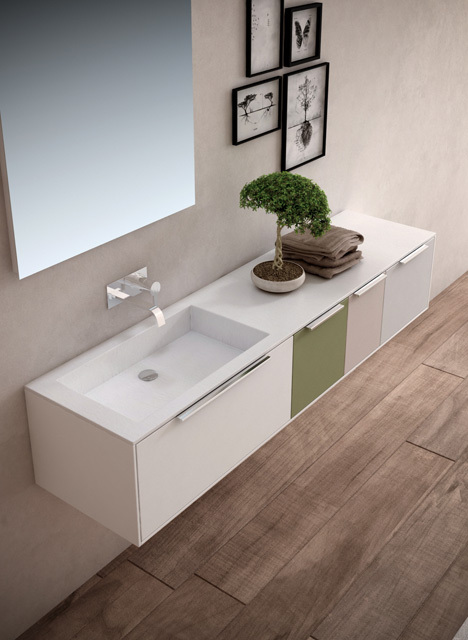 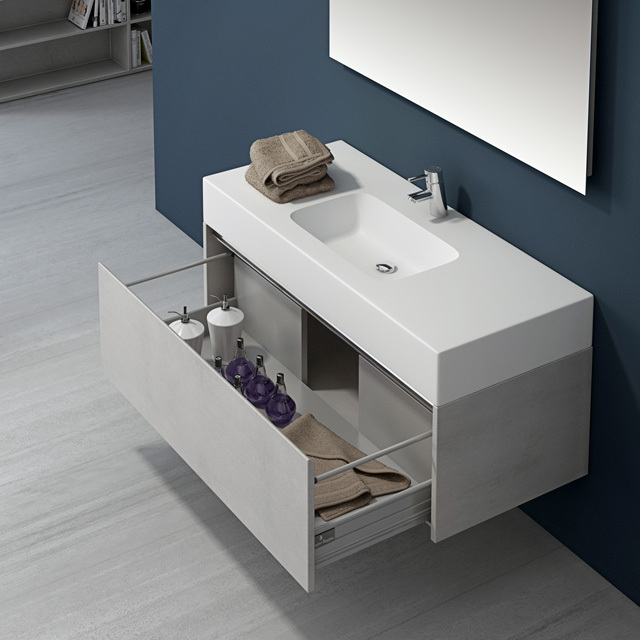 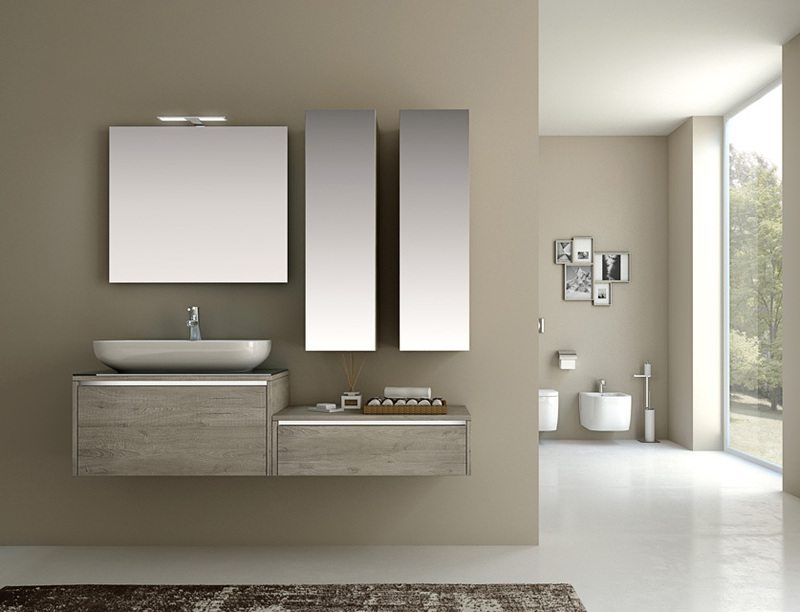 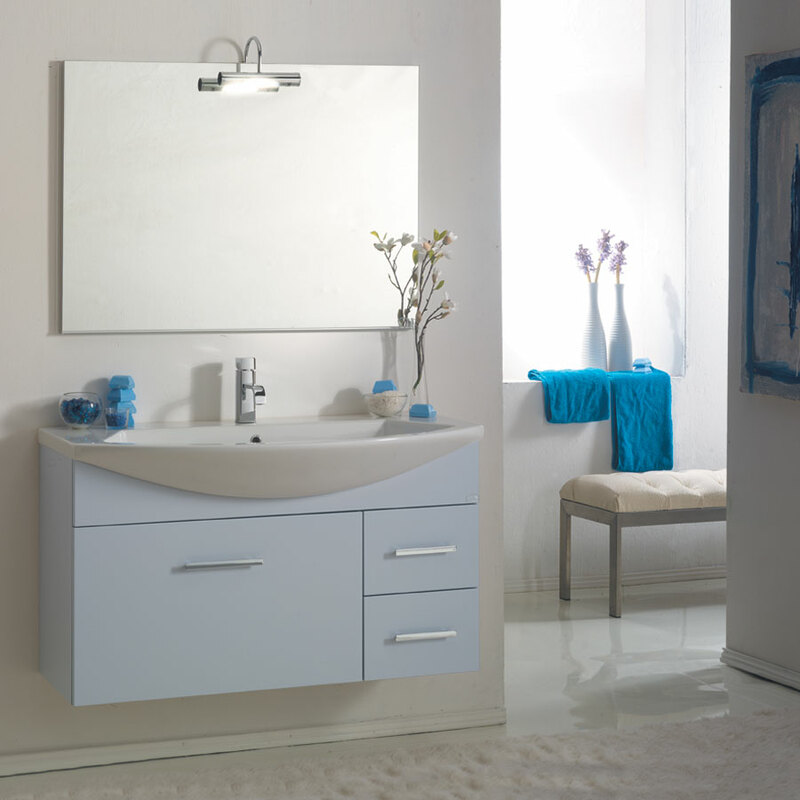 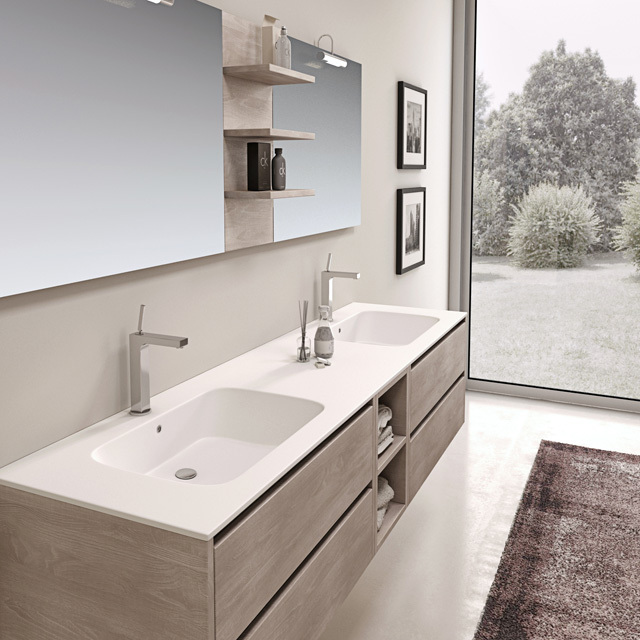 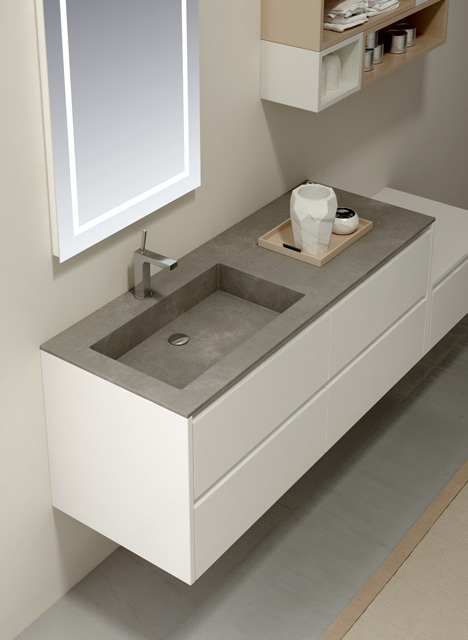 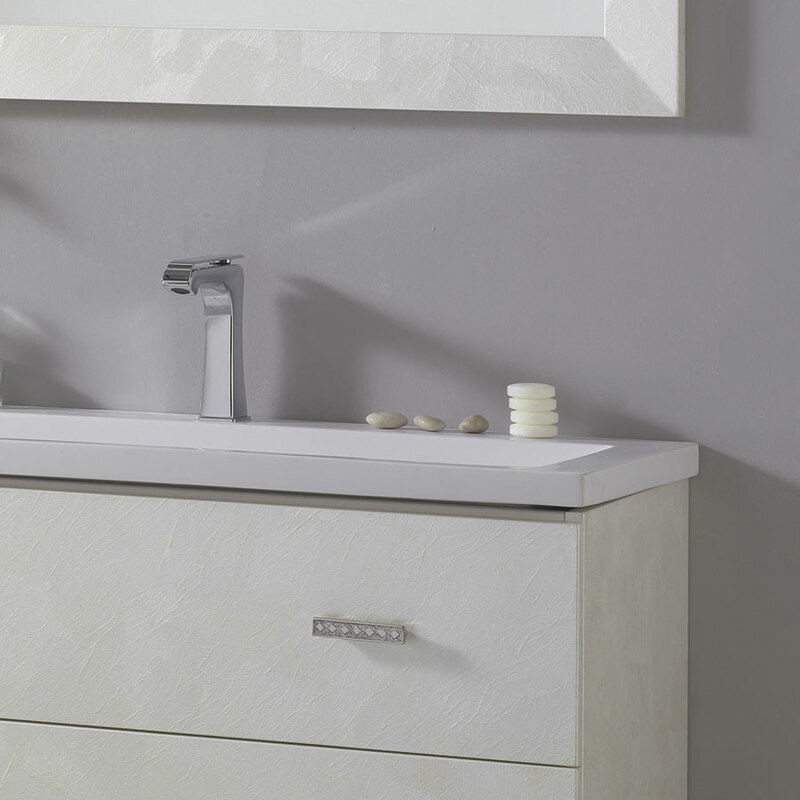 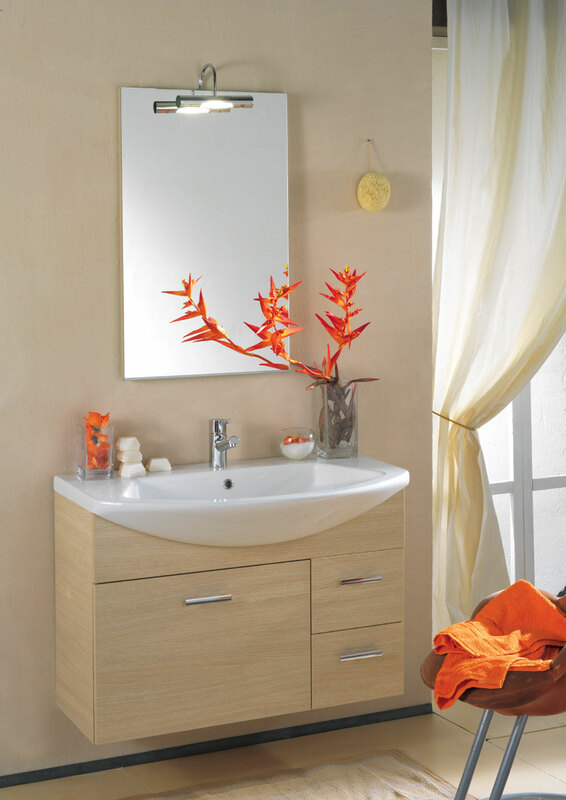 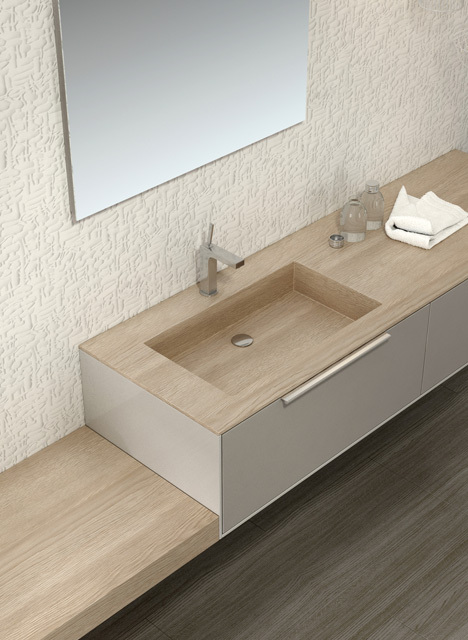 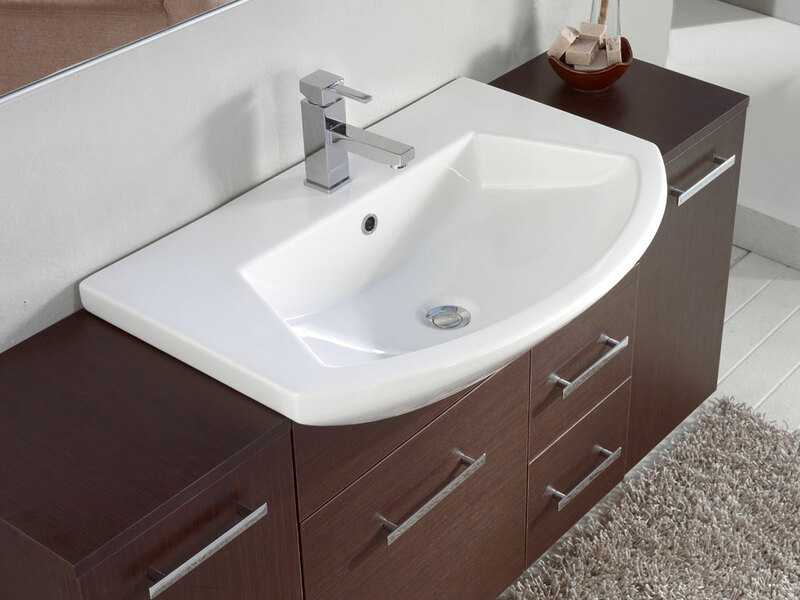 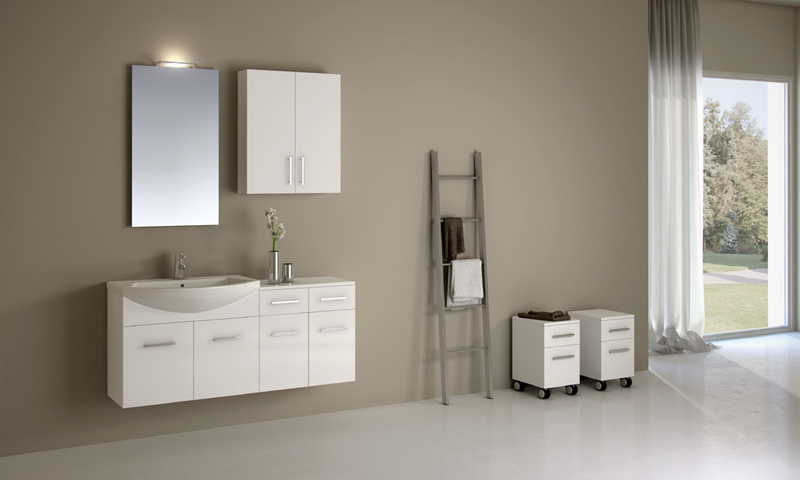 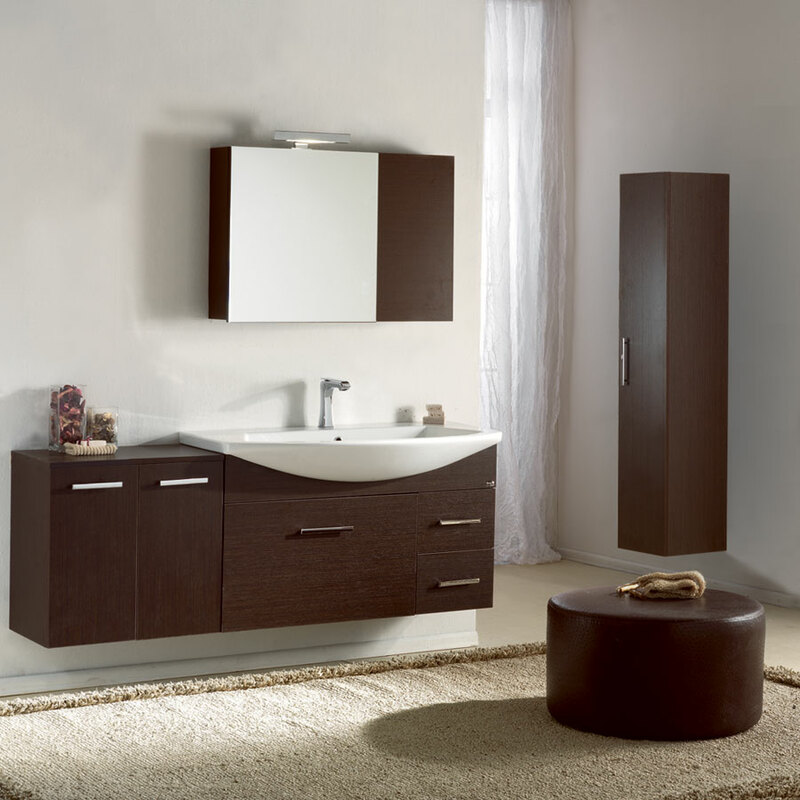 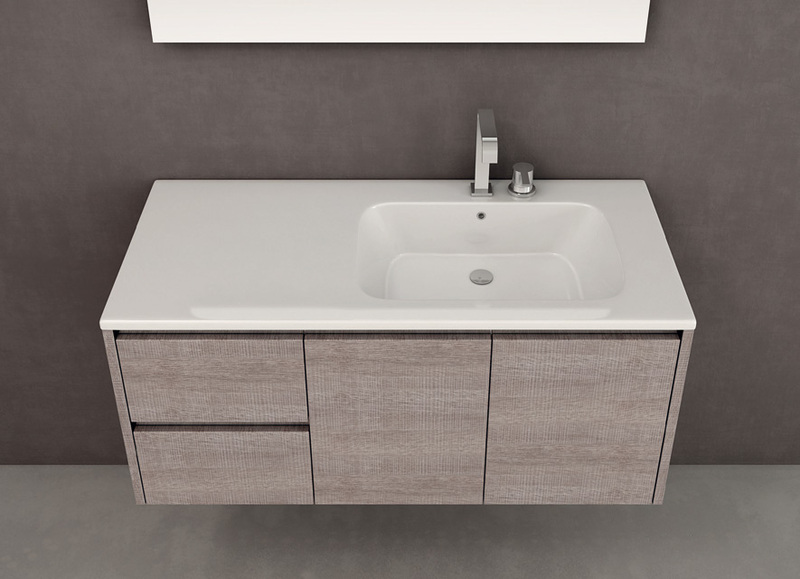 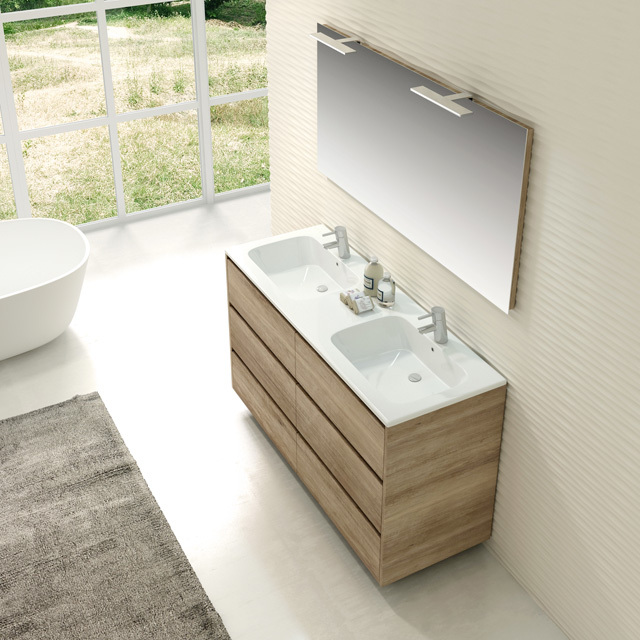 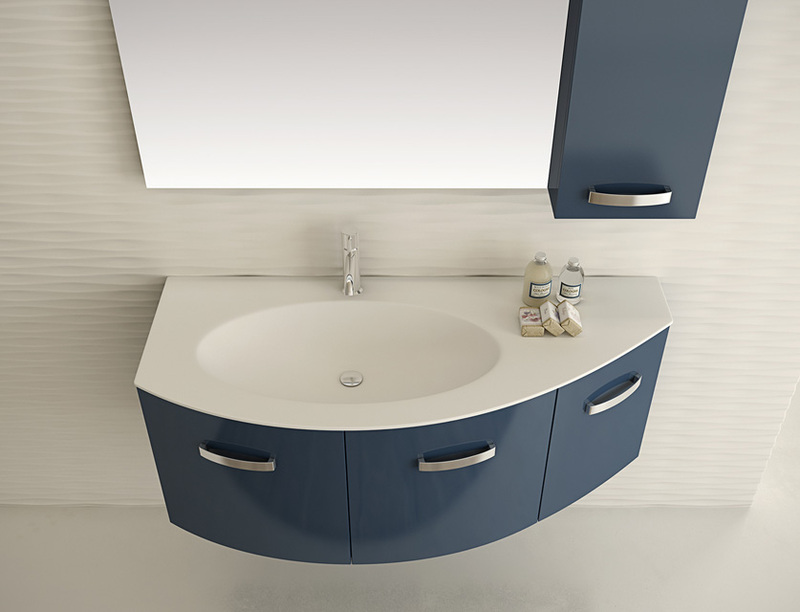 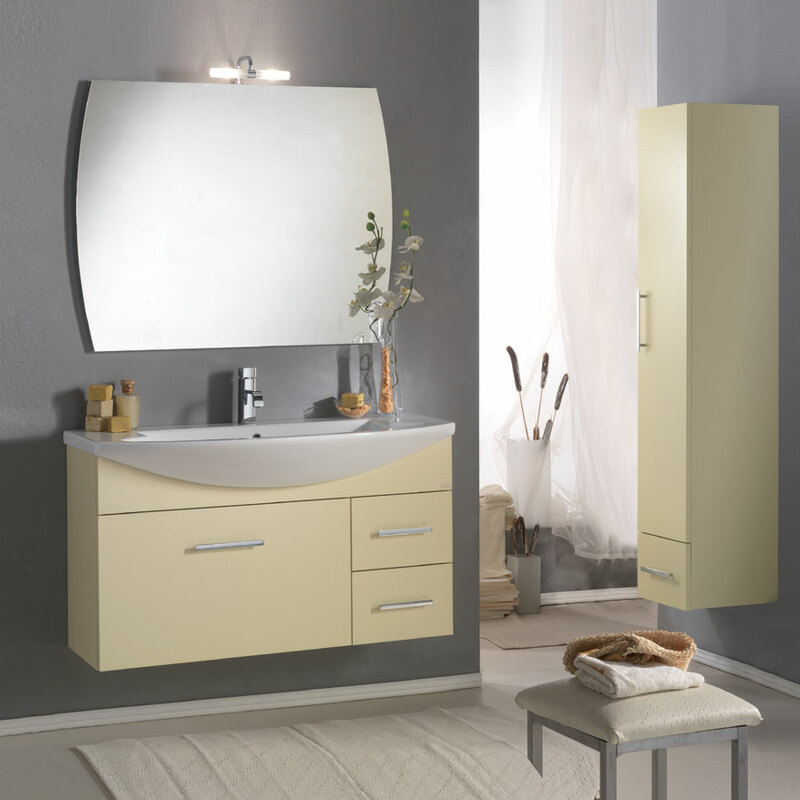 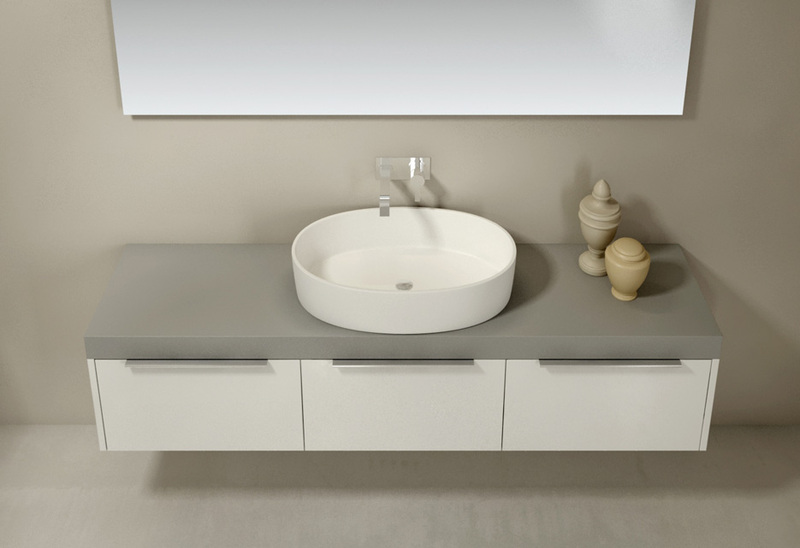 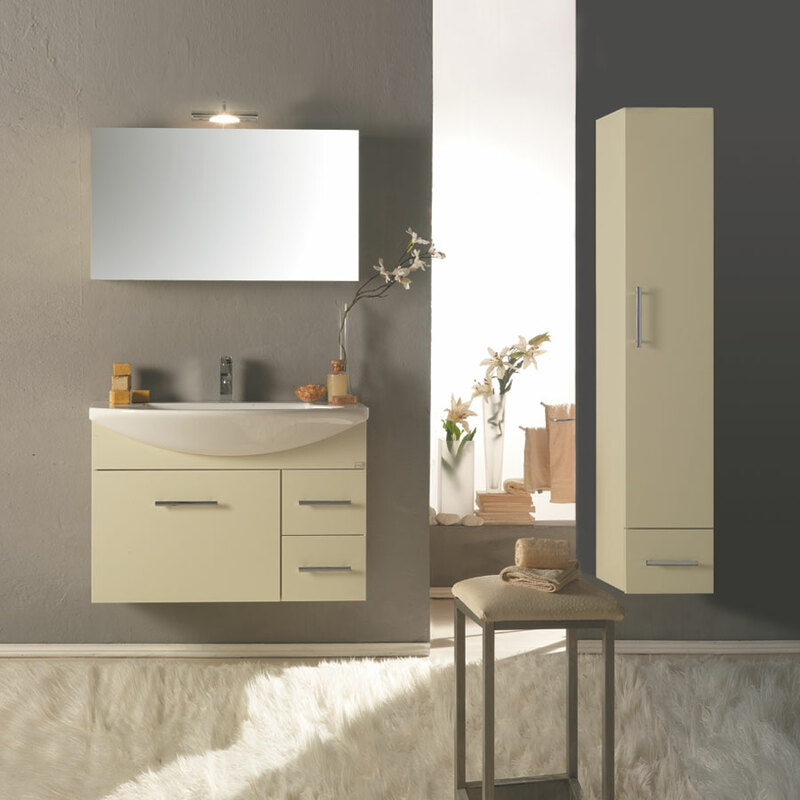 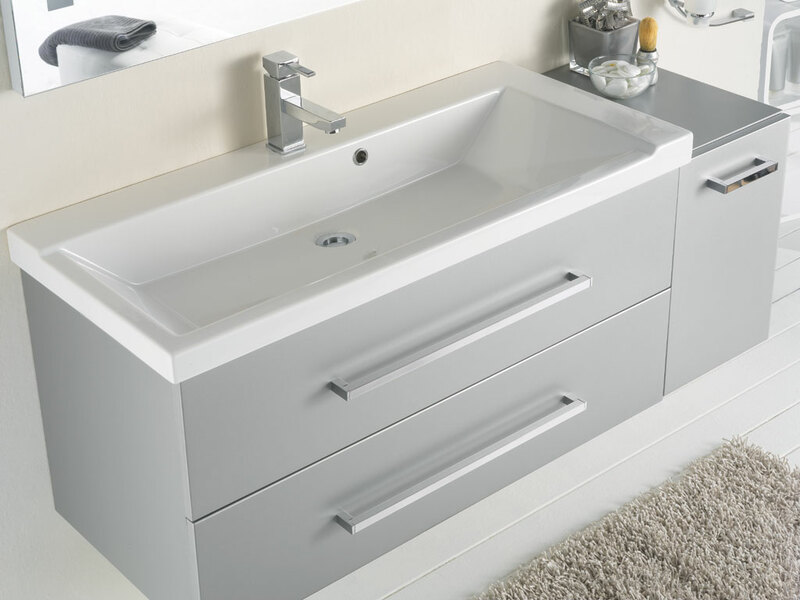 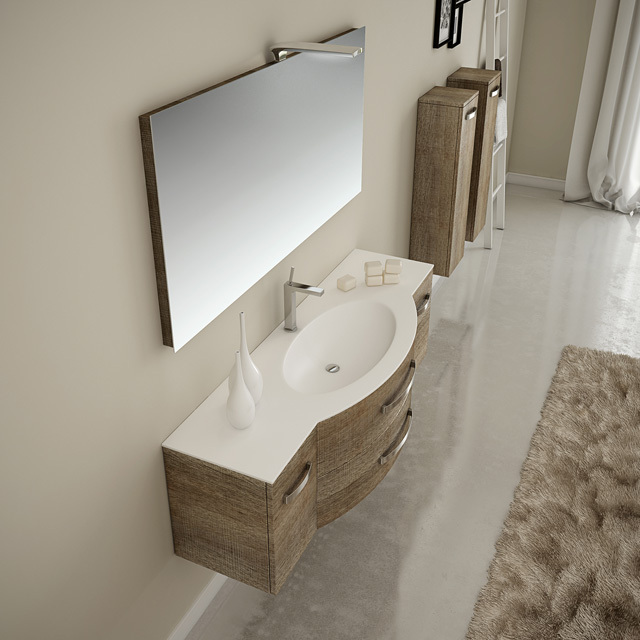 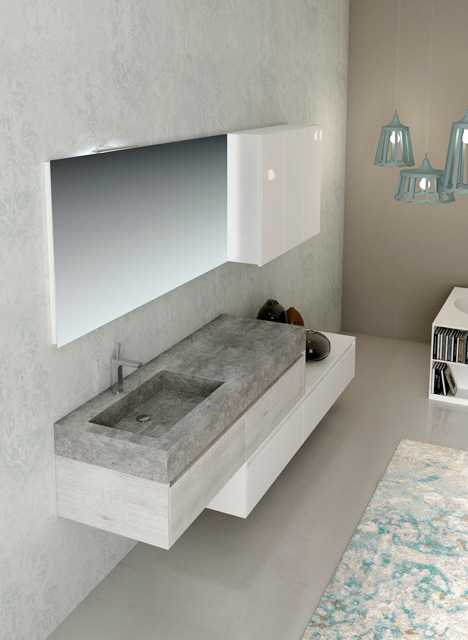 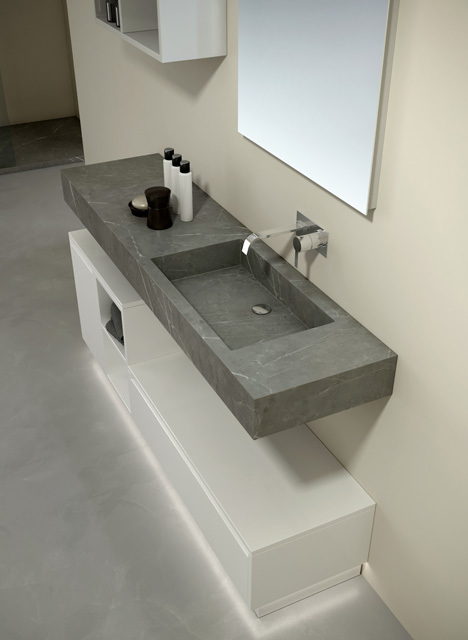 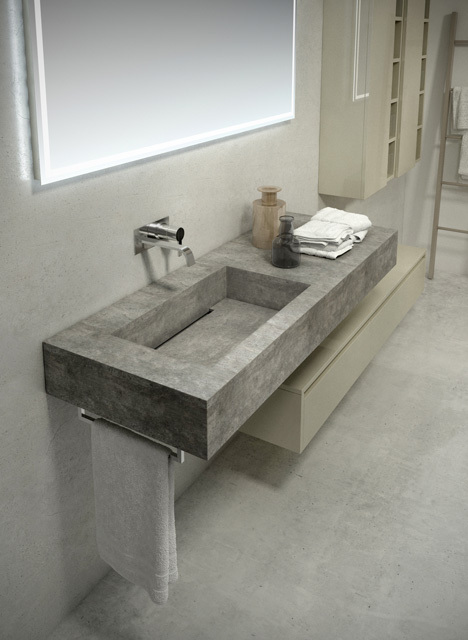 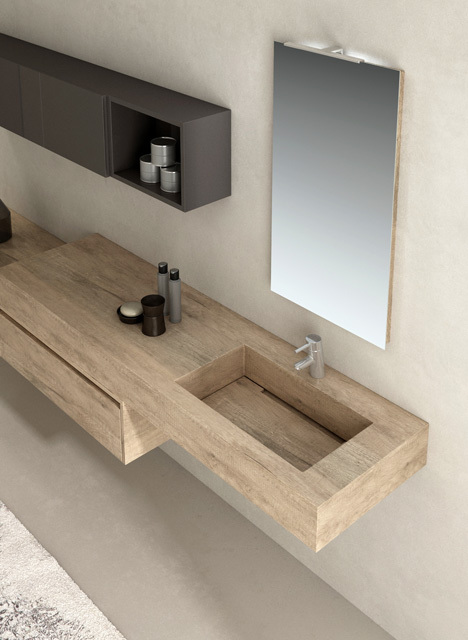 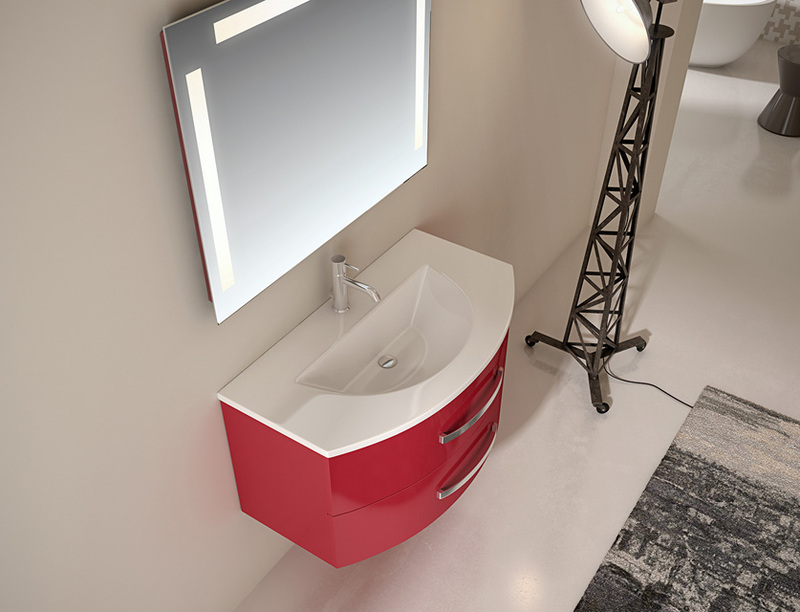 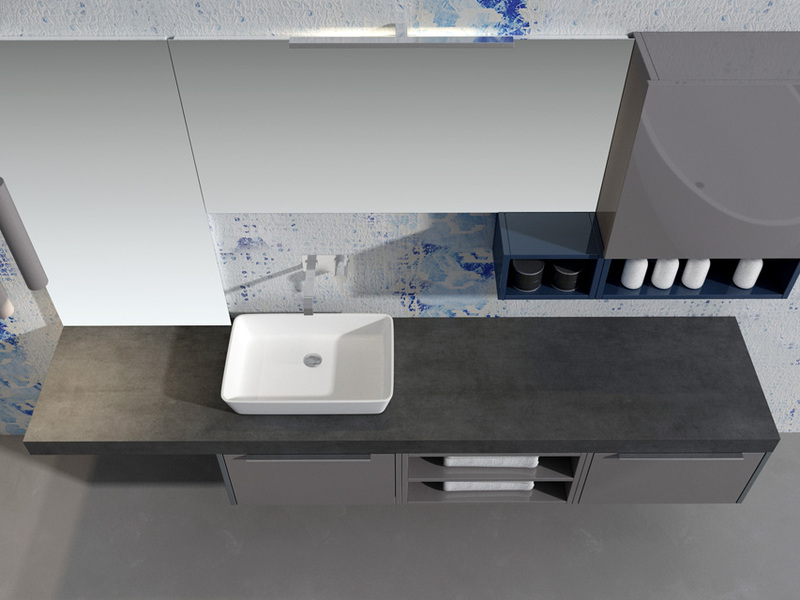 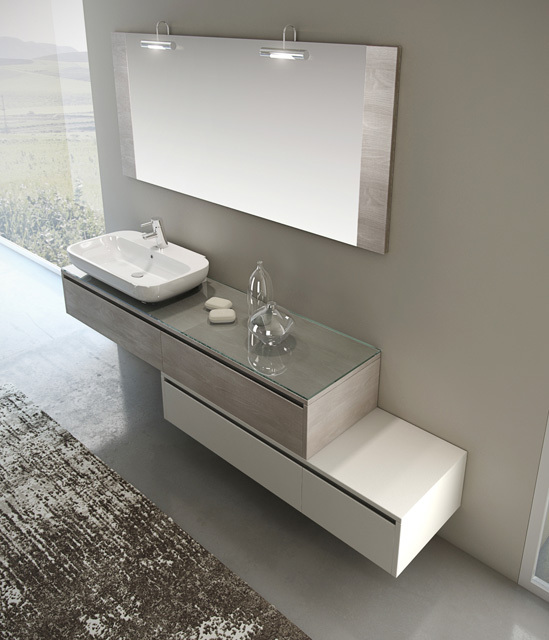 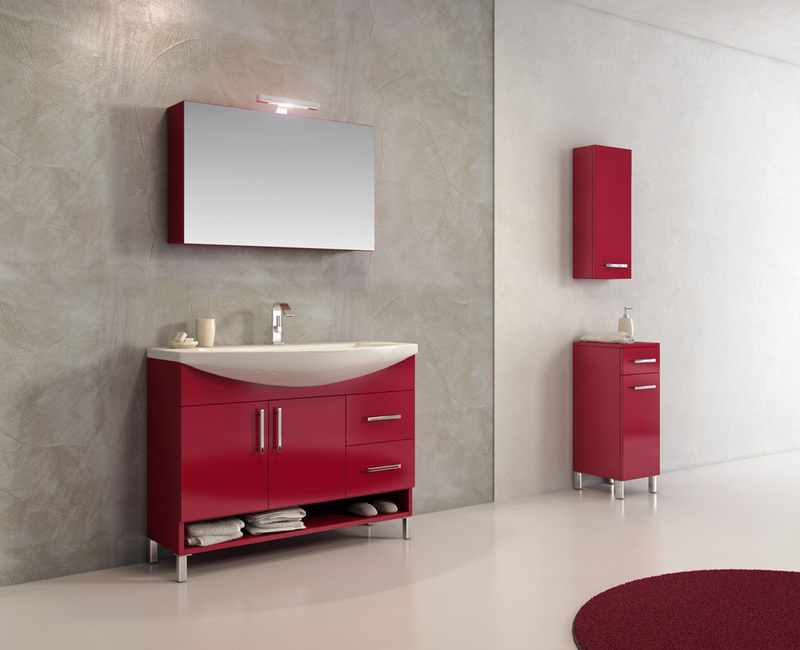 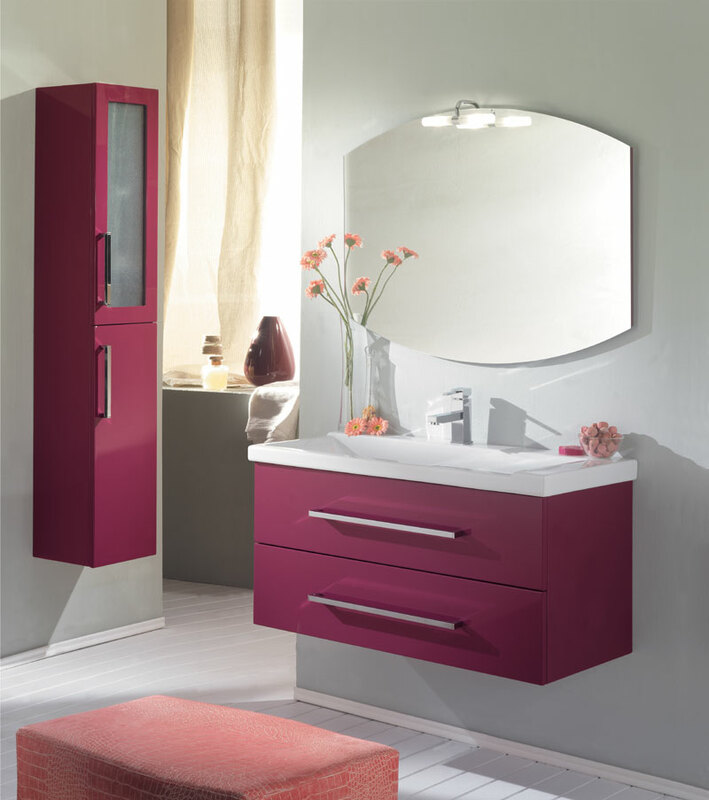 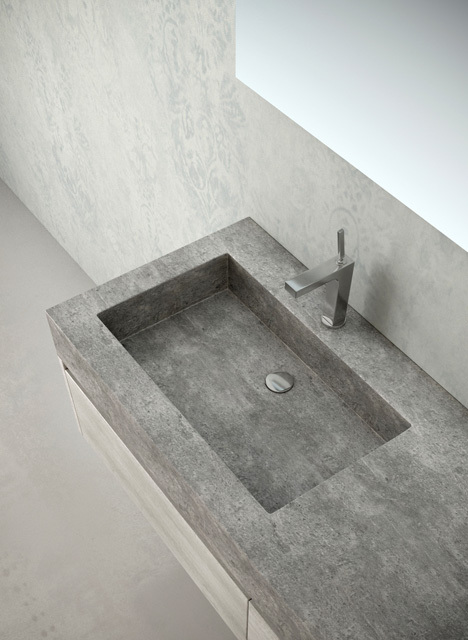 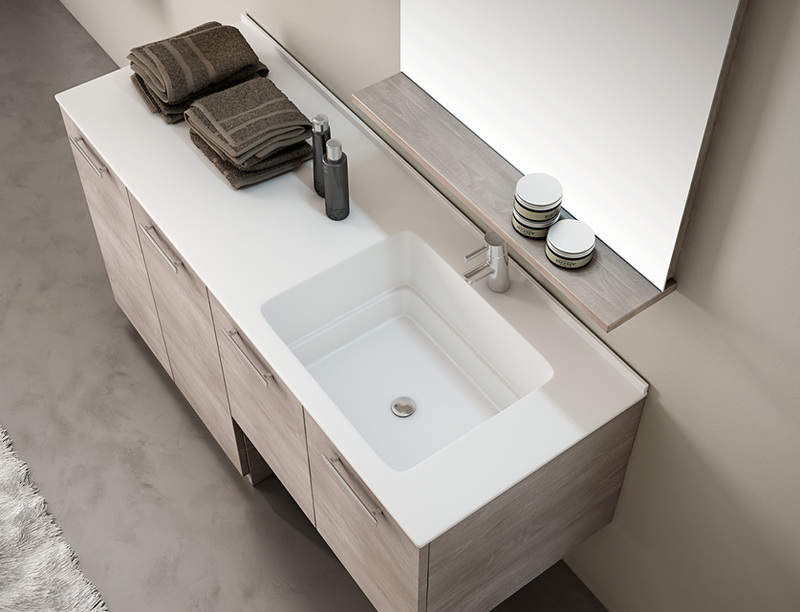 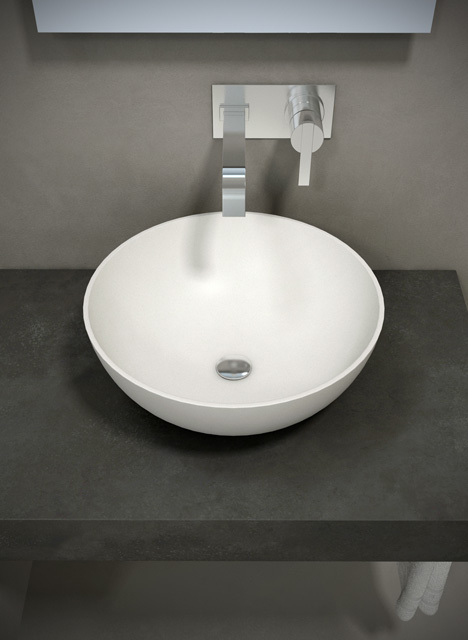 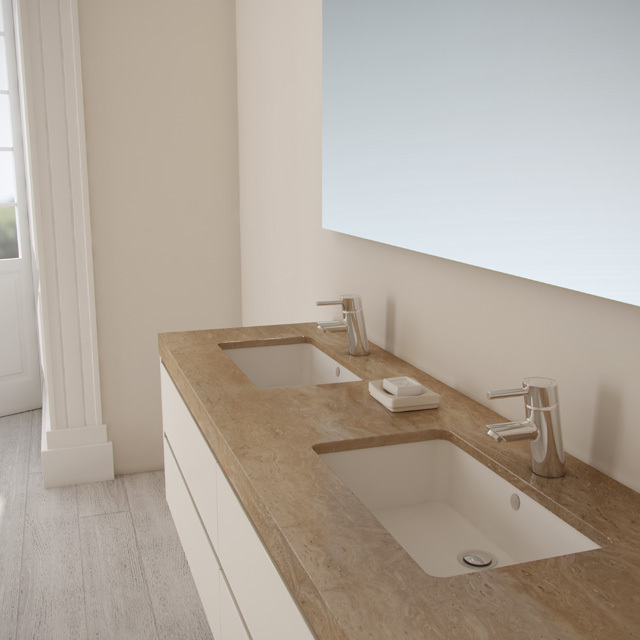 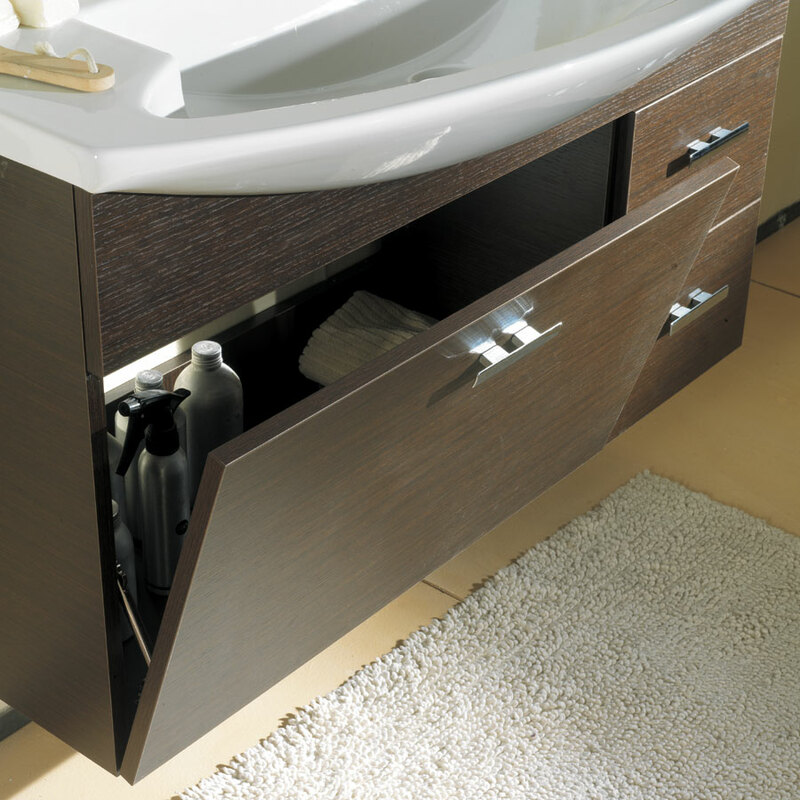 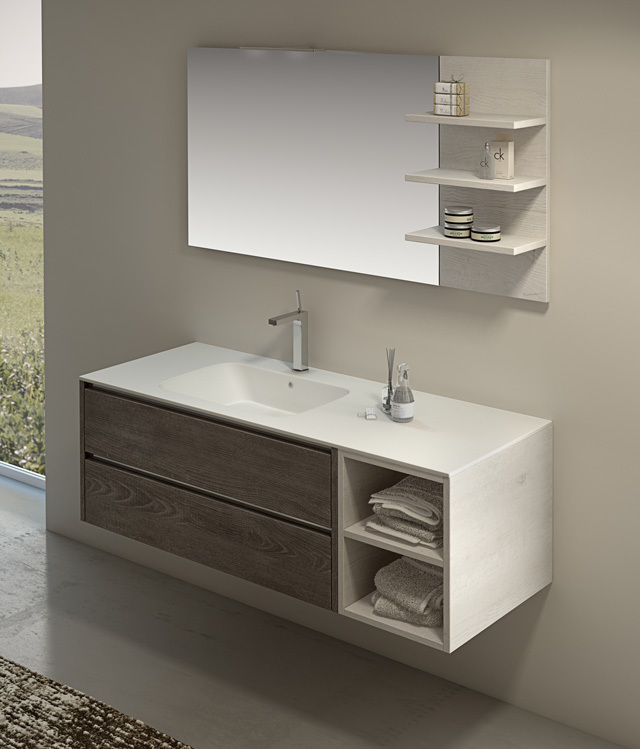 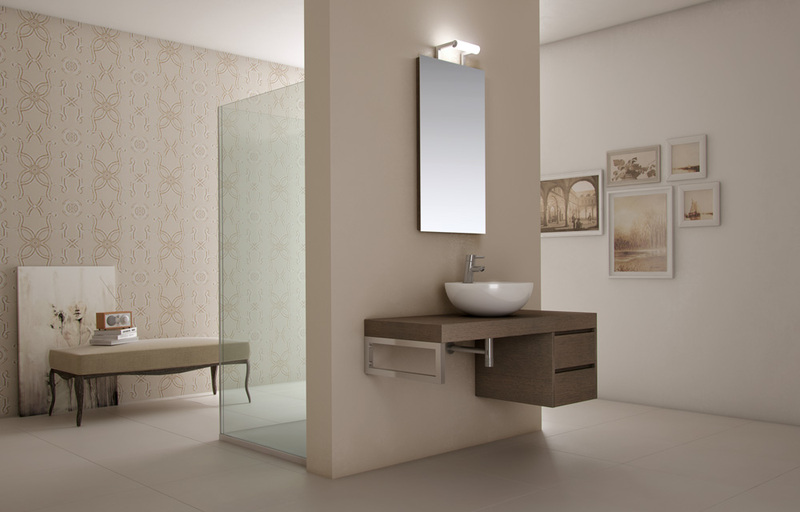 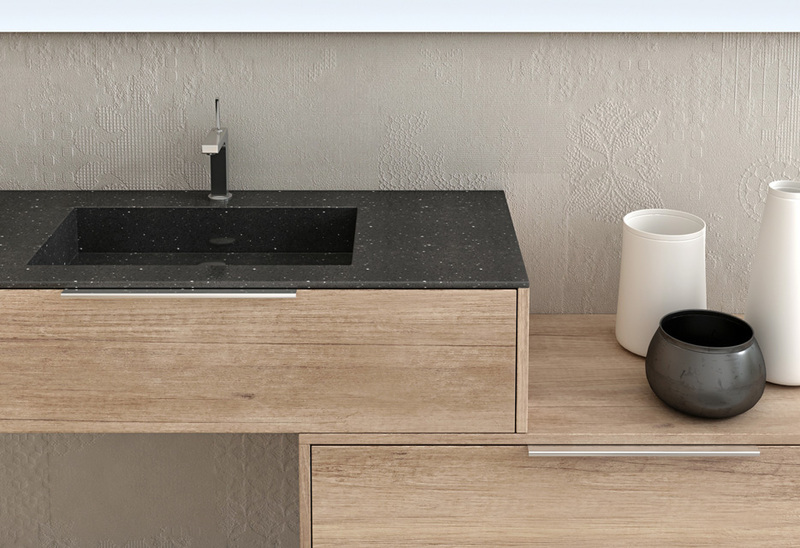 There are many sizes of washbasin units, to satisfy the different needs.